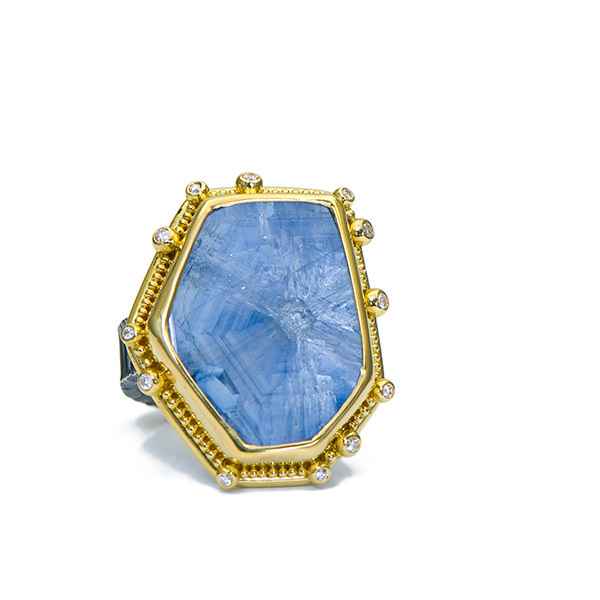 Ring is set with a Yellow Beryl (4.94cts), Blue Diamonds (.15tcw) and Blue Zircons (.20tcw) in granulated 22kt yellow gold with an oxidized sterling silver frame and band. 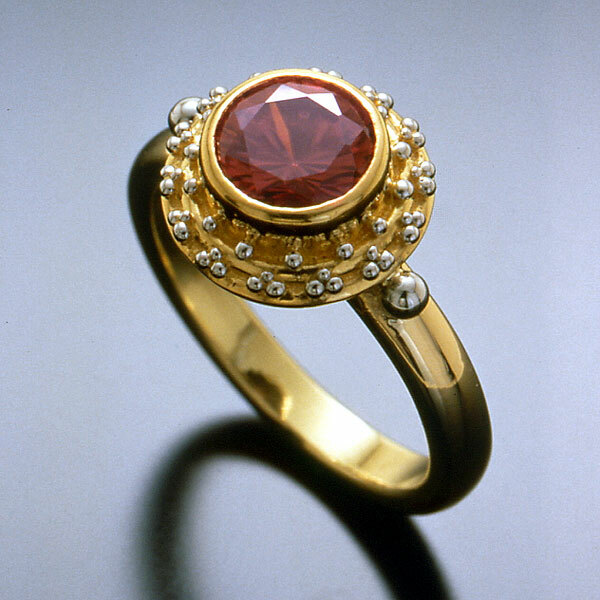 Ring is set with a Padparadscha Sapphire (5.7×7.1m, 1.72cts) and Diamonds (.40tcw) in 22kt yellow gold with platinum and 22kt yellow gold granulation all on a 22kt yellow gold domed band with a hammer finish. 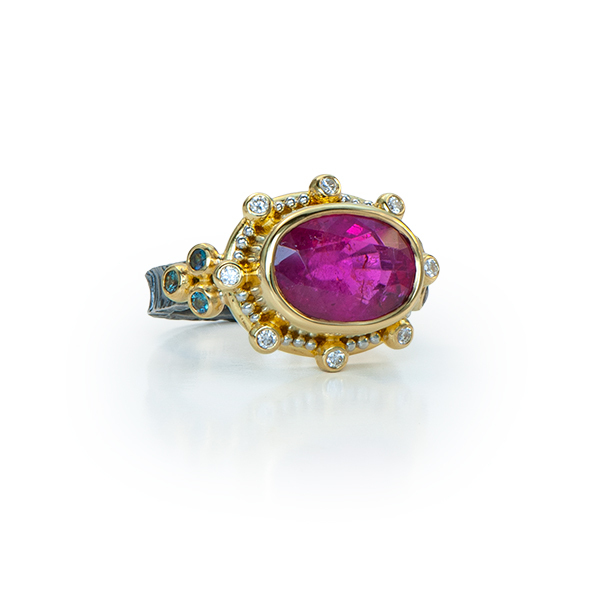 Ring is set with a Rubellite Tourmaline (13×9.5mm, 5.95cts), Alexandrites (.18tcw) and Diamonds (.16tcw) in 22kt yellow gold with platinum granulation and a forged and oxidized sterling silver band, 4mm wide. 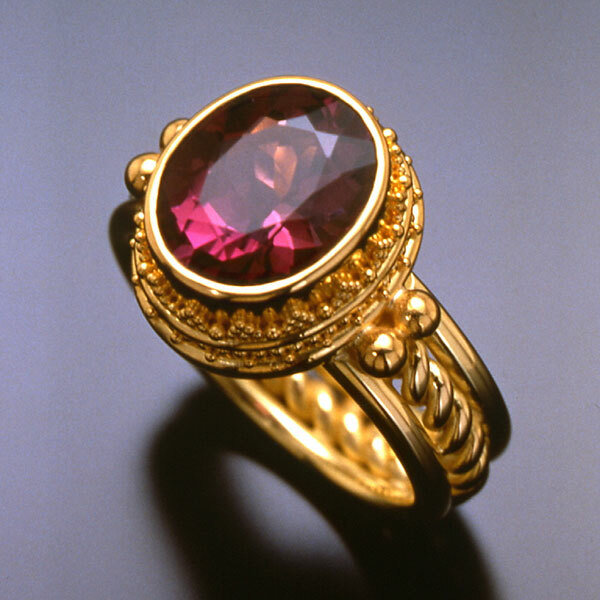 Ring is set with a Red Spinel (1.54cts) and Diamonds (.08tcw) in granulated 22kt yellow gold with an 18kt yellow gold twist band. 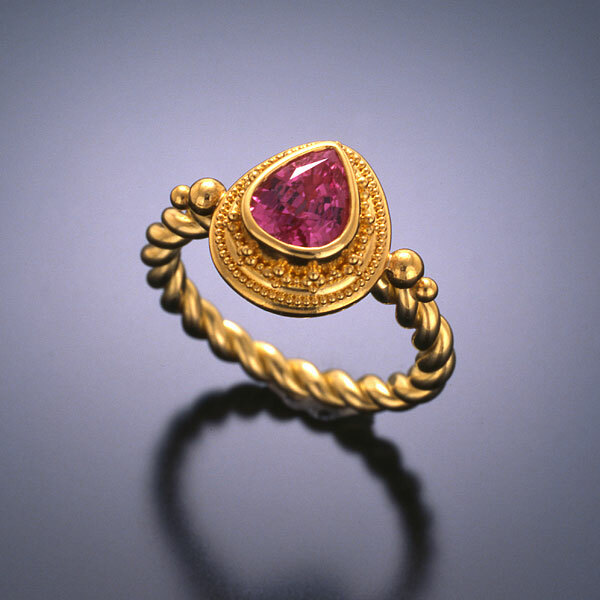 Ring is set with a Cherry Spinel (6×5.5mm, 1.03cts) and Pink Spinels (.18tcw) in granulated 22kt yellow gold with an 18kt yellow gold round band. 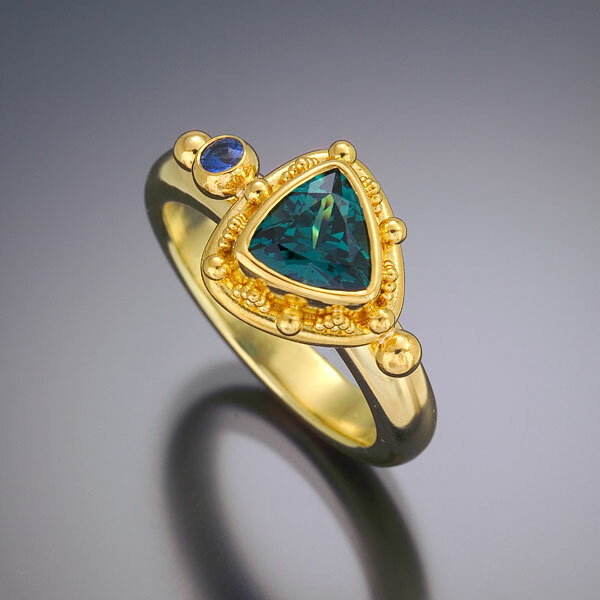 Ring is set with a Peruvian Opal (4.42cts, 10.25mm), a Tsavorite Garnet (.07cts) and Diamonds (.03tcw) in granulated 22kt yellow gold with an 18kt yellow gold band. 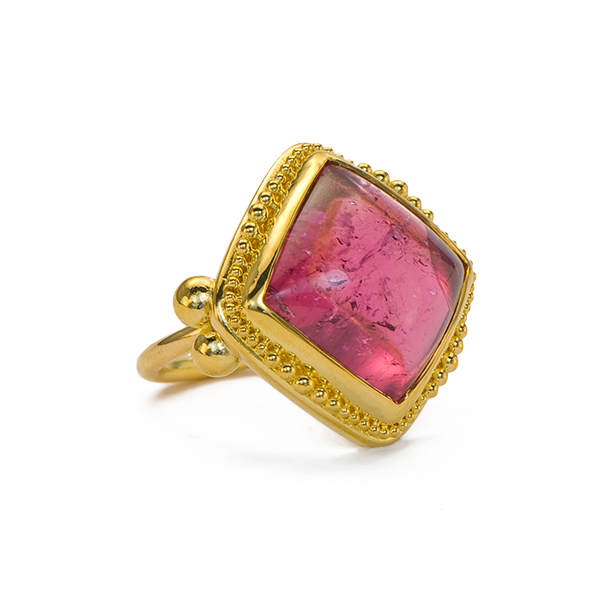 Ring is set with a Pink Tourmaline cabochon (16.89cts, 16mm) in granulated 22kt yellow gold with an 18kt yellow gold band. 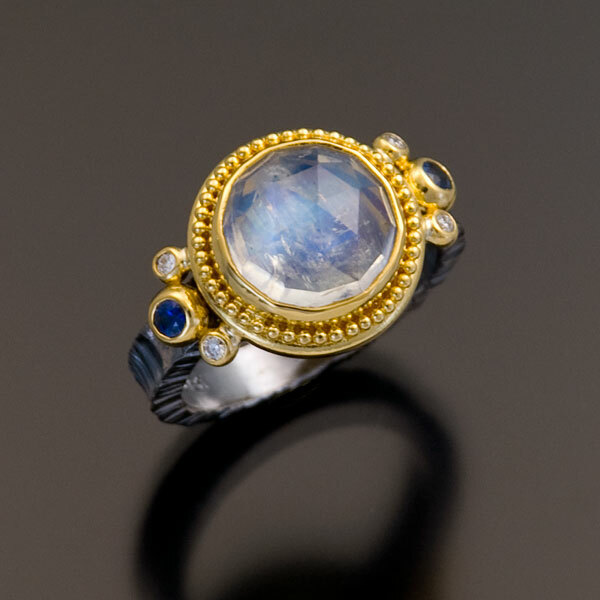 Ring is set with a Moonstone (9x7mm, 2.45cts), Diamonds (.12tcw) and Blue Sapphires (.16tcw) in granulated 22kt yellow gold on a forged and oxidized sterling silver tapered band; taper: 15 to 7.5mm. 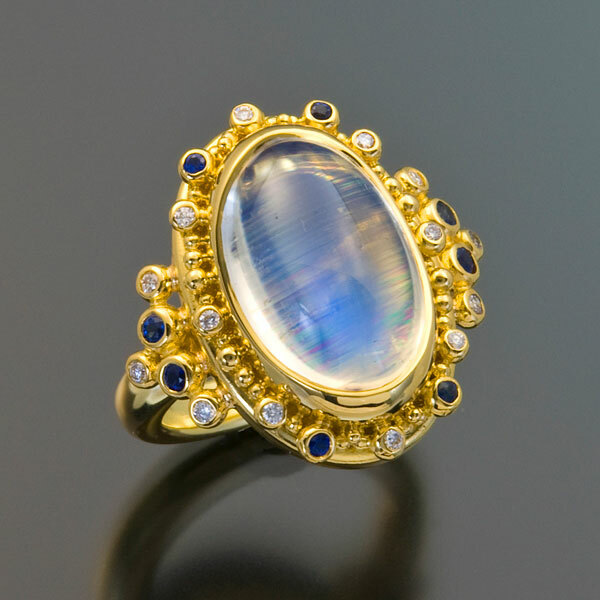 Ring is set with a Moonstone (16.6×11.2mm, 12.65cts), Sapphires (.14tcw) and Diamonds (.06tcw) in granulated 22kt yellow gold on a forged and oxidized sterling silver band, 6mm wide. 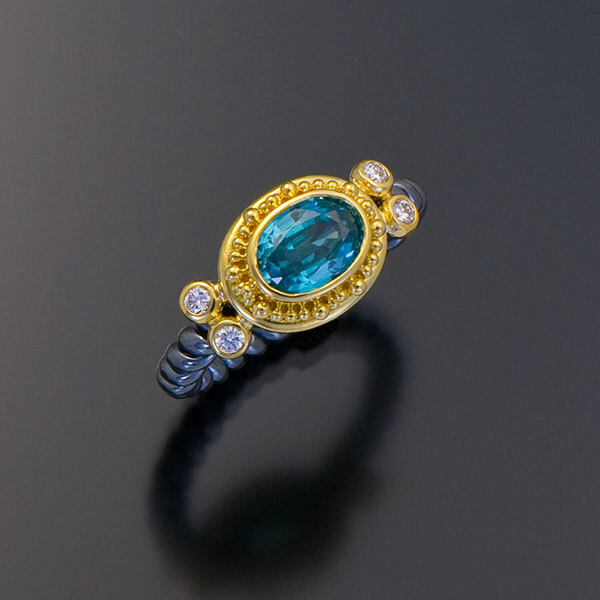 Ring is set with an Indicolite Tourmaline (5.8mm cushion, 1.01cts) and Diamonds (.09tcw) in granulated 22kt yellow gold on an 18kt yellow gold round band. 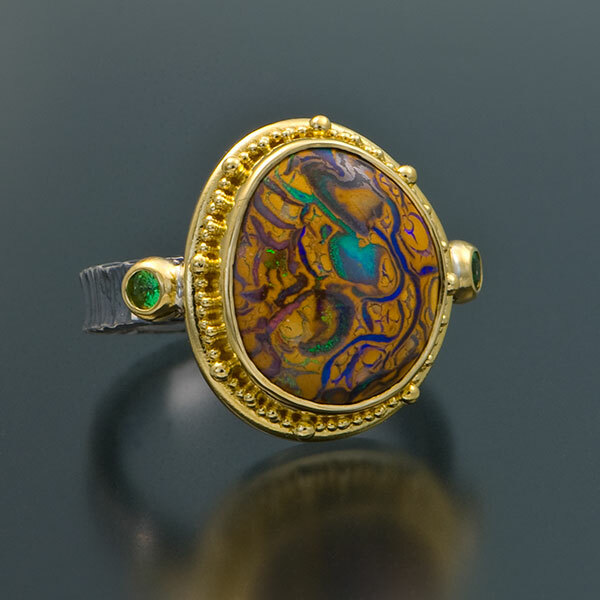 Ring is set with an Australian Yowah Boulder Opal (5.76cts) and Tsavorite Garnets (.14tcw) in granulated 22kt yellow gold with a forged and oxidized sterling silver band, 4mm wide. 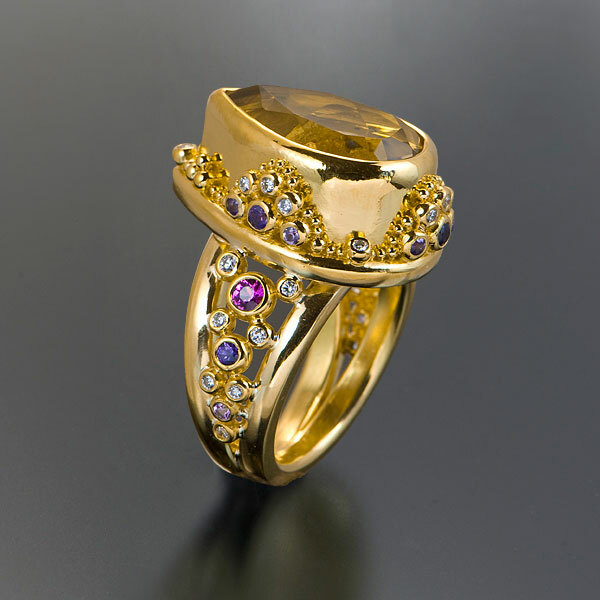 Ring is set with a Mozambique Purple Garnet (6.7×6.3mm, 1.51cts) and Diamonds (.12tcw) in granulated 22kt yellow gold on an 18kt yellow gold round band. 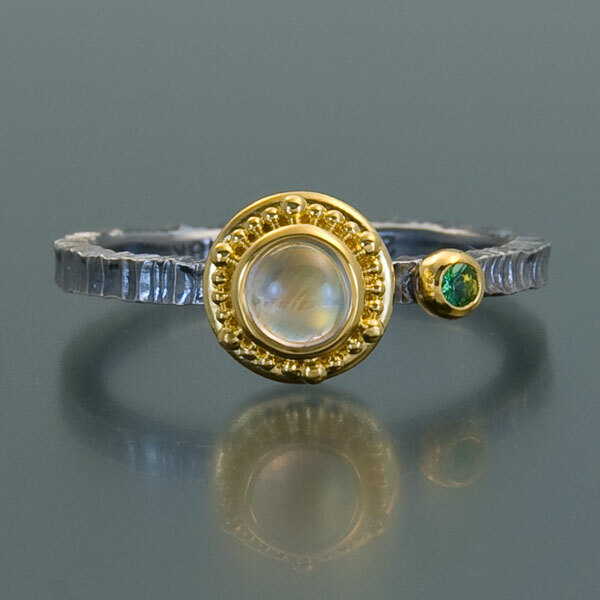 Ring is set with a Rose-cut Moonstone (8mm, 2.18cts) and Mint Green Tourmalines (.16tcw) in granulated 22kt yellow gold on an oxidized sterling silver twist band. 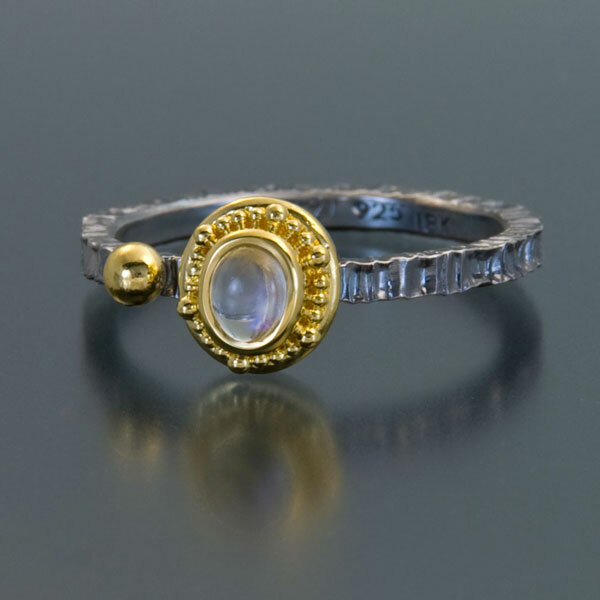 Ring is set with a Rose-cut Moonstone (11mm, 7.15cts) and Diamonds (.04tcw) in granulated 22kt yellow gold on an opposed double twist split band in oxidized sterling silver. 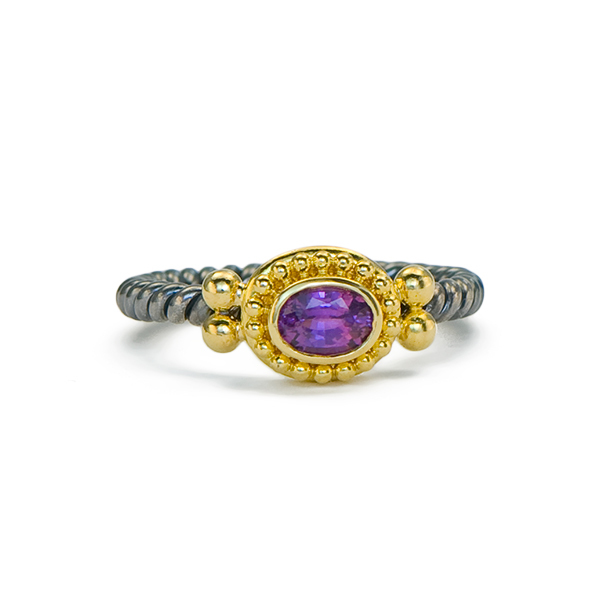 Ring is set with an Amethyst (1.4cts) in granulated 22kt yellow gold with an oxidized sterling silver twist band. 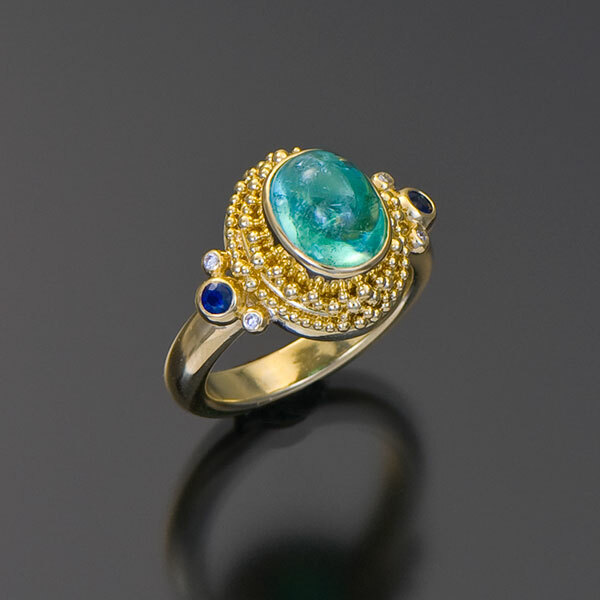 Ring is set with a Tanzanite (1.05cts), a Mint Green Tourmaline (.07cts) and Teal Diamonds (.03tcw) in granulated 22kt yellow gold with an 18kt yellow gold band. 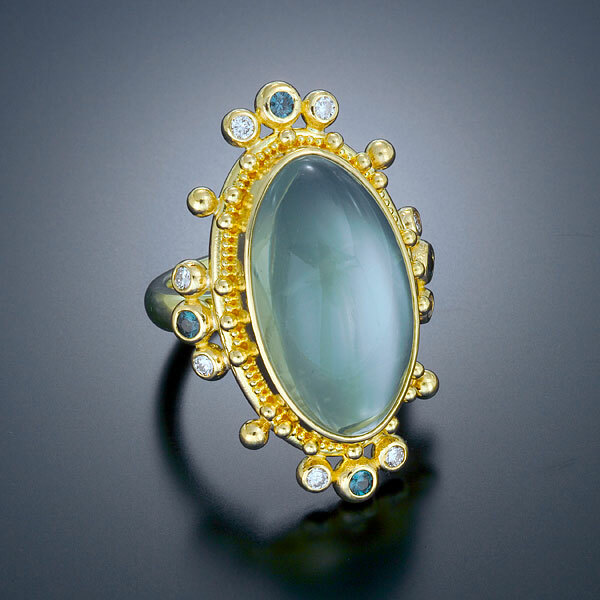 Ring is set with a Carved Aquamarine Cabochon (11.44×15.48mm, 8.82cts), Purple Sapphires (.14tcw) and Diamonds (.06tcw) in granulated 22kt yellow gold with a forged and oxidized sterling silver band, 4mm wide. 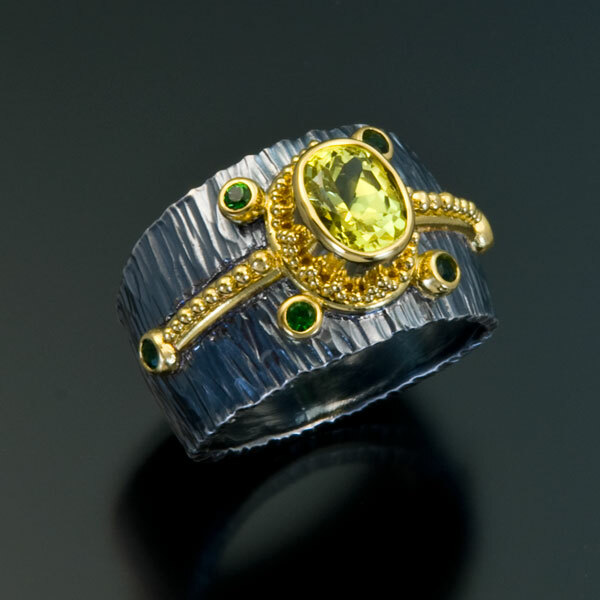 Ring is set with a Green Zircon (12.2×10.2mm, 5.9cts) in granulated 22kt yellow gold on a double split twist band. 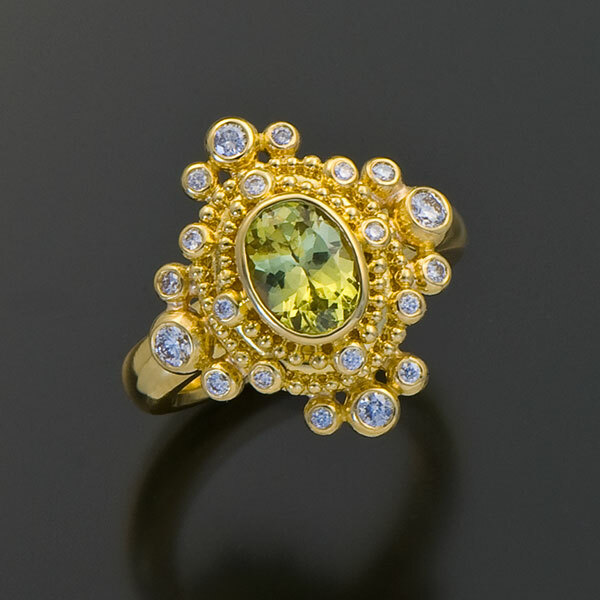 Ring is set with a Yellow Diamond (1.91cts) and White Diamonds (.14tcw) in 22kt yellow gold on a granulated 22kt yellow gold and 18kt yellow gold band. 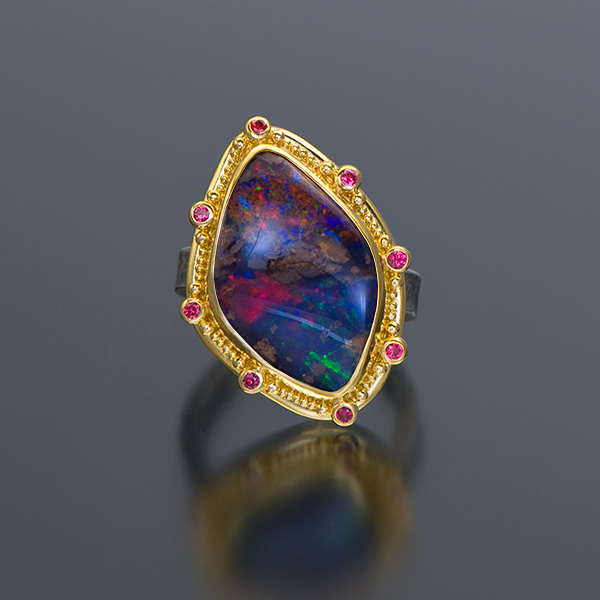 Ring is set with an Australian Boulder Opal (11.92cts) and Red Spinels (16tcw) in granulated 22kt yellow gold on an oxidized sterling silver band, 4mm wide. 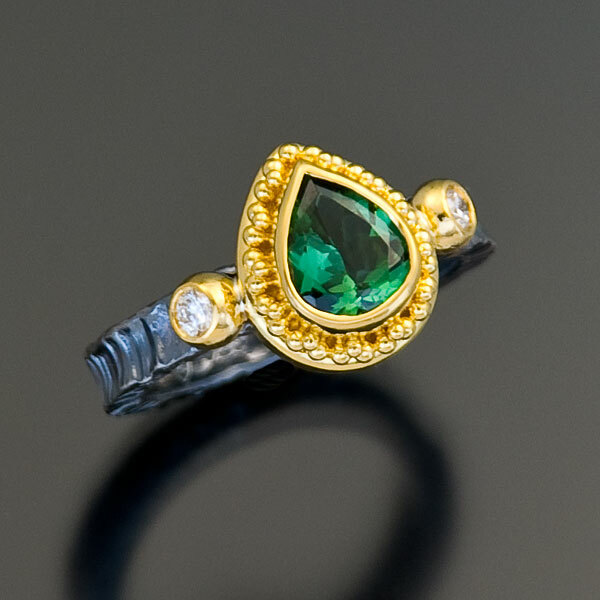 Ring is set with a Blue Zircon (4.9×6.9mm, 1.75cts), Tsavorite Garnets (.14tcw) and Diamonds (.03tcw) in granulated 22kt yellow gold with a forged and oxidized sterling silver band, 4mm wide. 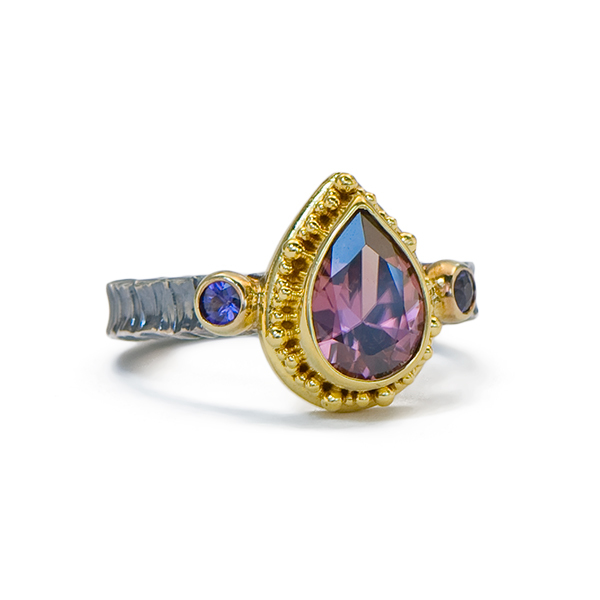 Ring is set with a Purple Sapphire (6.5mmx4.57mm, .81cts) and Hot Pink Sapphires (.16tcw) in granulated 22kt yellow gold on a forged and oxidized sterling silver band, 4mm wide. 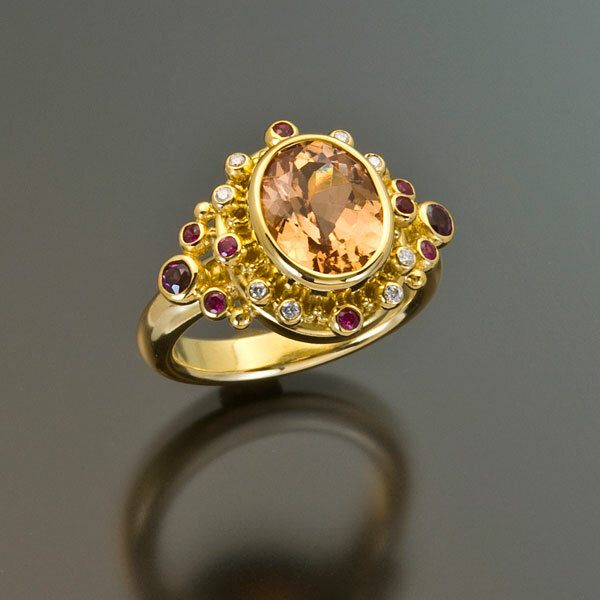 Ring is set with a Rose Zircon (8.28cts), Pink Sapphires (.32tcw) and Diamonds (.06tcw) in granulated 22kt yellow gold with a granulated 22kt yellow gold band. 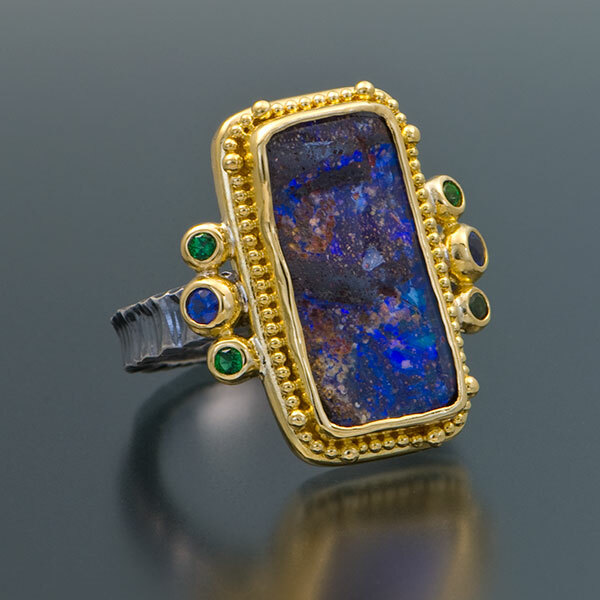 Ring is set with an Australian Yowah Nut Boulder Opal (3.2cts, 11.6x10mm) and Diamonds (.10tcw) in granulated 22kt yellow gold with a forged and oxidized sterling silver band, 4mm wide. 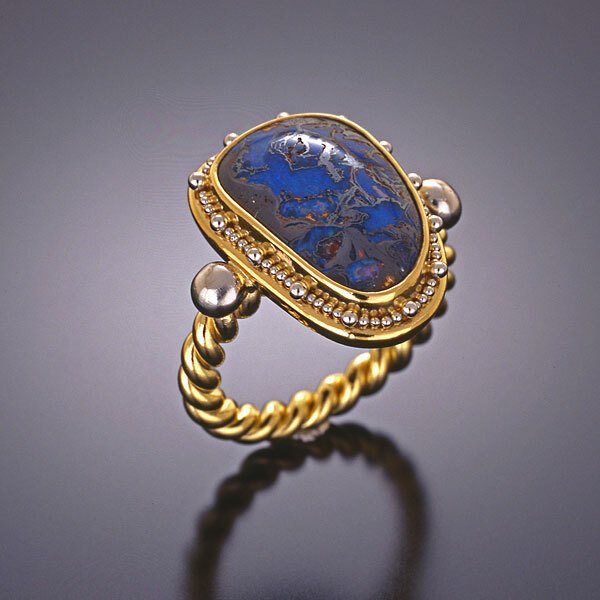 Ring is set with an Australian Boulder Opal (3.78cts, 20×6.8mm), Blue Sapphires (.14tcw) and Diamonds (.06tcw) in granulated 22kt yellow gold on a forged and oxidized sterling silver band, 4mm wide. 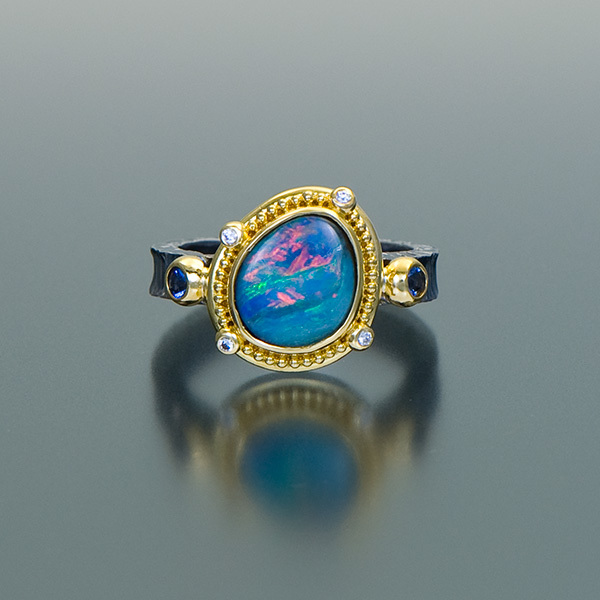 Ring is set with an Australian Boulder Opal (10.3×15.75mm, 6.24cts) in granulated 22kt yellow gold with a forged and oxidized sterling silver band, 4mm wide. 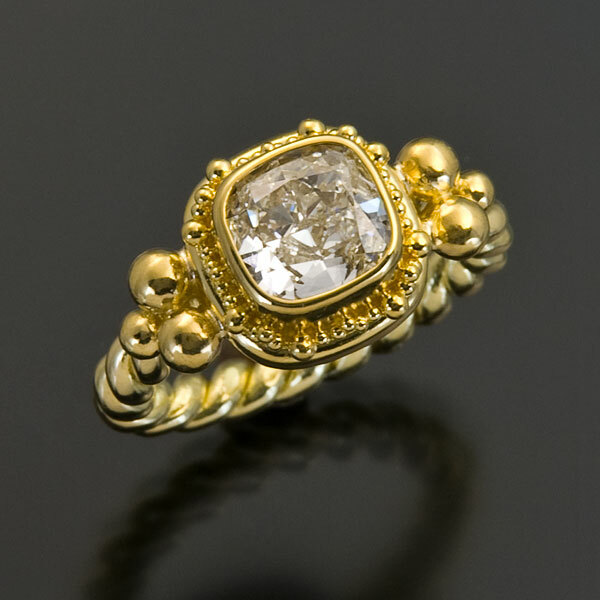 Ring is set with a cushion-cut Diamond (1.09cts, VVS1/L with GIA cert.) 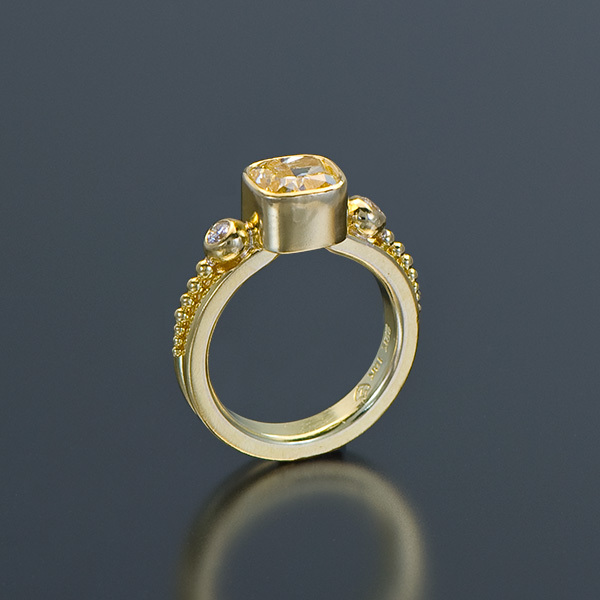 in granulated 22kt yellow gold with an 18kt yellow gold twist band. 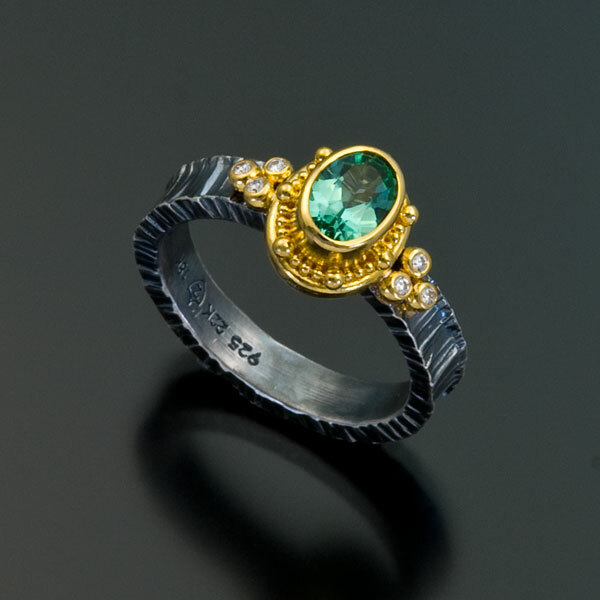 Ring is set with a Mint Green Tourmaline (5x7mm, .80cts) and Diamonds (.17tcw) in granulated 22kt yellow gold on a forged and oxidized sterling silver band, 4mm wide. 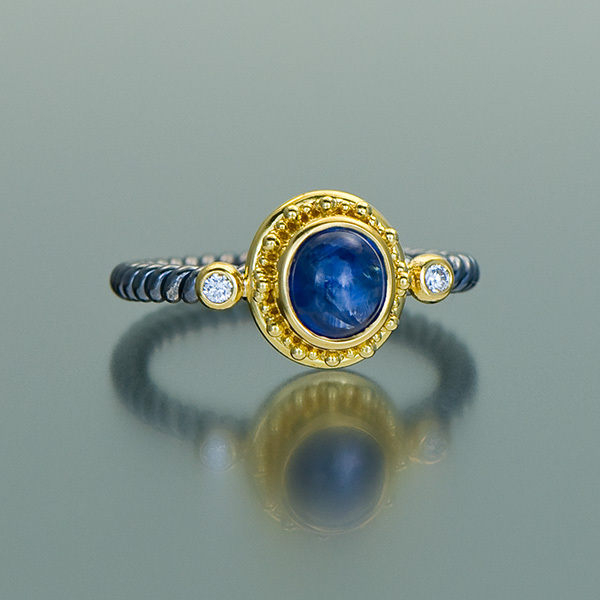 Ring is set with a Rose-cut Zawadi Sapphire (7mm, 2.14cts) in granulated 22kt yellow gold on an oxidized sterling silver twist band. 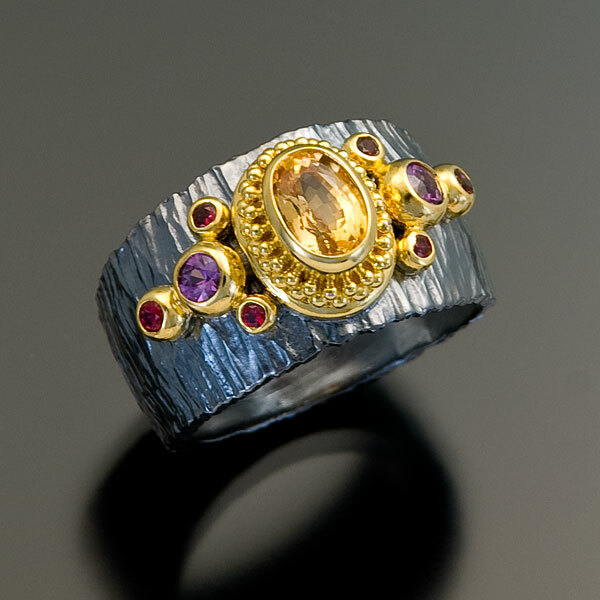 Ring is set with a Cuprian Tourmaline (17.8x14mm, 6.44cts) and Diamonds (.06tcw) in granulated 22kt yellow gold with an 18kt yellow gold twist band. 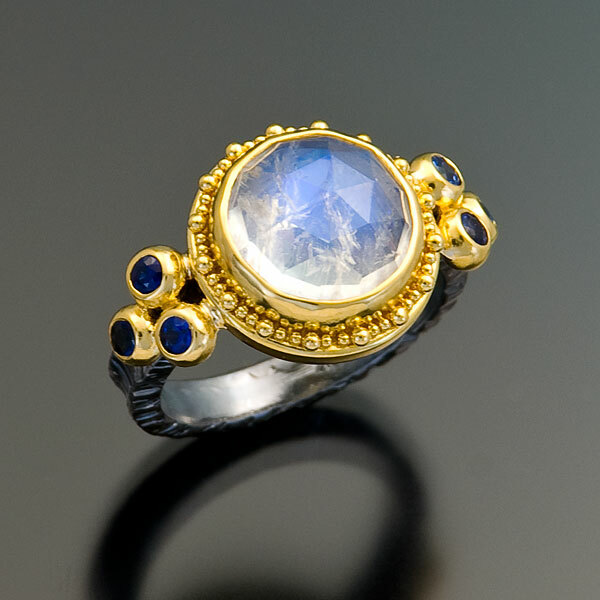 Ring is set with a Rose-cut Moonstone (10mm, 5.1cts) and Blue Sapphires (.42tcw) in granulated 22kt yellow gold on a forged and oxidized sterling silver band, 4mm wide. 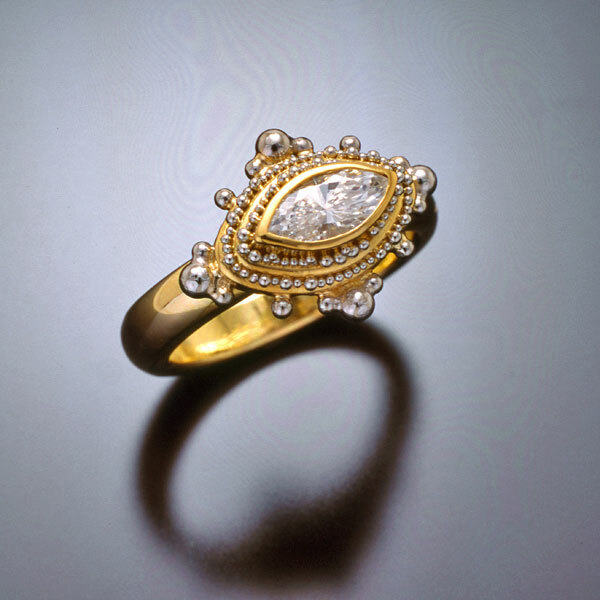 Ring is set with a Danburite and Diamonds in granulated 22kt yellow gold with an 18kt yellow gold band. 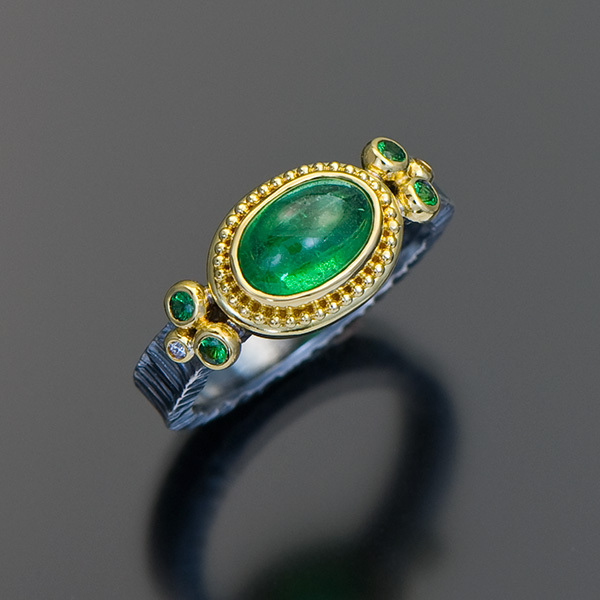 Ring is set with a Tsavorite Garnet cabochon (9.5×6.2mm, 2.15cts), Tsavorite Garnets (.20tcw) and Diamonds (.02tcw) in granulated 22kt yellow gold on a forged and oxidized sterling silver band, 4mm wide. 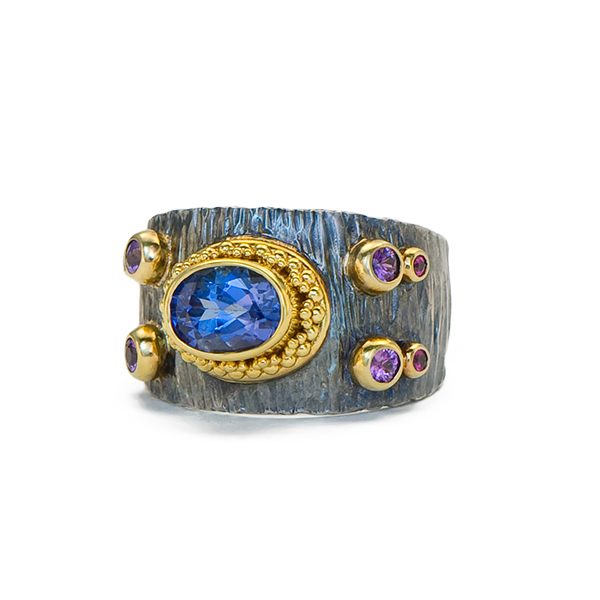 Ring is set with a Blue Zircon (4.7×5.6mm, 1.02cts), Purple Sapphires (.14tcw) and Diamonds (.03tcw) in granulated 22kt yellow gold on a forged and oxidized sterling silver band, 4mm wide. 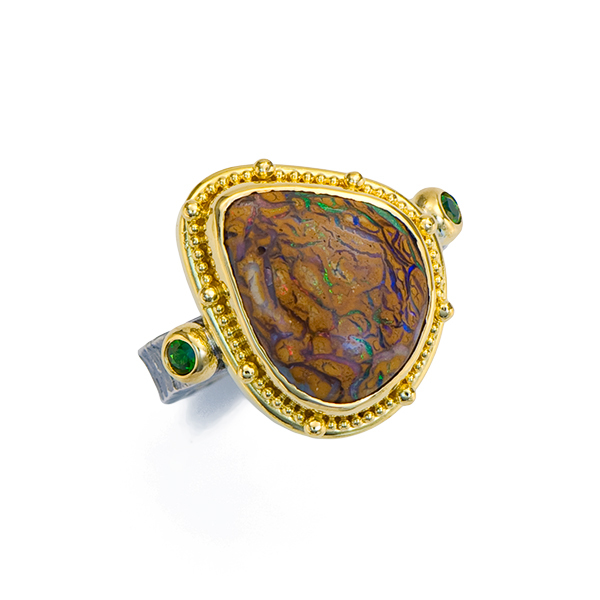 Ring is set with a Boulder Opal (12.75×8.2mm, 3.33cts), Tsavorite Garnets (.14tcw) and Diamonds (.06tcw) in granulated 22kt yellow gold on a forged and oxidized sterling silver band, 4mm wide. 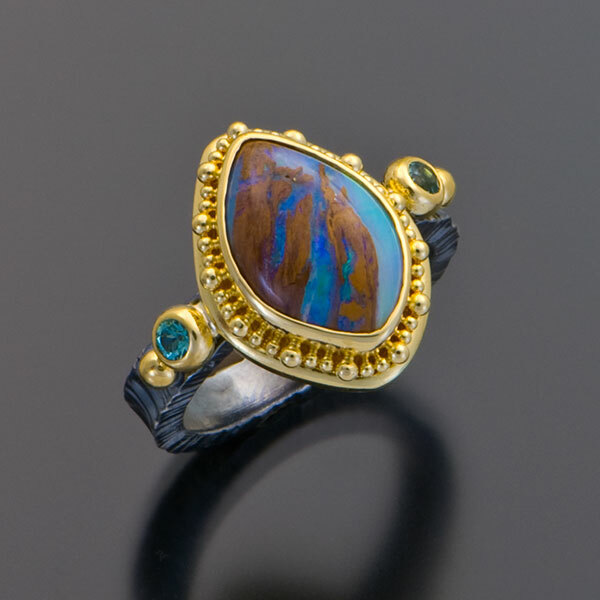 Ring is set with a Boulder Opal (21x9mm, 4.62cts) and Diamonds (.14tcw) in granulated 22kt yellow gold on a forged and oxidized sterling silver band, 4mm wide. 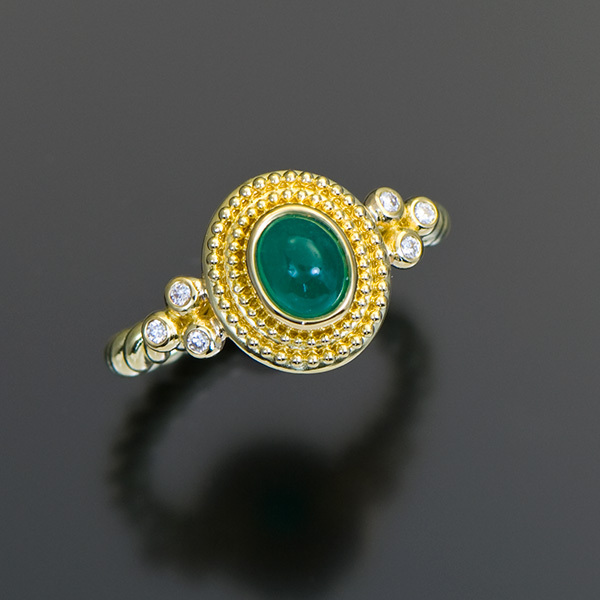 Ring is set with an Emerald cabochon (6.7×5.5mm, 1.08cts) and Diamonds (.09tcw) in granulated 22kt yellow gold with an 18kt yellow gold twist band. 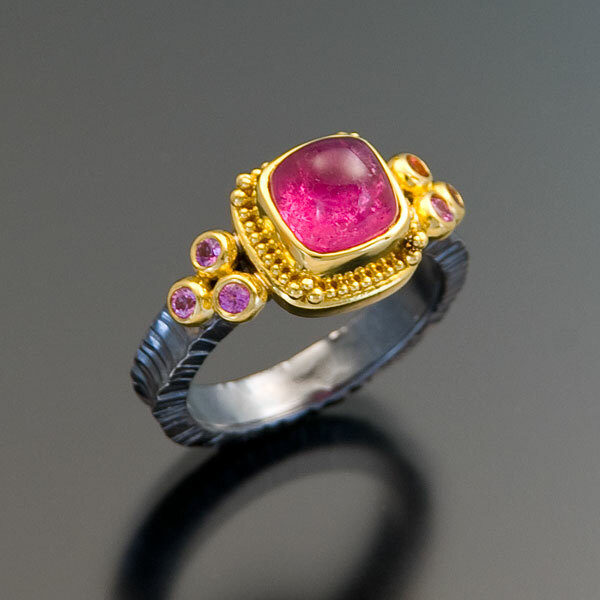 Ring is set with a Madagascar Ruby (unheated, 6.2×4.7mm, .60cts) and Hot Pink Sapphires (.08tcw) in granulated 22kt yellow gold on a forged and oxidized sterling silver band. 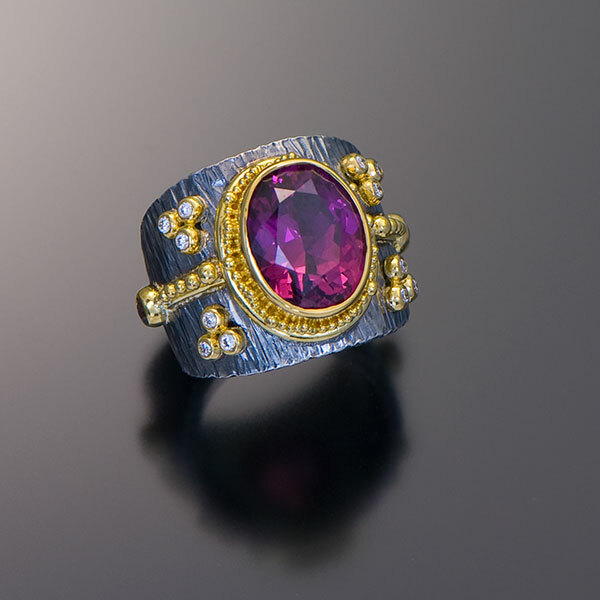 Ring is set with a Magenta Sapphire (5.8×4.2mm, .52cts) in granulated 22kt yellow gold on an oxidized sterling twist band. 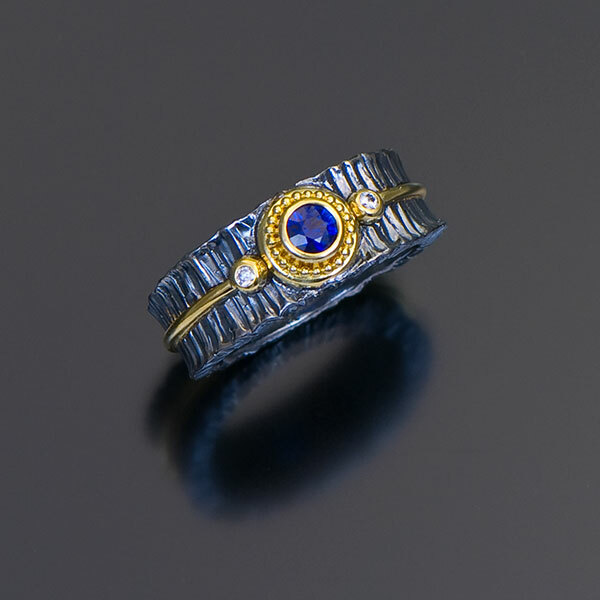 Ring is set with a Blue Sapphire cabochon (6.6×7.35mm, 1.85cts) and Diamonds (.08tcw) in granulated 22kt yellow gold on an oxidized sterling silver twist band. 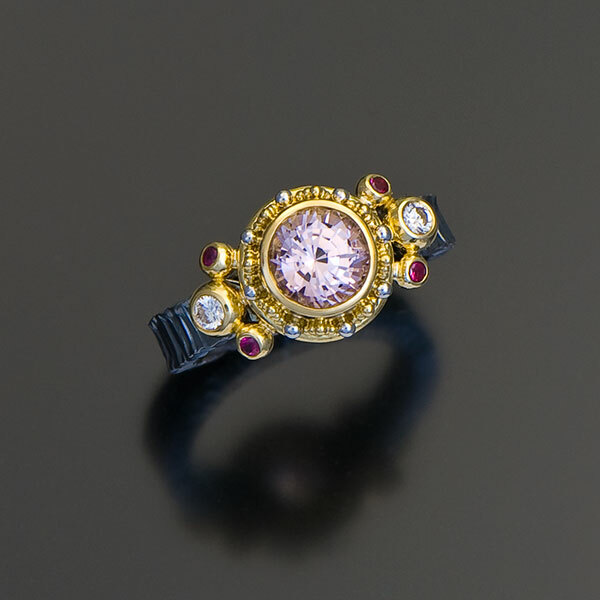 Ring is set with an Andradite Garnet Crystal cluster (17x22mm) and Hot Pink Sapphires (.19tcw) in 22kt yellow gold with a forged and oxidized sterling silver frame and 4mm wide band, 1.25″ L x .75″ W.
Ring is set with a Zawadi rose-cut Sapphire (7mm, 1.85cts) in granulated 22kt yellow gold on a hammered, oxidized sterling silver band tapering from 13.8mm to 7.5mm wide. 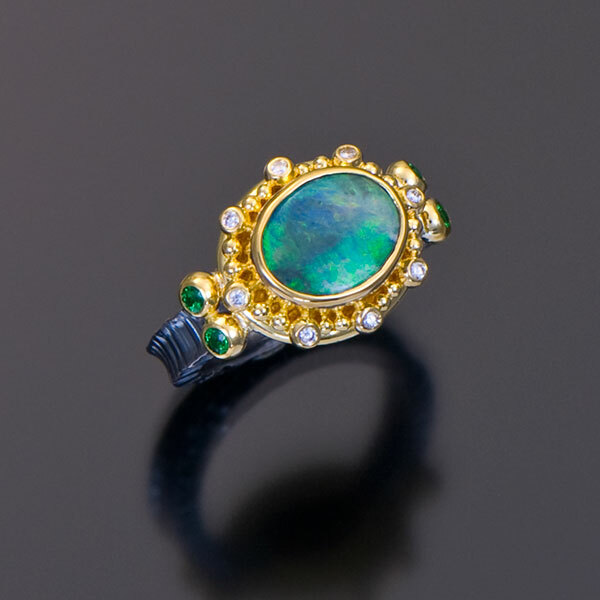 Ring is set with an Australian Boulder Opal (12.85 x 8mm, 2.9cts), Tsavorite Garnets (.10tcw) and Teal Diamonds (.04tcw) in granulated 22kt yellow gold on a forged and oxidized sterling silver band, 4mm wide. 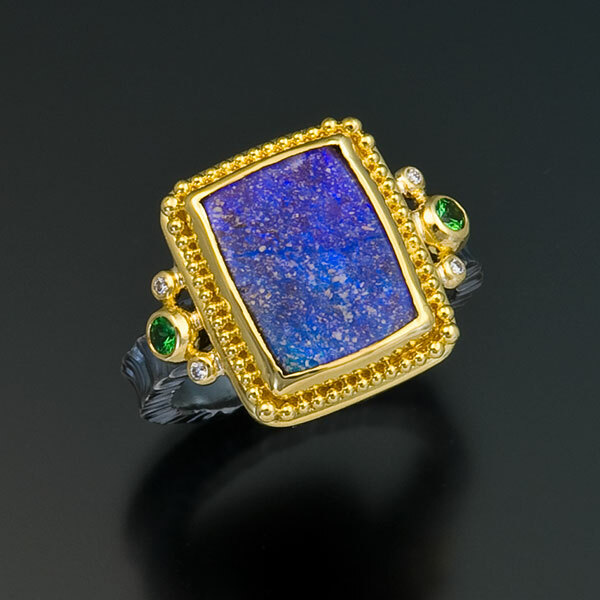 Ring is set with an Australian Boulder Opal (10.75 x 9.38mm, 3.29cts), Blue Sapphires (.14tcw) and Diamonds (.04tcw) in granulated 22kt yellow gold on a forged and oxidized sterling silver band, 4mm wide. 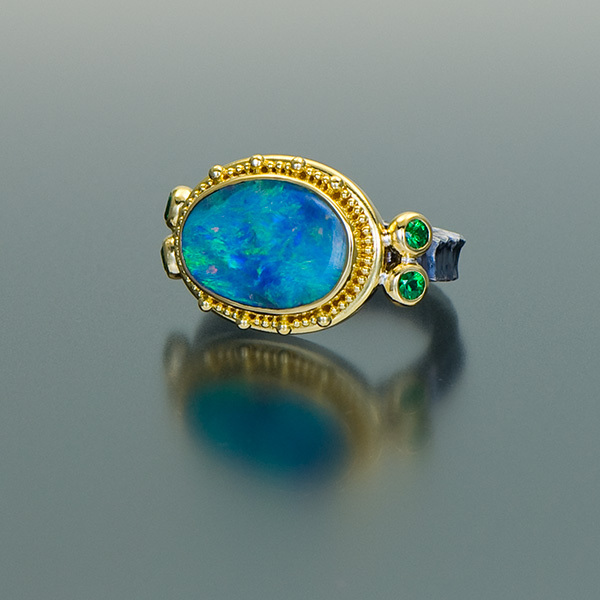 Ring is set with an Australian Boulder Opal (15.25 x 11mm, 4.29cts) and Tsavorite Garnets (.28tcw) in granulated 22kt yellow gold on a forged and oxidized sterling silver band, 4mm wide. 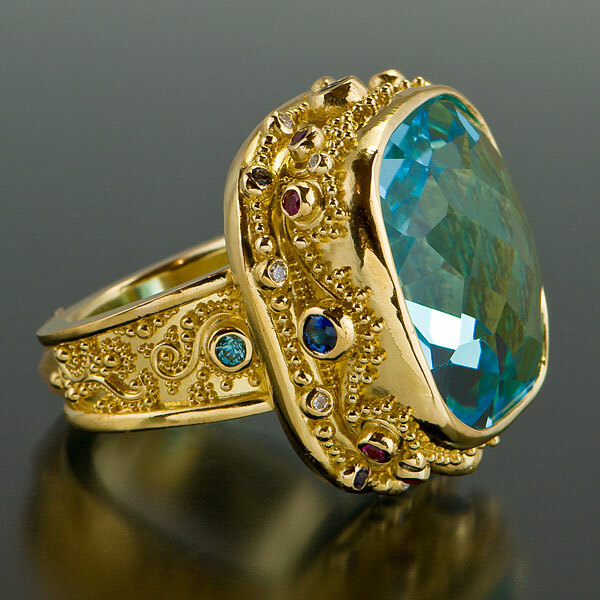 Ring is set with an Indicolite Tourmaline (1.06cts), Mint Green Tourmalines (.28tcw) and Diamonds (.28tcw) in granulated 22kt yellow gold on an 18kt yellow gold twist band. 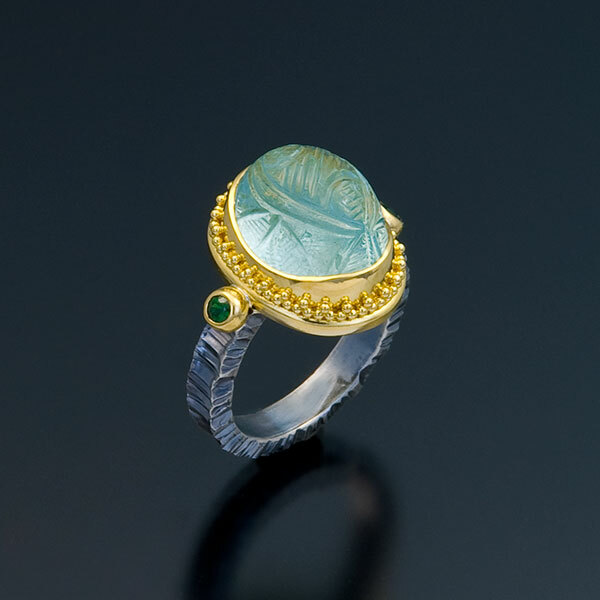 Ring is set with a Denim Aquamarine oval cabochon (17.8x14mm, 15.76cts) and Mint Green Tourmalines (.16tcw) in granulated 22kt yellow gold on a forged and oxidized sterling silver band, 4mm wide. 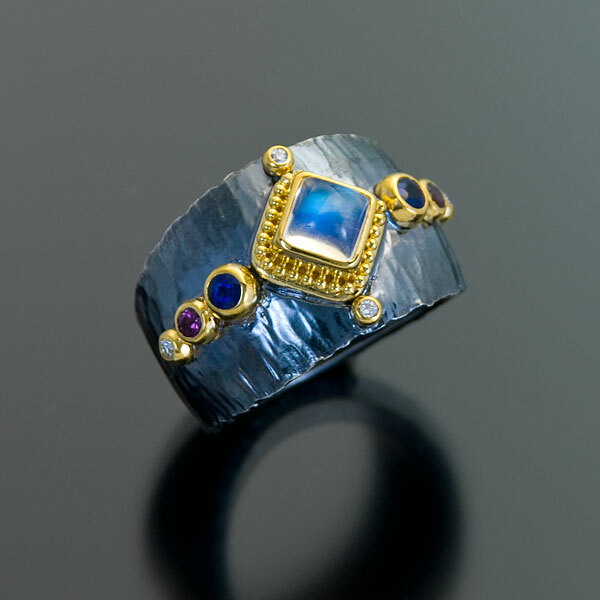 Ring is set with a Sapphire Crystal Slice (23.3×18.7mm, 26.25cts) and Diamonds (.15tcw) in granulated 22kt yellow gold on a forged and oxidized sterling silver band, 6mm wide. 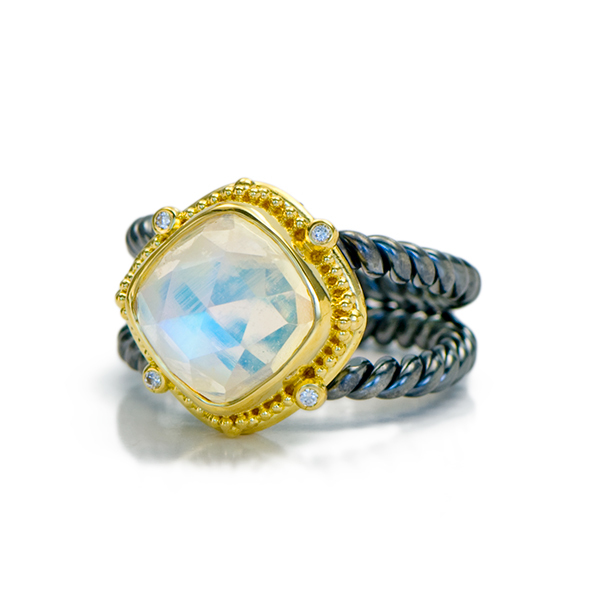 Ring is set with a Rainbow Moonstone (1.25cts) in granulated 22kt yellow gold on an oxidized sterling silver twist band, 2.5mm wide. 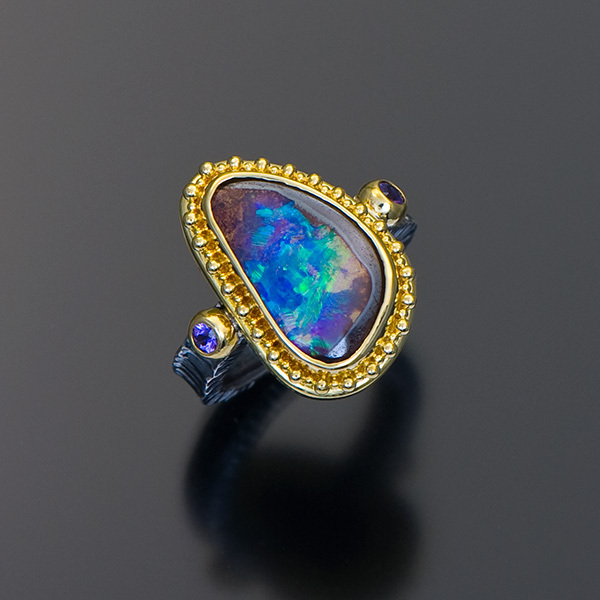 Ring is set with an Australian Yowah Nut Boulder Opal (4.0cts) and Purple Sapphires (.14tcw) in granulated 22kt yellow gold on a forged and oxidized sterling silver band, 4mm wide. 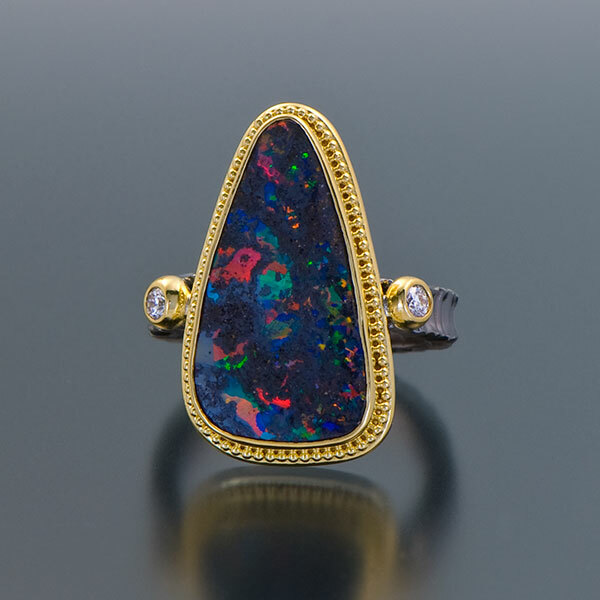 Ring is set with an Australian Boulder Opal (5.36cts) and Diamonds (.15tcw) in granulated 22kt yellow gold on a forged and oxidized sterling silver band, 4mm wide. 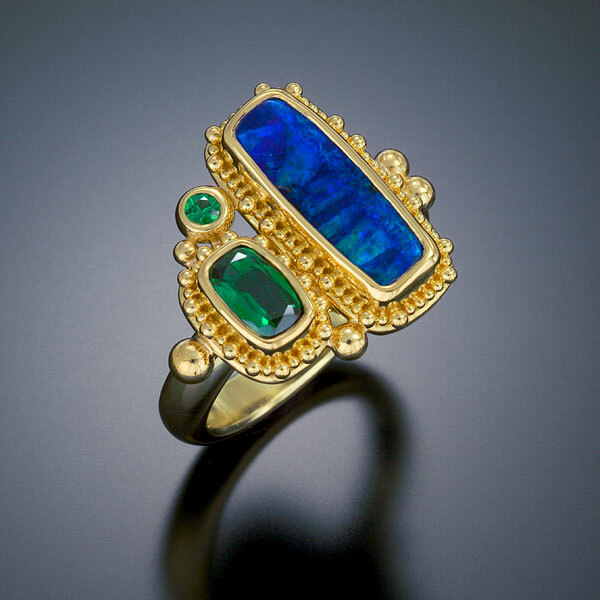 Ring is set with an Australian Boulder Opal (3.24cts), Tsavorite Garnets (.14tcw) and Diamonds (.03tcw) in granulated 22kt yellow gold on a forged and oxidized sterling silver band, 4mm wide. 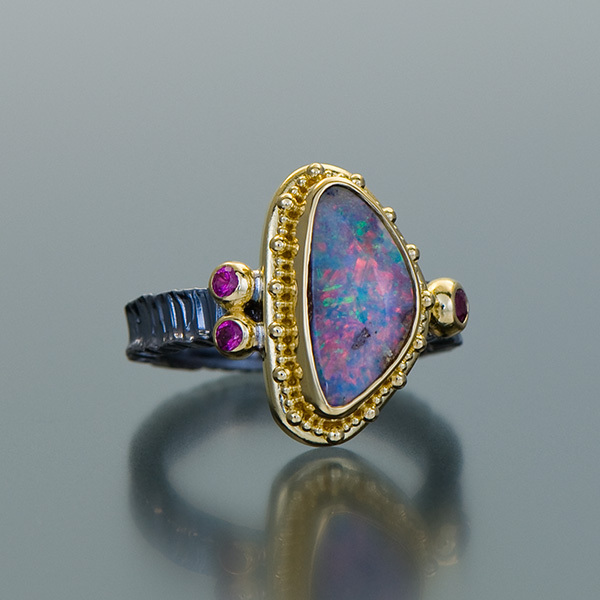 Ring is set with an Australian Boulder Opal (15×7.6mm, 2.37cts) and Hot Pink Sapphires (.16tcw) in granulated 22kt yellow gold on a forged and oxidized sterling silver band, 4mm wide. 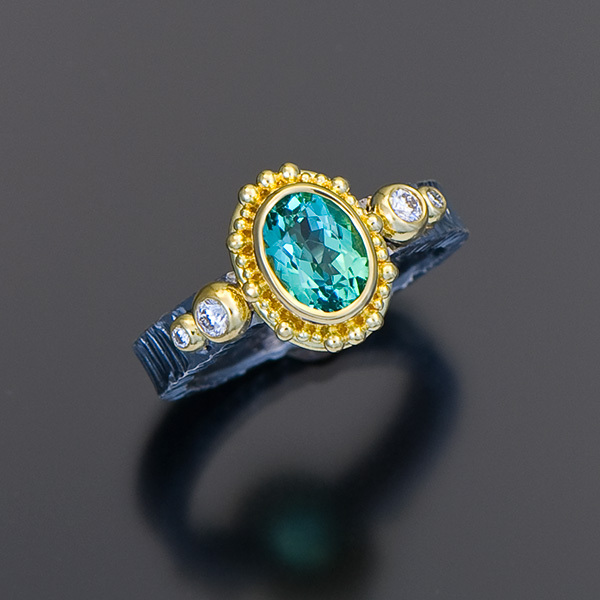 Ring is set with a Blue-Green Tourmaline (9x6mm, 1.30cts) and Diamonds (.14tcw) in granulated 22kt yellow gold on a forged and oxidized sterling silver band, 4mm wide. 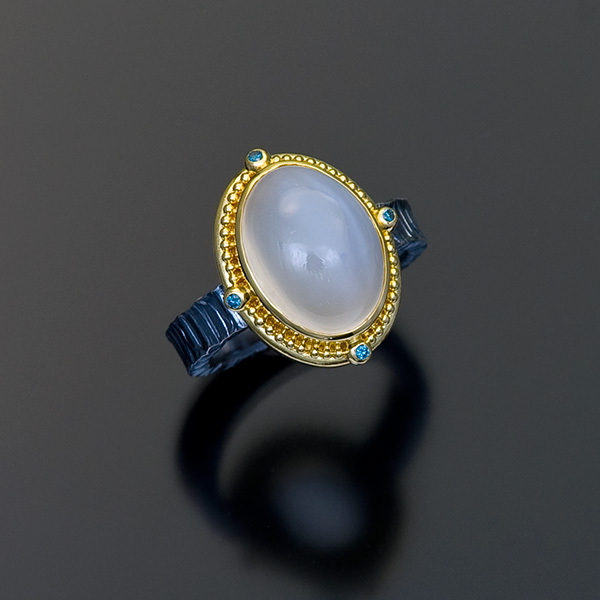 Ring is set with a White Cat’s Eye Moonstone (10x14mm, 7.31cts) and Blue Diamonds (.04tcw) in granulated 22kt yellow gold on a forged and oxidized sterling silver band, 4mm wide. 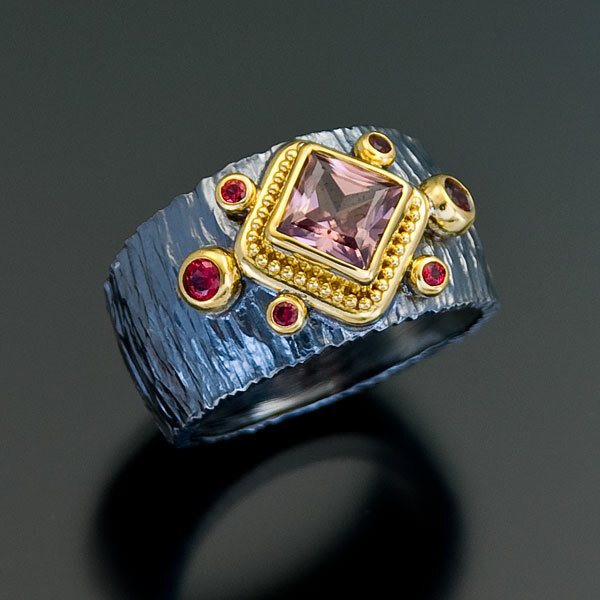 Ring is set with a Rhodolite Garnet (13.5x11mm), Diamonds (.18tcw) and Garnets (.16tcw) in granulated 22kt yellow gold on a forged and oxidized sterling silver band, tapering from 19.25 to 7.25mm. 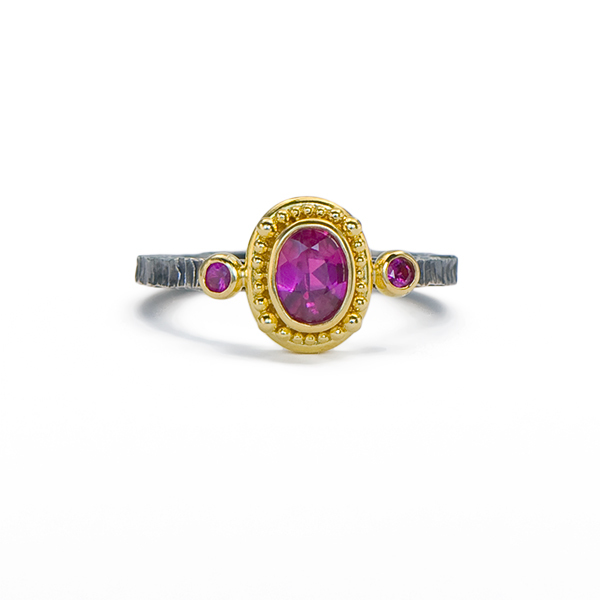 Ring is set with a Pink Sapphire (1.8cts), Diamonds (.14tcw) and Magenta Sapphires (.08tcw) in 22kt yellow gold with Platinum and 22kt yellow gold granulation on a forged and oxidized sterling silver band. 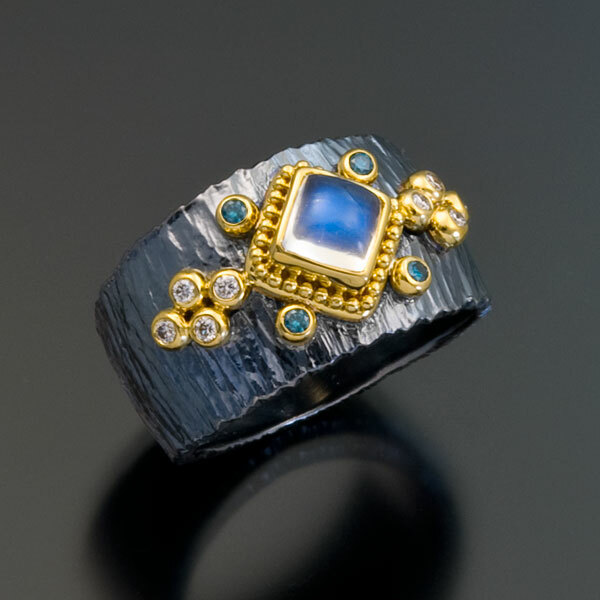 Ring is set with a Blue Sapphire (.19cts) and Diamonds (.03tcw) in granulated 22kt yellow gold on a forged and oxidized sterling silver band, tapering from 7.75mm to 5mm. 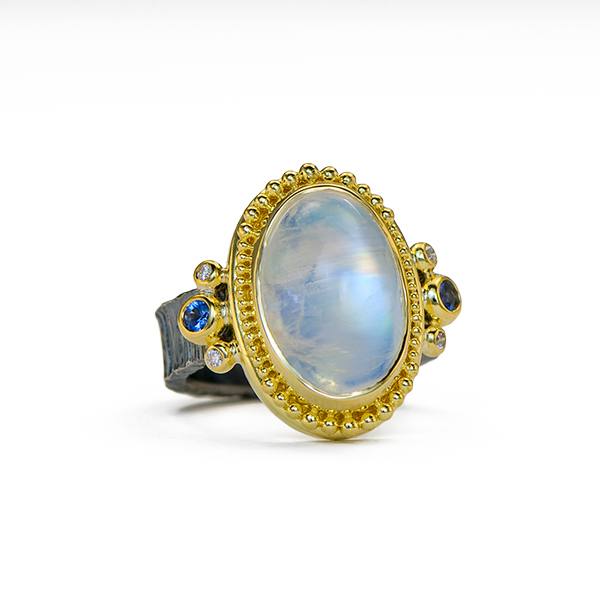 Ring is set with a Rainbow Moonstone (1.16cts) in granulated 22kt yellow gold on a forged and oxidized sterling silver band, 2mm wide. 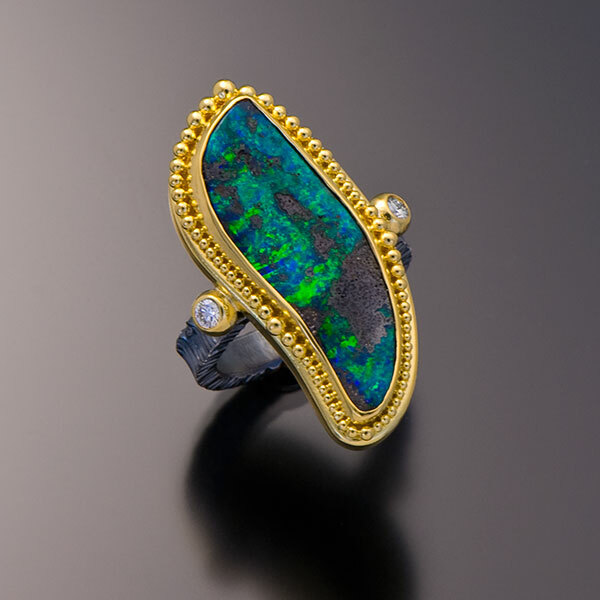 Ring is set with an Australian Lightning Ridge Boulder Opal (1.64cts), Diamonds (.12tcw) and Tsavorite Garnets (.20tcw) in granulated 22kt yellow gold with a forged and oxidized sterling silver band, 4mm wide. 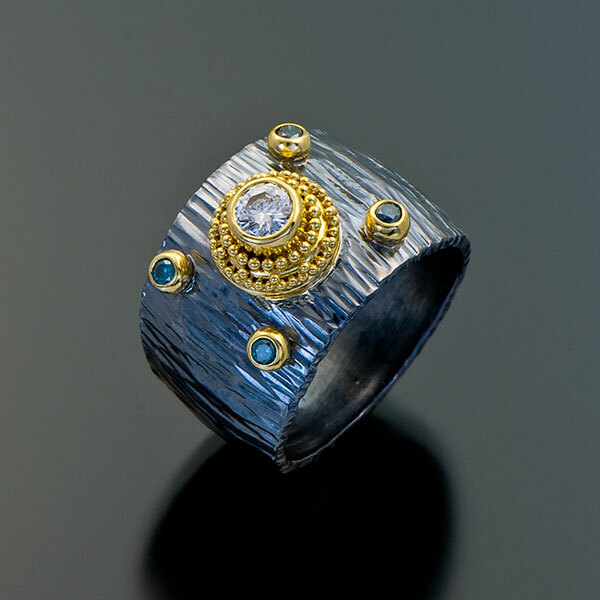 Ring is set with Diamonds in granulated 22kt yellow gold on a forged and oxidized sterling silver band. 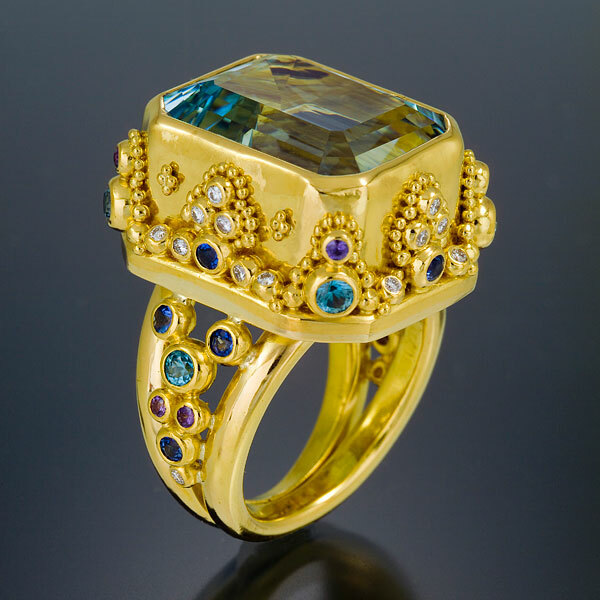 Ring is set with an African Paraiba Tourmaline (10x8mm, 3.95cts), Blue Sapphires (.15tcw) and Diamonds (.04tcw) in granulated 22kt yellow gold with an 18kt yellow gold band. 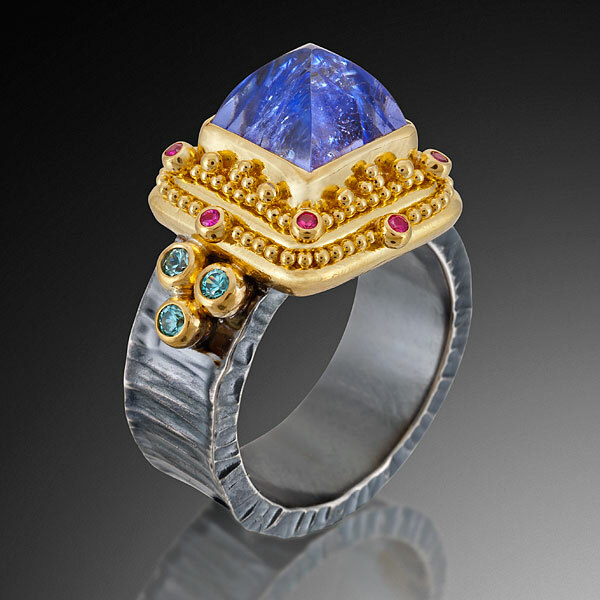 Ring is set with a Tanzanite (8x6mm, 1.54cts), Purple Sapphires (.28tcw) and Pink Sapphires (.08tcw) in granulated 22kt yellow gold on a forged and oxidized sterling silver tapered band, 14.3mm to 6.8mm wide. 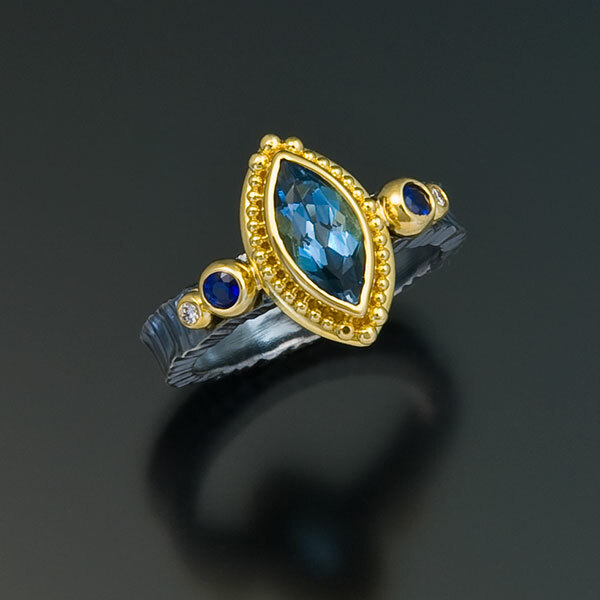 Ring is set with a Blue Zircon (8x6mm, 2.28cts), Blue Sapphire (.14tcw), Teal Diamonds (.08tcw) and White Diamonds (.09tcw) in granulated 22kt yellow gold on a forged and oxidized sterling silver tapered band, 15mm to 6.3mm wide. 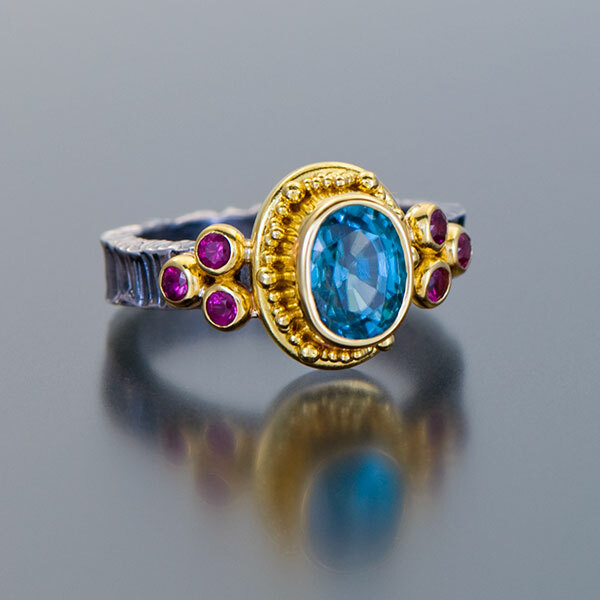 Ring is set with a Blue Zircon (8x6mm, 2.28cts) and Pink Sapphires (.24tcw) in granulated 22kt yellow gold on a forged and oxidized sterling silver band, 4mm wide. 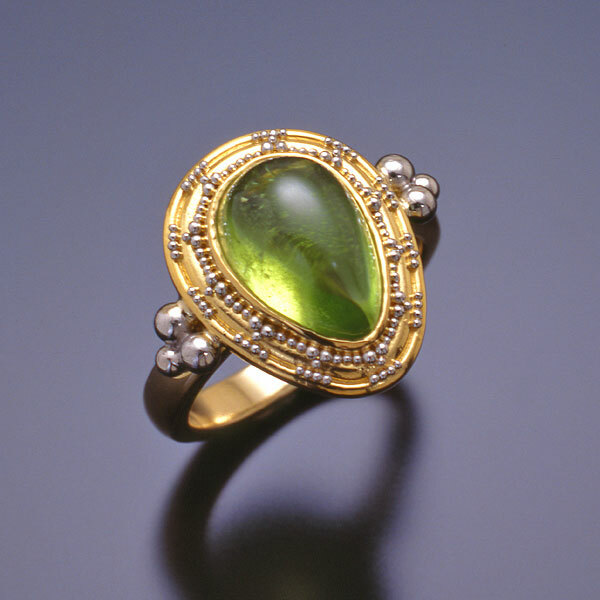 Ring is set with a Peridot (16x8mm, 4.18cts) and Tsavorite Garnets (.14tcw) in granulated 22kt yellow gold on a forged and oxidized sterling silver band, 6mm wide. 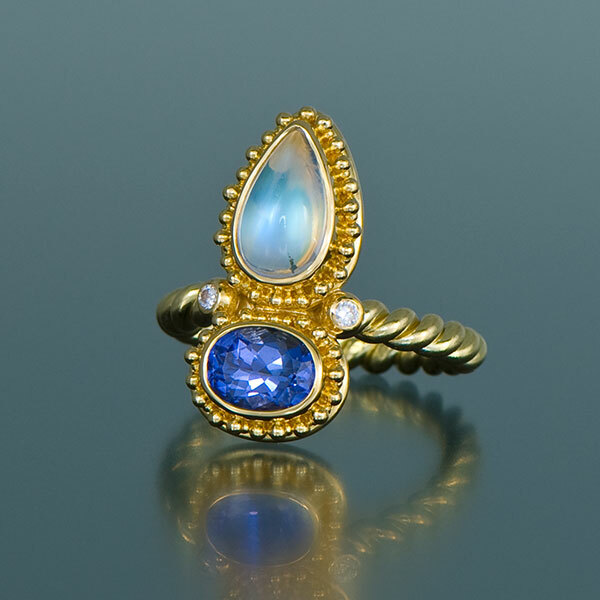 Ring is set with a Moonstone (11×6.8mm, 2.36tcw), Tanzanite (8x6mm, 1.54cts) and Diamonds (.08tcw) in granulated 22kt yellow gold with an 18kt yellow gold twist band. 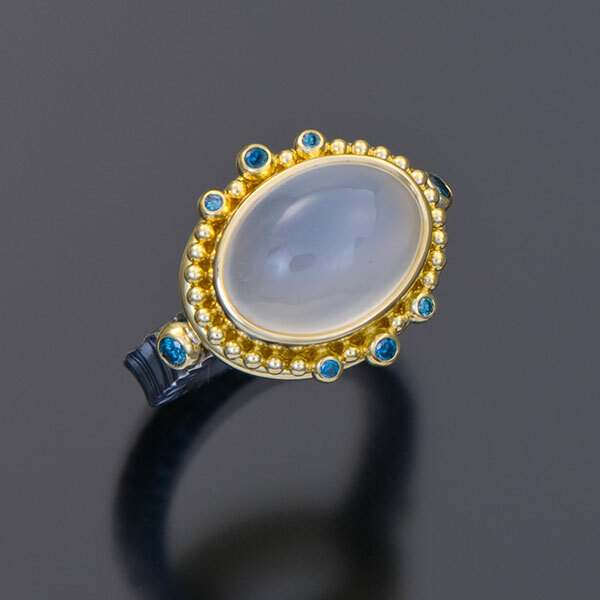 Ring is set with a White Cat’s Eye Moonstone (14x10mm, 7.31cts) and Teal Diamonds (.15tcw) in granulated 22kt yellow gold with a forged and oxidized sterling silver band, 4mm wide. 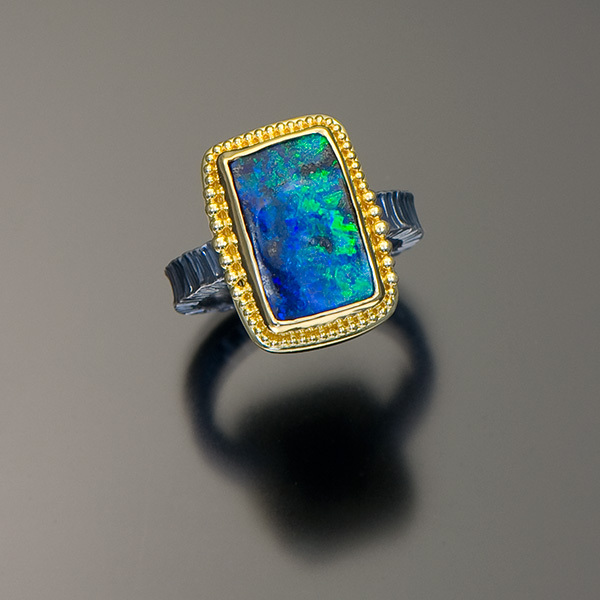 Ring is set with an Australian Boulder Opal (19.5×14.7mm, 9.0cts), Chrome Tourmalines (.08tcw) and Teal Diamonds (.03tcw) in granulated 22kt yellow gold on a forged and oxidized sterling silver band, 6mm wide. 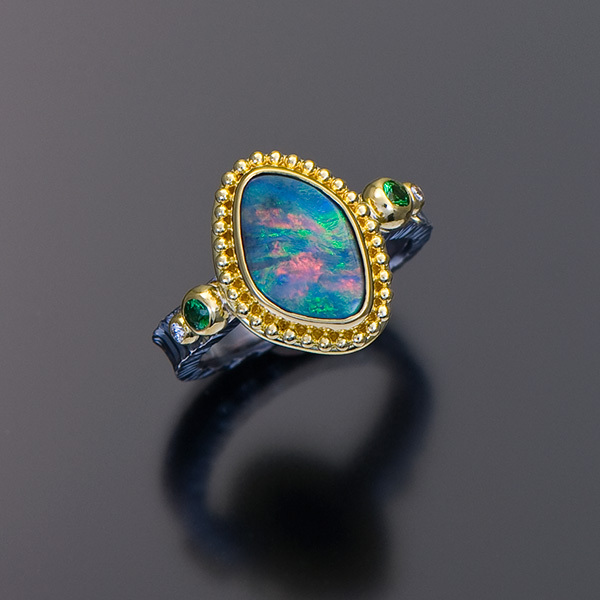 Ring is set with an Australlian Boulder Opal (13.16×8.67mm, 2.47cts) and Chrome Tourmalines (.08tcw) in granulated 22kt yellow gold on a forged and oxidized sterling silver band, 4mm wide. 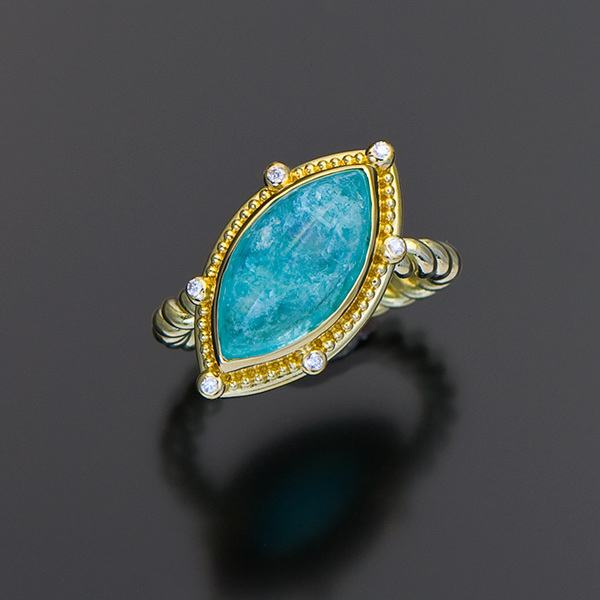 Ring is set with an Aquamarine surface crystal (11mm, 8.23cts), Teal Diamonds (.16tcw) and White Diamonds (.08tcw) in granulated 22kt yellow gold on a forged and oxidized sterling silver band, 4mm wide. 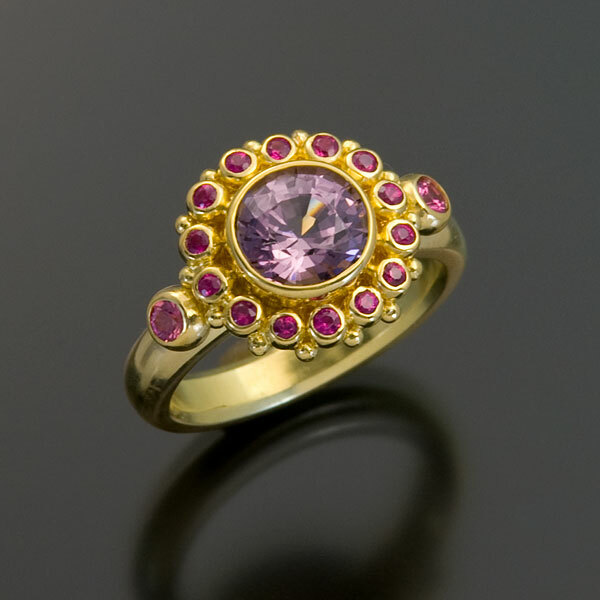 Ring is set with a Pink Sapphire (6mm, 1.01cts), Diamonds (.06tcw) and Pink Sapphires (.24tcw) in granulated 22kt yellow gold on a forged and oxidized sterling silver band, tapering from 14.2-8mm. 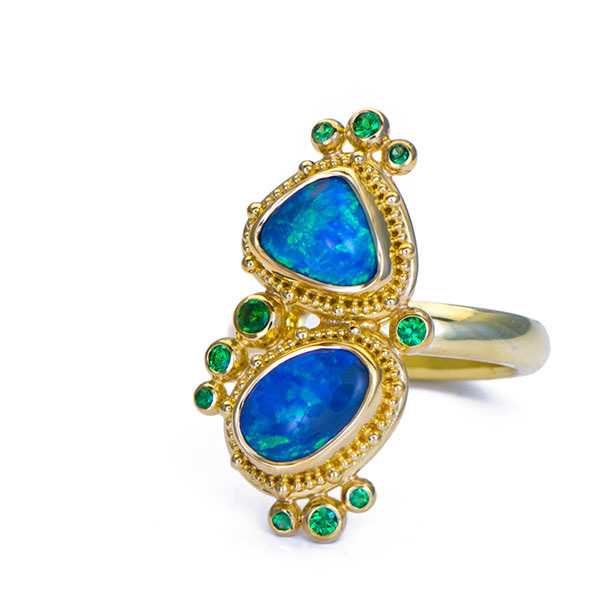 Ring is set with two pieces of Lightning Ridge Opal (3.24tcw) and Tsavorite Garnets (.39tcw) in granulated 22kt yellow gold on an 18kt yellow gold band. 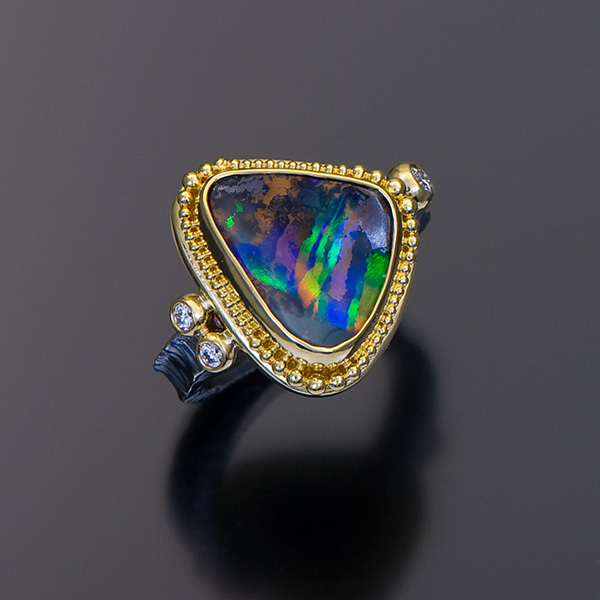 Ring is set with a Boulder Opal (15.65cts) and Diamonds (.14tcw) in granulated 22kt yellow gold on a forged and oxidized sterling silver band, 4mm wide. 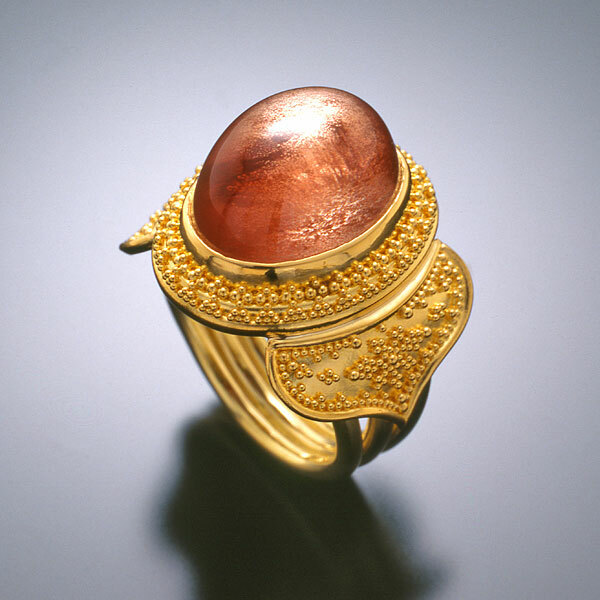 Ring is set with a Reddish-brown Rose-cut Diamond (.55cts) in granulated 22kt yellow gold on a forged and oxidized sterling silver band, 2mm wide. 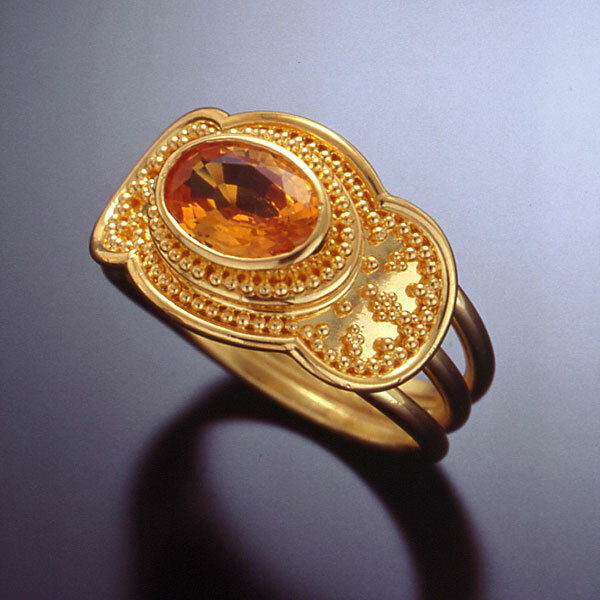 Ring is set with a Cognac Rose-cut Diamond (.82cts) in granulated 22kt yellow gold on a forged and oxidized sterling silver band, 2mm wide. 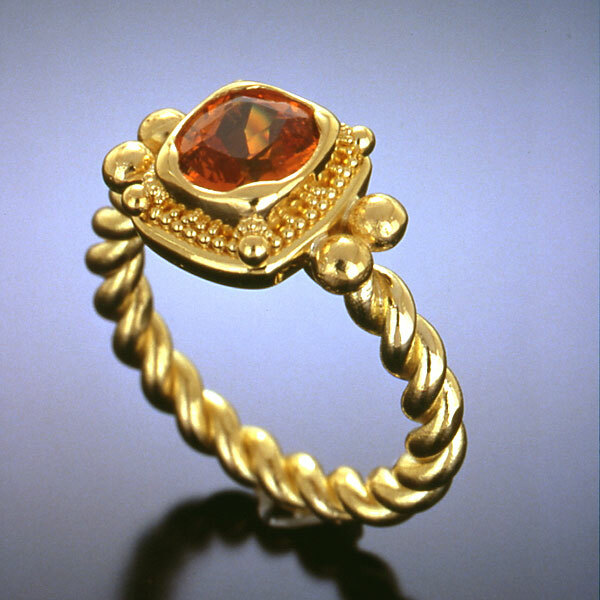 Ring is set with a Reddish-brown Rose-cut Diamond (1.75cts) in granulated 22kt yellow gold on a forged and oxidized sterling silver band, 2mm wide. 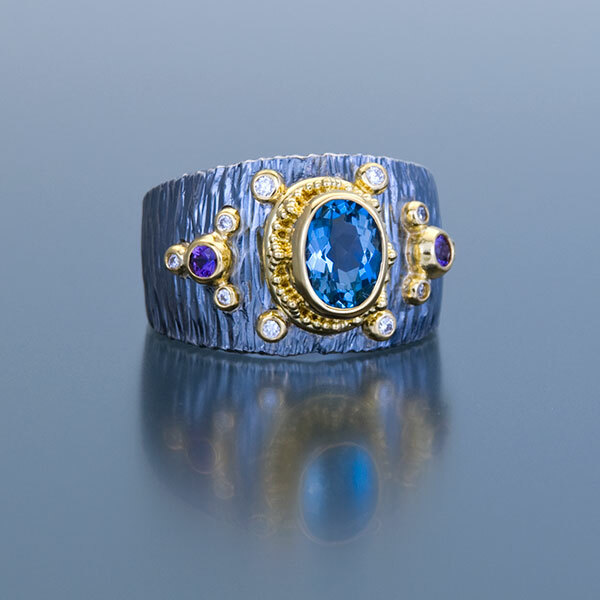 Ring is set with an Aquamarine (8x6mm, 1.23cts), Purple Sapphires (.14tcw) and Diamonds (.12tcw) in granulated 22kt yellow gold on a forged and oxidized sterling silver band tapering from 14.5mm to 5.75mm. 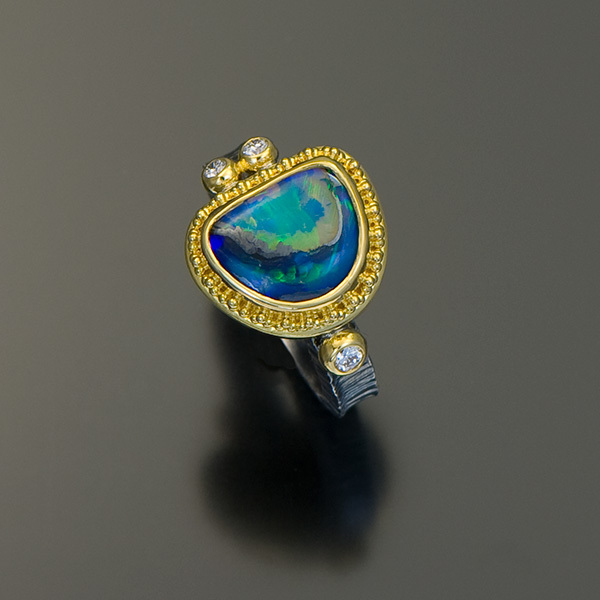 Ring is set with an African Paraiba Tourmaline (2.45cts), a Lighning Ridge Boulder Opal (.92cts), White Diamonds (.06tcw) and Teal Diamonds (R,.06tcw) in granulated 22kt yellow gold with an 18kt yellow gold band, 4mm wide. 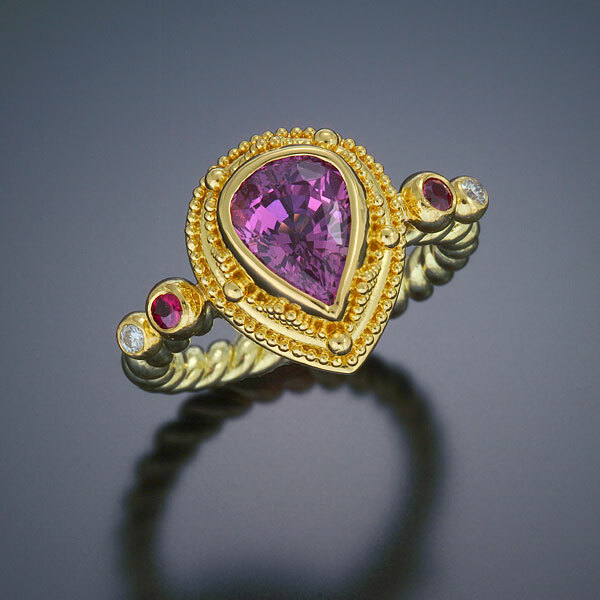 Ring is set with a Pink Tourmaline cabochon (10x8mm, 3.65cts), a Purple Sapphire (.42cts), Diamonds (.06tcw) and Pink Sapphires (.07tcw) in granulated 22kt yellow gold on an 18kt yellow gold band, 4mm wide. 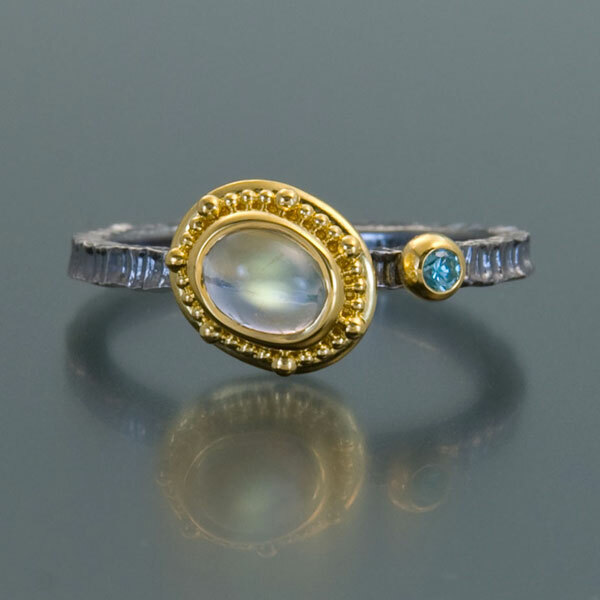 Ring is set with a Rainbow Moonstone (.74cts) and a Teal Diamond (.04cts) in granulated 22kt yellow gold on a forged and oxidized 2mm wide band. 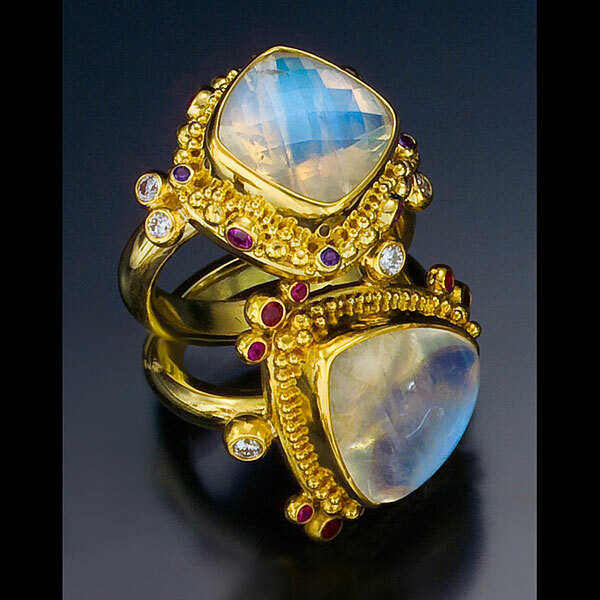 Ring is set with a Rainbow Moonstone (.74cts) and a Diamond (.04cts) in granulated 22kt yellow gold on a forged and oxidized 2mm wide band. 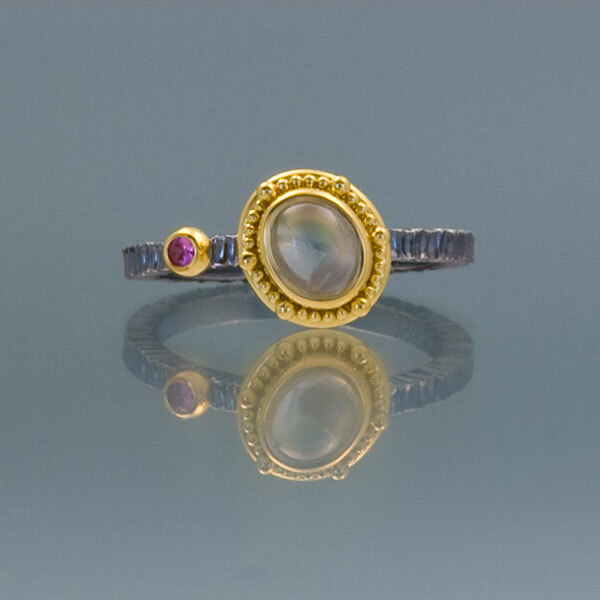 Ring is set with a Rainbow Moonstone (.74cts) and a Pink Sapphire (.04cts) in granulated 22kt yellow gold on a forged and oxidized 2mm wide band. 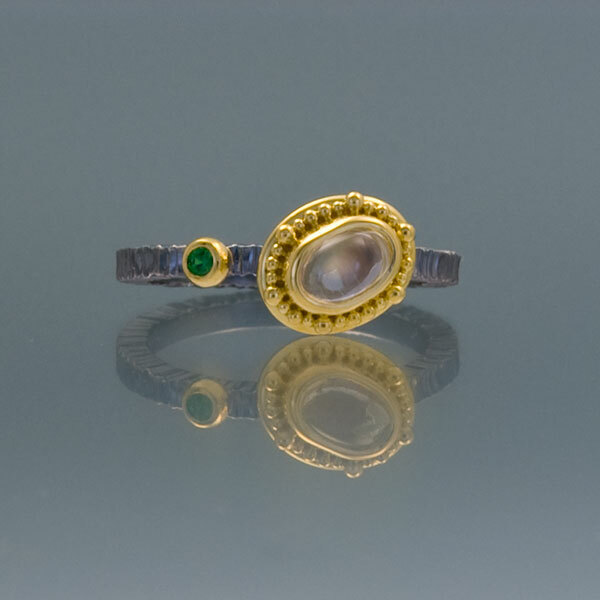 Ring is set with a Rainbow Moonstone (.49cts) and a Tsavorite Garnet (.04cts) in granulated 22kt yellow gold on a forged and oxidized sterling silver band. 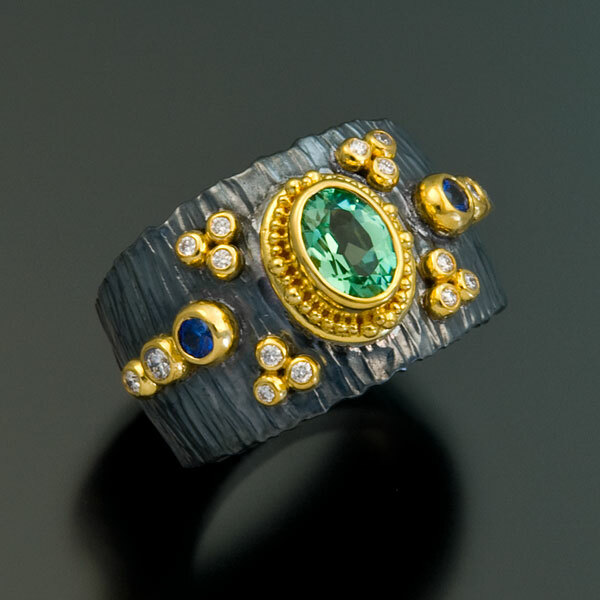 Ring is set with a Green Tourmaline (10mm, 3.65cts), Blue Sapphires (.14tcw) and Diamonds (.03tcw) in granulated 22kt yellow gold on a forged and oxidized sterling silver band, 4mm wide. 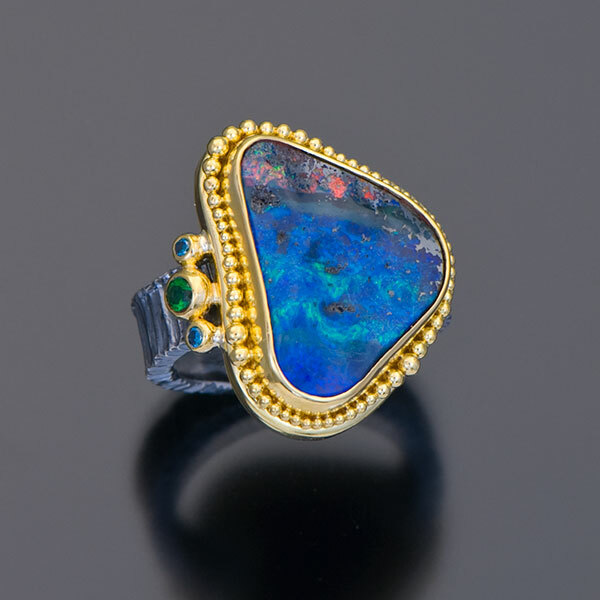 Ring is set with an Australian Boulder Opal (24x13mm, 5.20cts) and Diamonds (.14tcw) in granulated 22kt yellow gold with a forged and oxidized sterling silver band, 4mm wide. 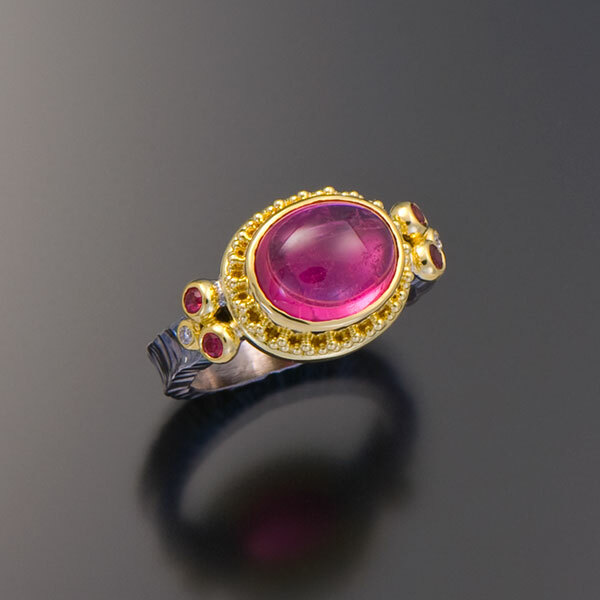 Ring is set with a Rubellite Pink Tourmaline cabochon (9x11mm, 3.89cts), Red Spinels (.16tcw) and Diamonds (.03tcw) in granulated 22kt yellow gold with a forged and oxidized sterling silver band, 4mm wide. 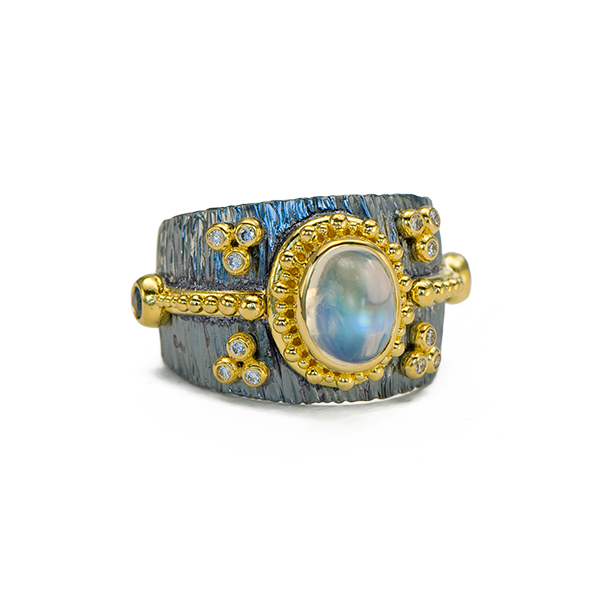 Ring is set with a Blue Moonstone (11x16mm, 12.26cts) and Teal Diamonds (.09tcw, R) in granulated 22kt yellow gold with an oxidized sterling silver twist band. 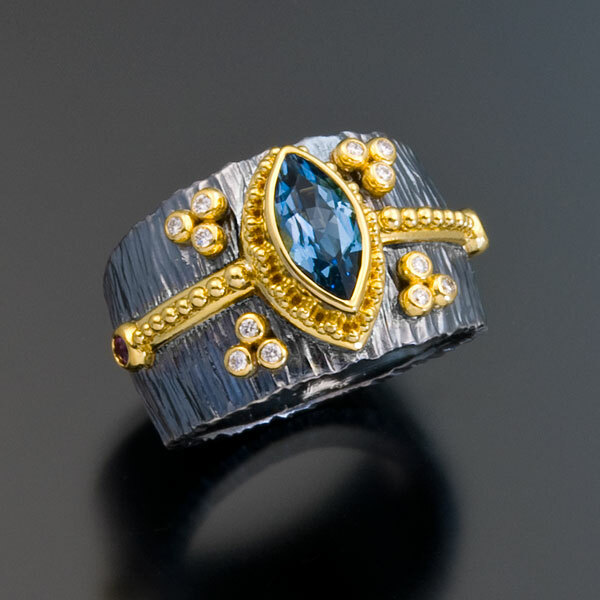 Ring is set with a Blue Zircon (6x8mm, 1.79cts) and Diamonds (.16tcw) in granulated 22kt yellow gold with a oxidized sterling silver twist band. 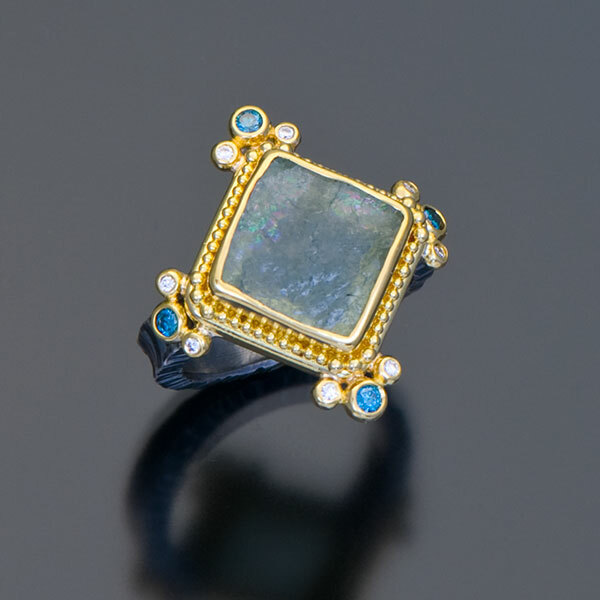 Ring is set with a Moonstone (9x7mm, 2.34cts), Chrome Tourmaline (4x5mm, .33cts), White Diamonds (.06tcw) and Teal Diamonds (.08tcw, R) in granulated 22kt yellow gold on an 18kt yellow gold open band. 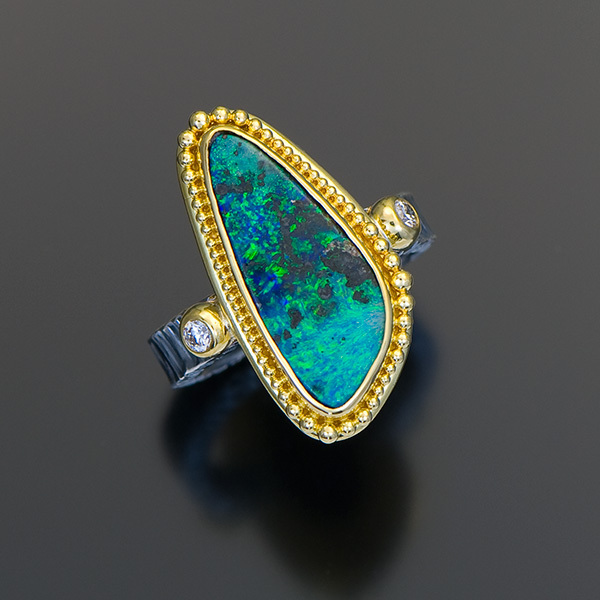 Ring is set asymetrically with an Australian Yowah Boulder Opal (5.5cts), Chrome Tourmalines (.16tcw) and Teal Diamonds (.05tcw, R) in granulated 22kt yellow gold with a forged and oxidized sterling silver band. 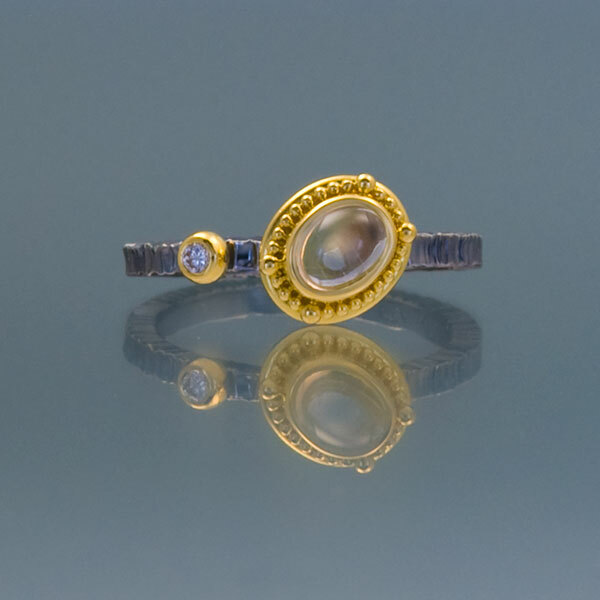 Ring is set with a Rose-cut Moonstone and Blue Sapphires in 22kt yellow gold with platinum and 22kt yellow gold granulation on a forged and oxidzed sterling silver band, 4mm wide. 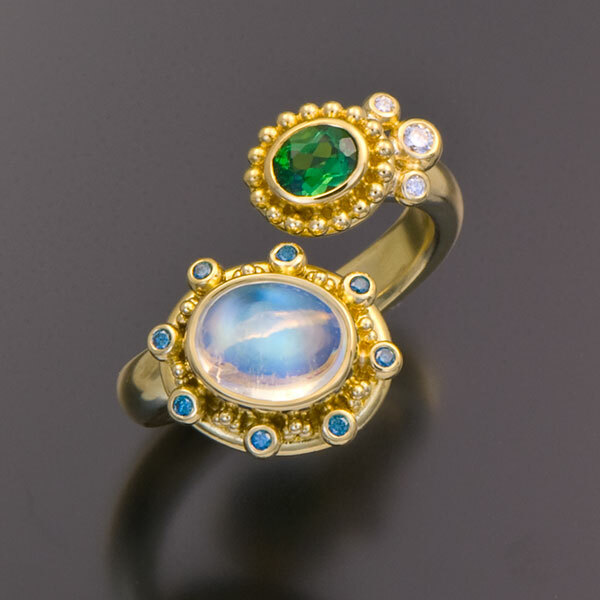 Ring is set with an Australian Yowah Opal (8.9cts) and Tsavorite Garnets (.14tcw) in granulated 22kt yellow gold on a forged and oxidized sterling silver band, 4mm wide. 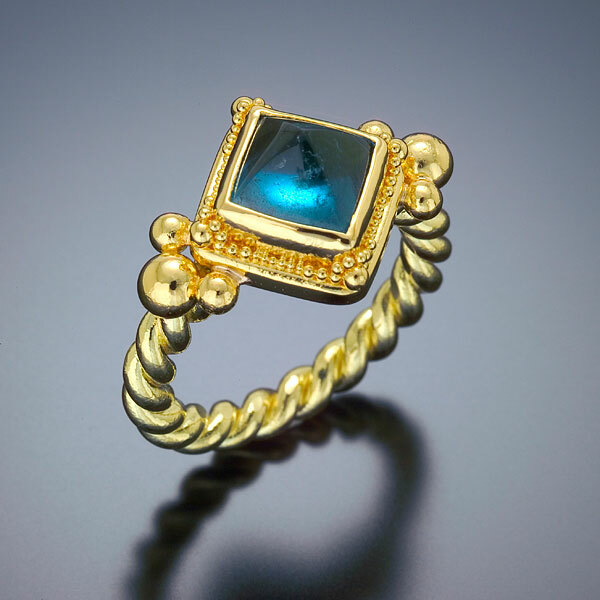 Ring is 3/4″ long. 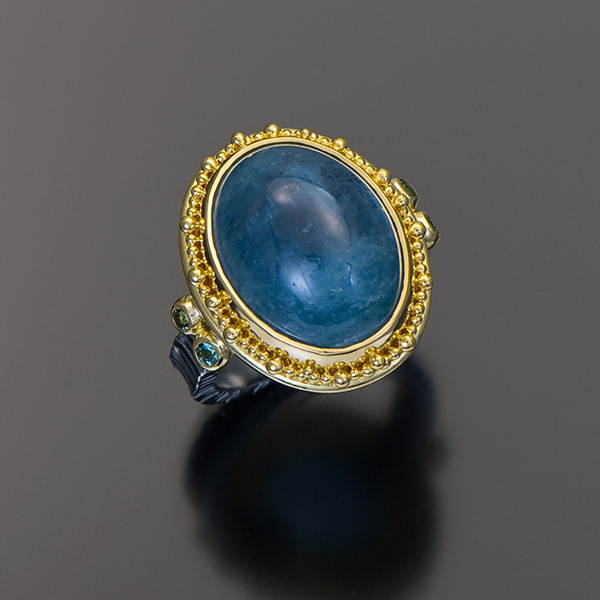 Ring is set with a Blue Chalcedony (13.8cts, 14.4×16.6mm) and Red Spinels (.24tcw) in granulated 22kt yellow gold with a forged and oxidized sterling silver band, 4mm wide. 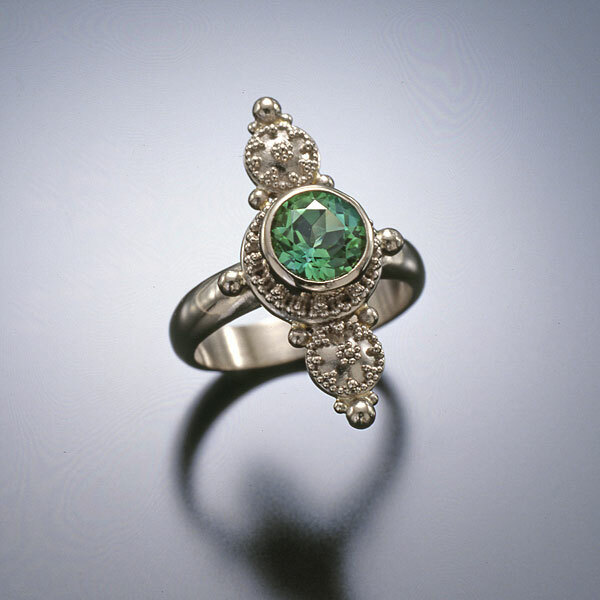 Ring is 3/4″ long. 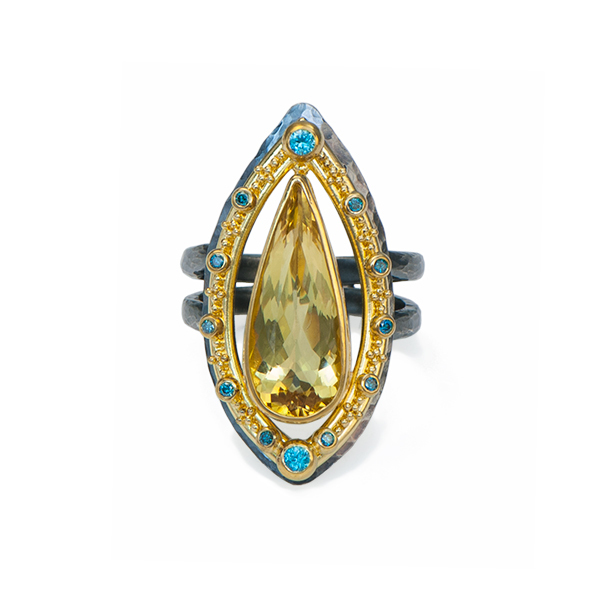 Ring is set with a Denim Aquamarine (8.18cts, 13mm), Teal Diamonds (.16tcw, R) and White Diamonds (.06tcw) in granulated 22kt yellow gold with a forged and oxidized sterling silver band, 4mm wide. 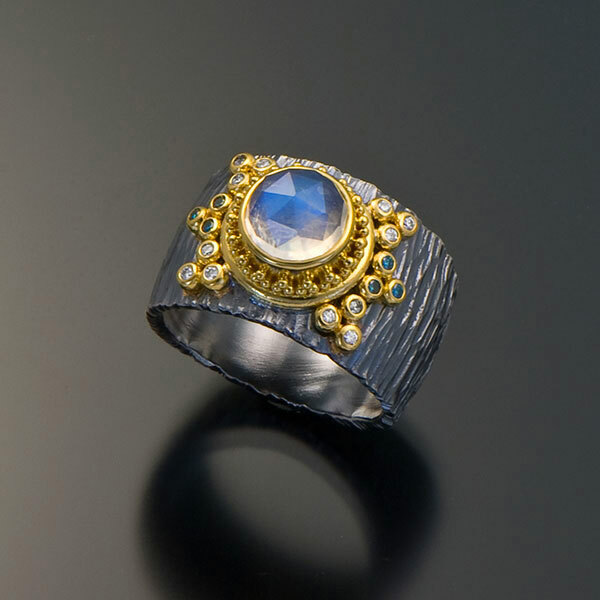 Ring is 5/8″ long. 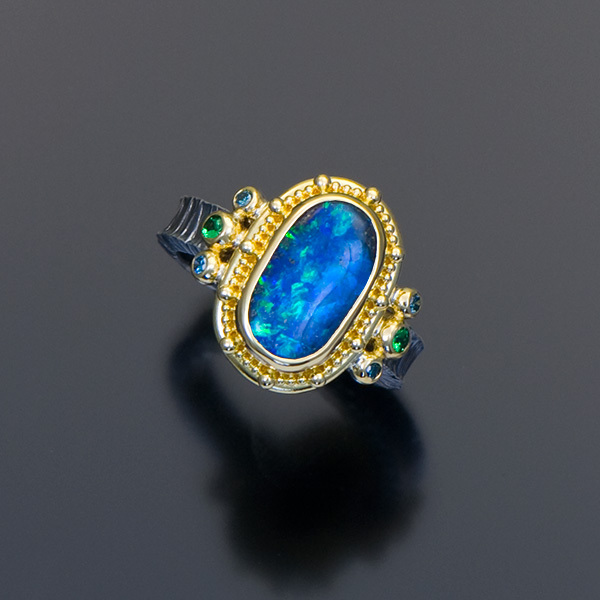 Ring is set with an Australian Boulder Opal (8.9cts), Blue Sapphires (.14tcw) and Chrome Tourmalines (.16tcw) in granulated 22kt yellow gold with a forged and oxidized sterling silver band, 4mm wide. 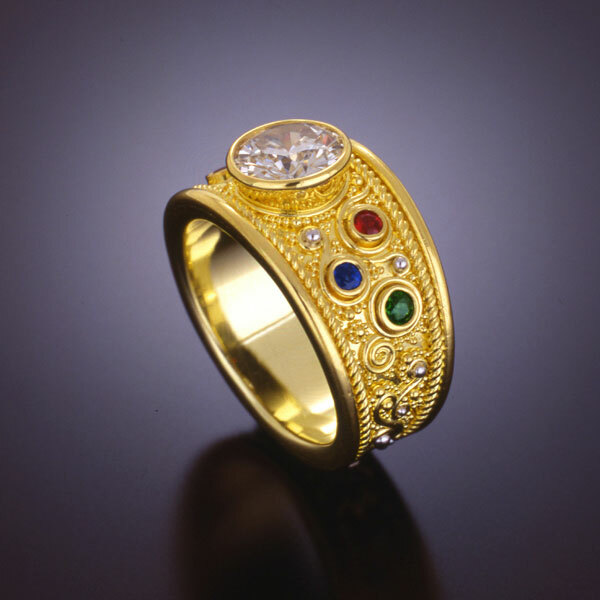 Ring is 7/8″ long. 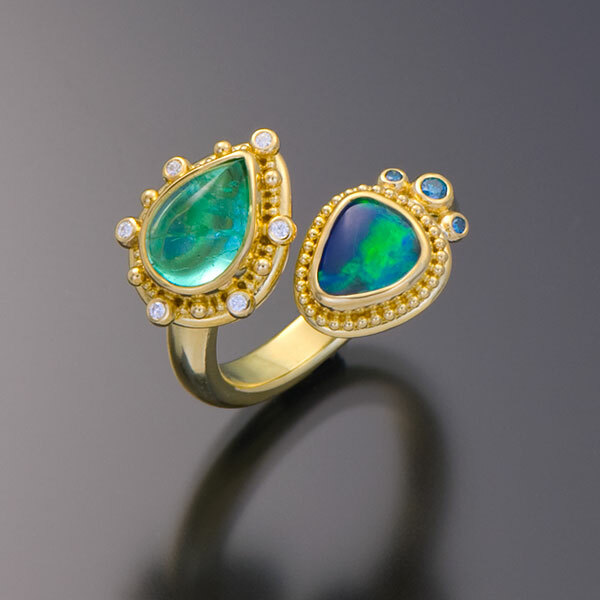 Ring is set with a Boulder Opal (2.05cts), Tsavorite Garnets (.14tcw) and Diamonds (.08tcw) in granulated 22kt yellow gold with a forged and oxidized sterling silver band, 4mm wide. 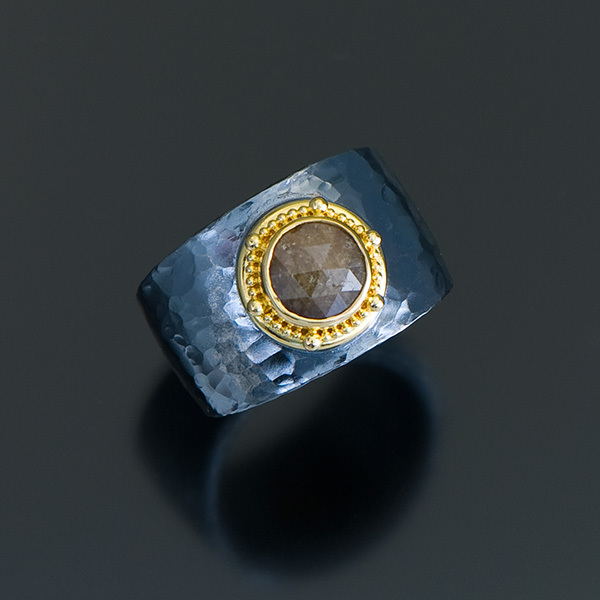 Ring is 5/8″ long. 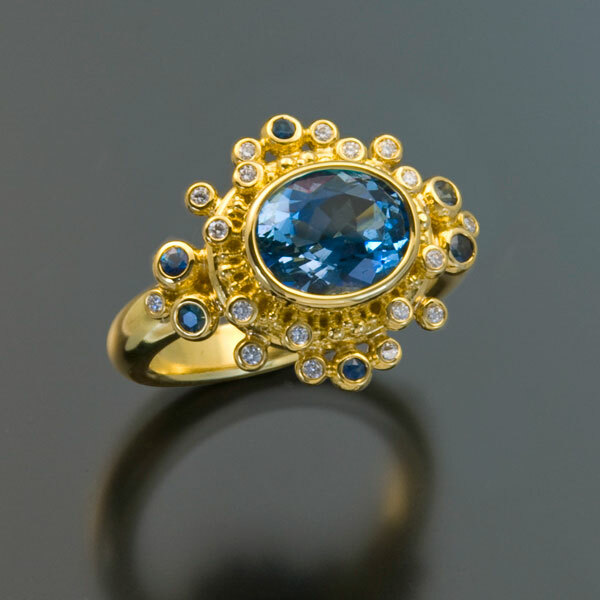 Ring is set with a Blue Zircon (8x6mm, 1.79cts), Blue Sapphires (.14tcw) and Diamonds (.06tcw) in granulated 22kt yellow gold with a forged and oxidized sterling silver band, 4mm wide. 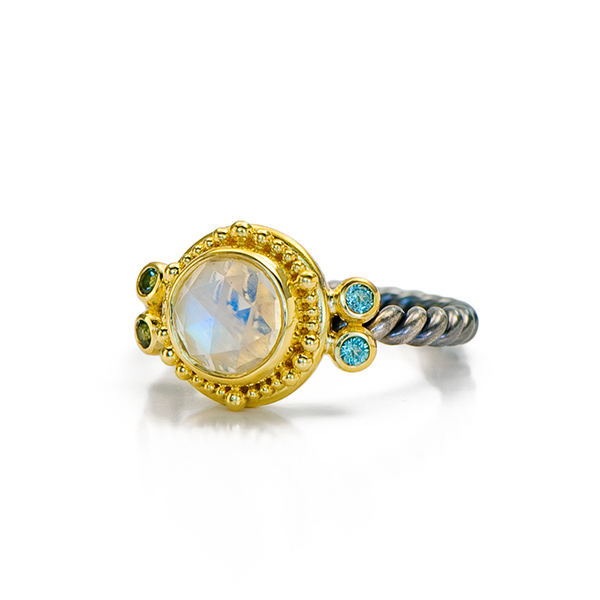 Ring is set with a rose-cut Moonstone (2.18cts), Teal Diamonds (.06tcw, R) and White Diamonds (.12tcw) in granulated 22kt yellow gold on a forged and oxidized sterling silver tapered band, 14.75mm to 8.5mm. 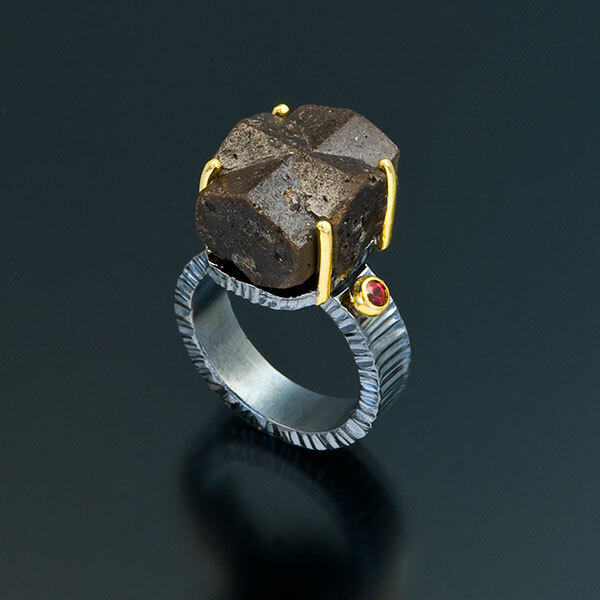 Ring is set with a Staurolite (a naturally formed twin crystal), Red Spinels (.12tcw) and Diamonds (.06tcw) in 22kt yellow gold on a forged and oxidized sterling silver band 8mm wide, 5/8″ L x 3/4″ W x 1 1/4″ D.
Ring is set with a Moonstone (2.69cts), Cherry Spinels (.18tcw) and Pink Sapphires (.08tcw) in granulated 22kt yellow gold with a forged and oxidized sterling silver band, 4mm wide. 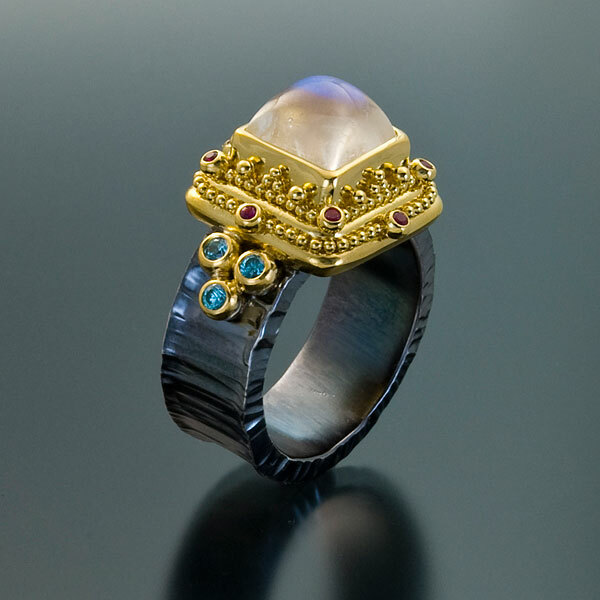 Ring is set with Australian Opalized Petrified Wood (5.4cts) and Mint Green Tourmalines (.14tcw) in granulated 22kt yellow gold on a forged and oxidized sterling silver band, 4mm wide. 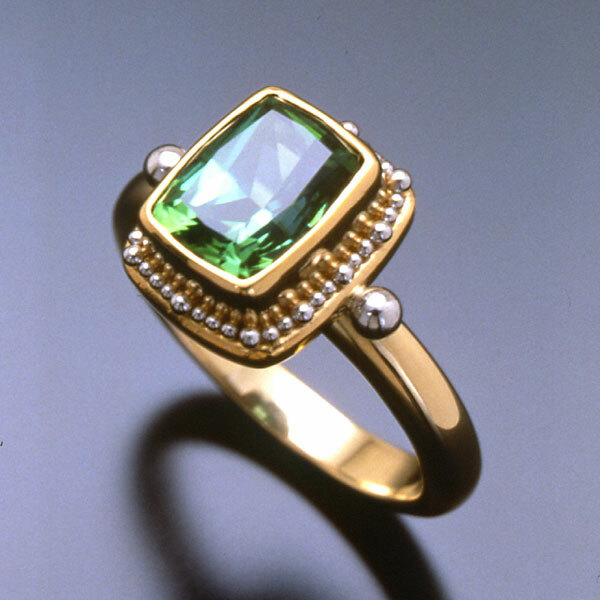 Ring is set with a Chrysoberyl (6x8mm, 1.49cts) and Diamonds (.40tcw) in granulated 22kt yellow gold with a 22kt yellow gold band. 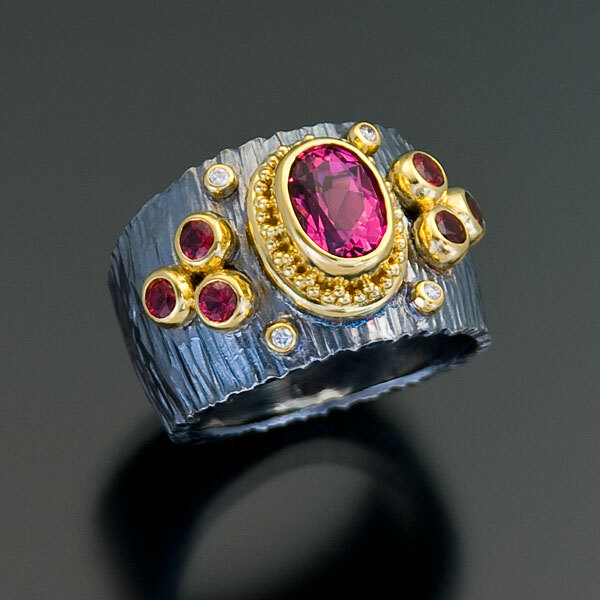 Ring is set with a Red Spinel (.69cts) and Pink Spinels (.18tcw) in granulated 22kt yellow gold on a forged and oxidized sterling silver band, 4mm wide. 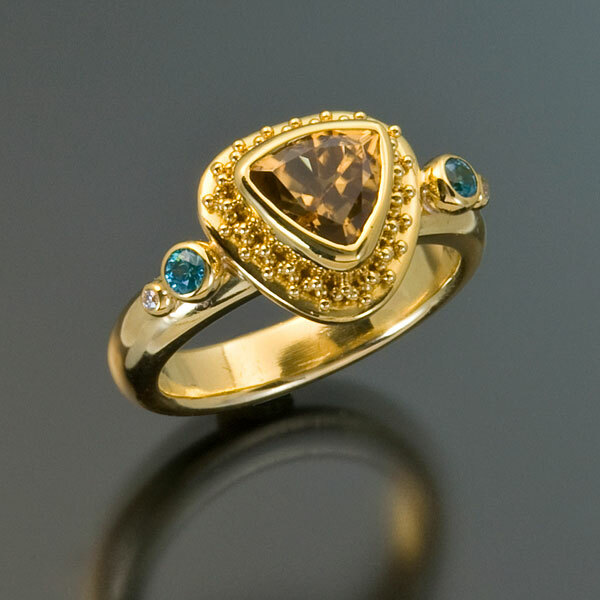 Ring is set with one white Diamond (SI1/G, .25cts) and Teal Diamonds (.16tcw) in granulated 22kt yellow gold on a forged and oxidized sterling silver band. 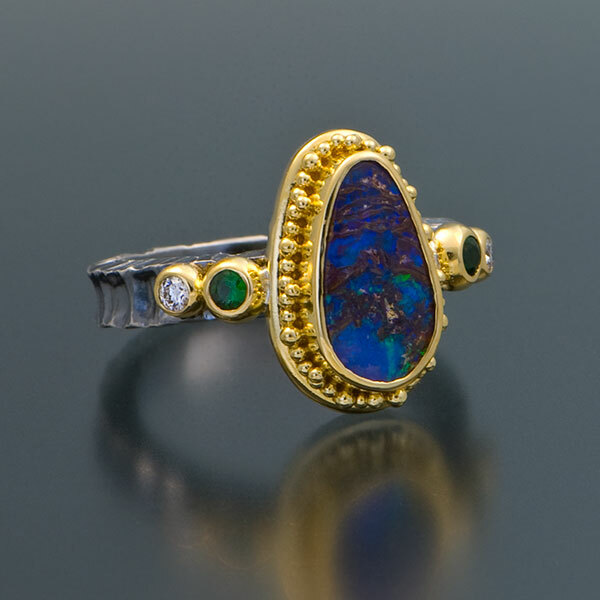 Ring is set with a Boulder Opal (4.94cts), Tsavorite Garnets (.14tcw) and Diamonds (.04tcw) in granulated 22kt yellow gold on a forged and oxidized sterling silver band, 4mm wide. 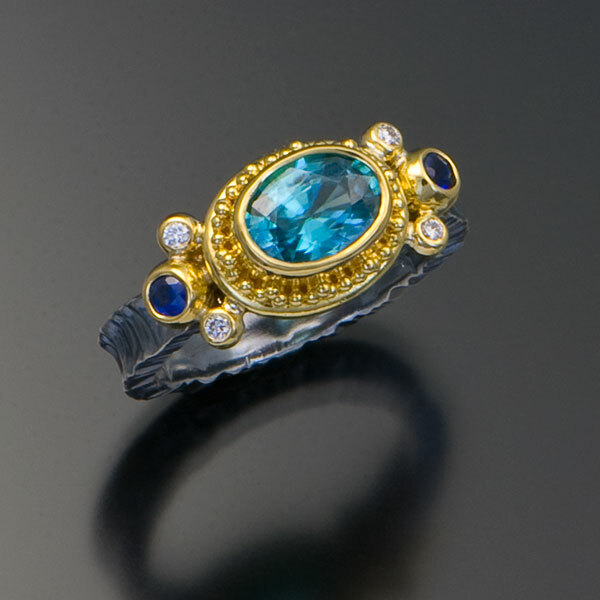 Ring is set with an Aquamarine (1.09cts), Blue Sapphires (.14tcw) and Diamonds (.03tcw) in granulated 22kt yellow gold on a forged and oxidized sterling silver band, 4mm wide. 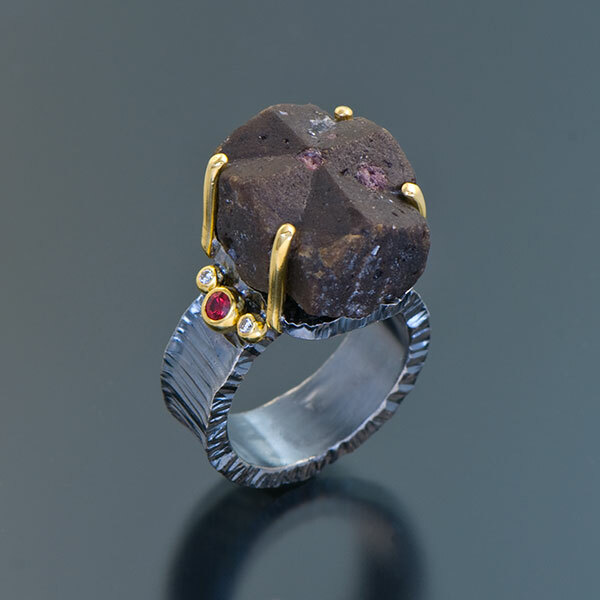 Ring is set with a Staurolite Fairy Crystal (17x14mm) and Red Spinels (.12tcw) in 22kt yellow gold with a forged and oxidized sterling silver band, 4mm wide. 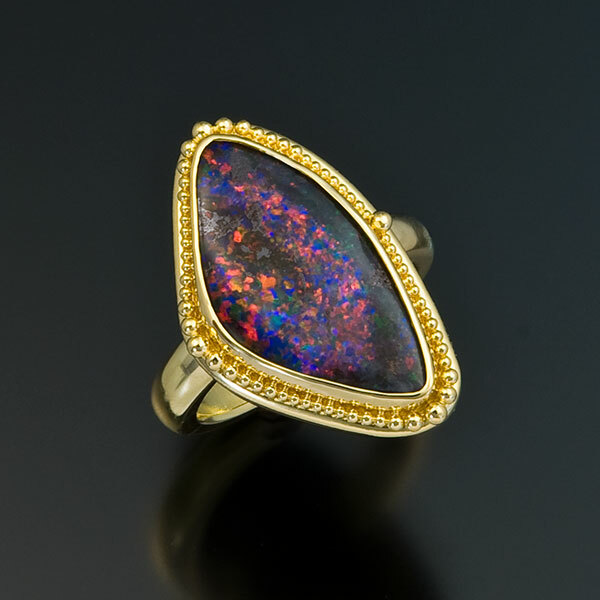 Ring is set with an Australian Boulder Opal (10.80cts) in granulated 22kt yellow gold with an 18kt yellow gold band. 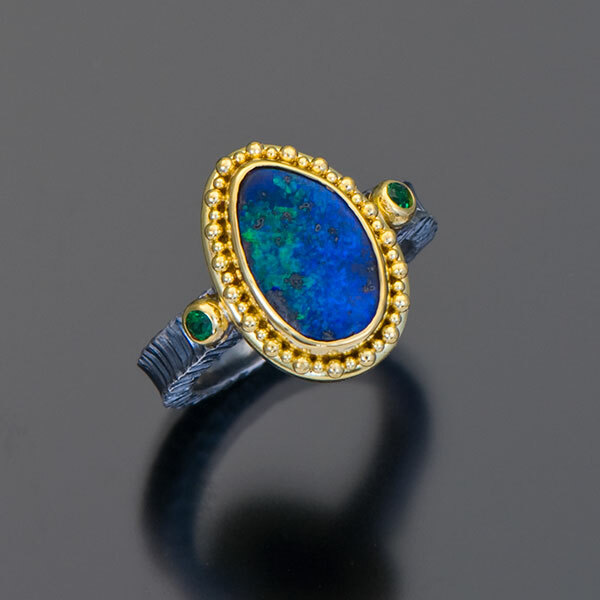 Ring is set with an Australian Boulder Opal (13.5x16mm, 5.44cts) and Blue Sapphires (.14tcw) in granulated 22kt yellow gold with a forged and oxidized sterling silver band, 4mm wide. 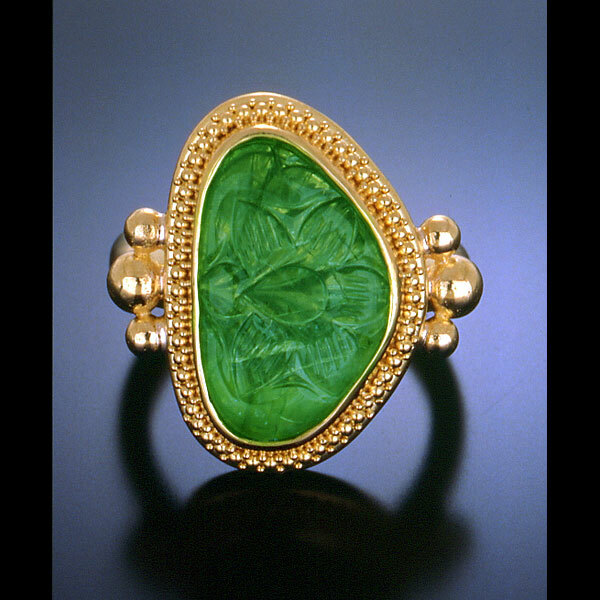 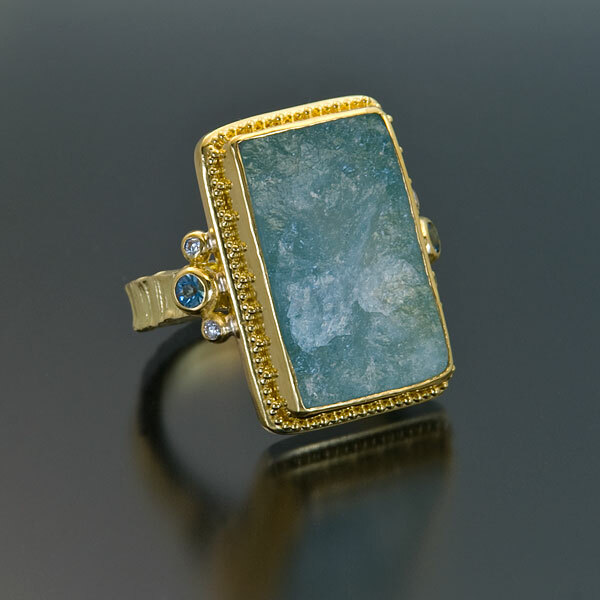 Ring is set with a carved Aquamarine (11.8×15.7mm, 12.57cts) in a granulated 22kt yellow gold sculpted bezel and flanked by Tsavorite Garnets (.13tcw) on a forged and oxidized sterling silver band, 4mm wide. 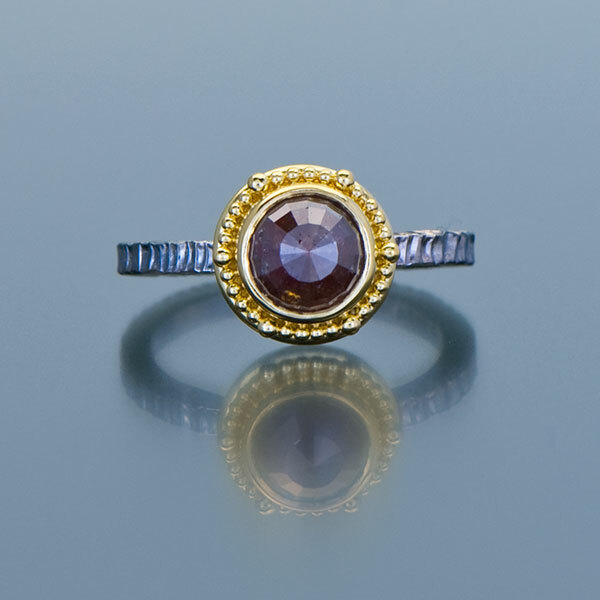 Ring is set with a Rhodolite Garnet (6mm, 1.02cts), Alexandrites (.12tcw) and Diamonds (.12tcw) in granulated 22kt yellow gold on a forged and oxidized sterling silver tapered band, 12.6 to 8mm wide. 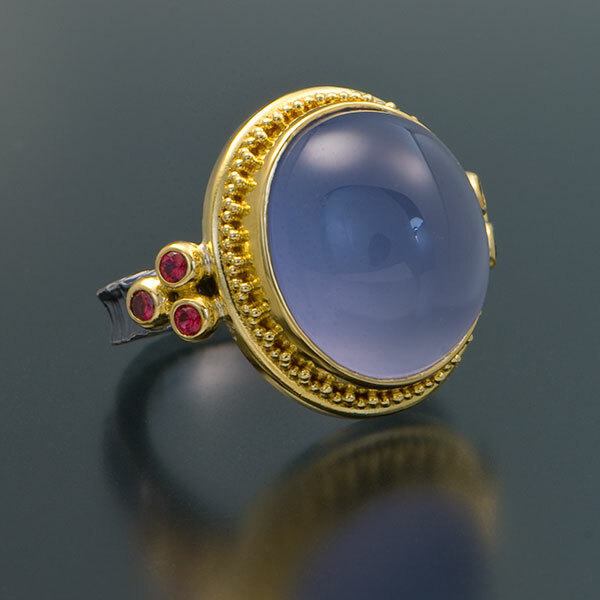 Ring is set with a Blue Chalcedony (13.7×15.4mm, 15.06cts) in a granulated 22kt yellow gold sculpted bezel and flanked by Pink Spinels (.18tcw) and Hot Pink Sapphires (.08tcw) on a forged and oxidized sterling silver band, 4mm wide. 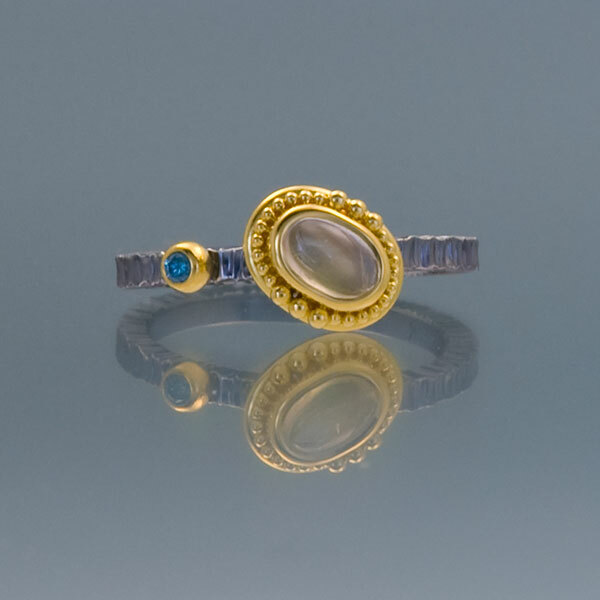 Ring is set with a Blue Moonstone (7mm, 1.47cts), Teal Diamonds (HTHP, .13tcw) and Blue Sapphires (.14tcw) in granulated 22kt yellow gold on a forged and oxidized sterling silver tapered band, 15.3 to 8mm wide. 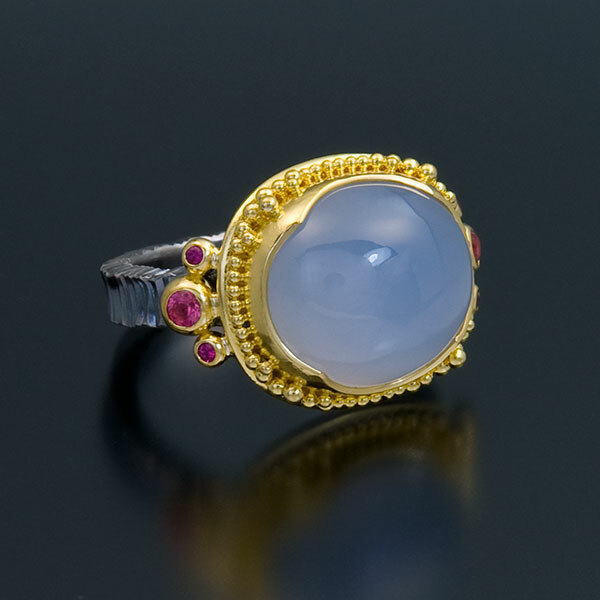 Rins is set with a Blue Moonstone (10.5×7.7mm, 2.91cts), Pink Sapphires (.08tcw) and Rubies (.05tcw) in granulated 22kt yellow gold on a forged and oxidized sterling silver band, 4mm wide. 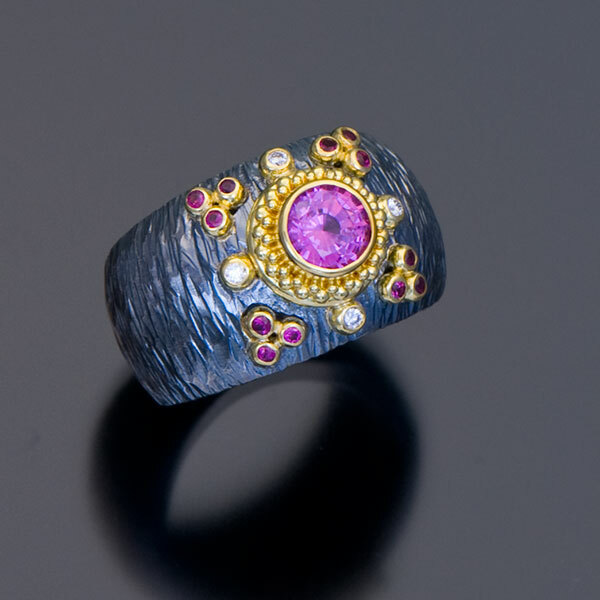 Ring is set with a Sunset Zircon (10x7mm, 2.46cts) and Purple Sapphires (2@3mm, .20tcw) in granulated 22kt yellow gold on a forged and oxidized sterling silver band, 4mm wide. 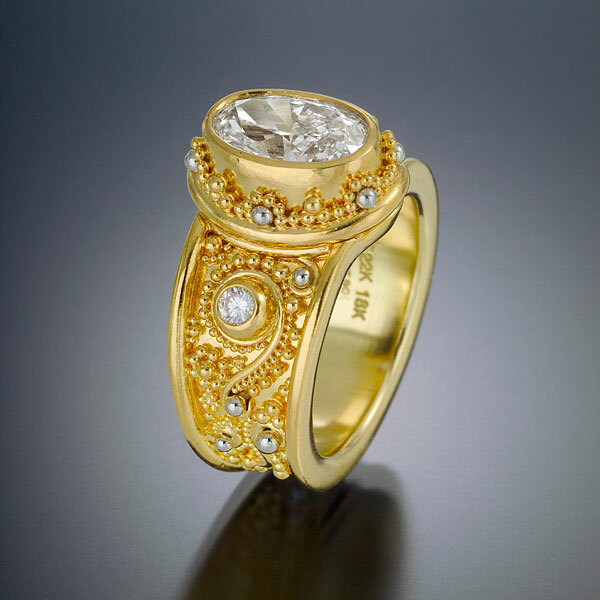 Ring is set with a Champagne rose-cut Diamond (.59cts) in granulated 22kt yellow gold with an 18kt yellow gold band. 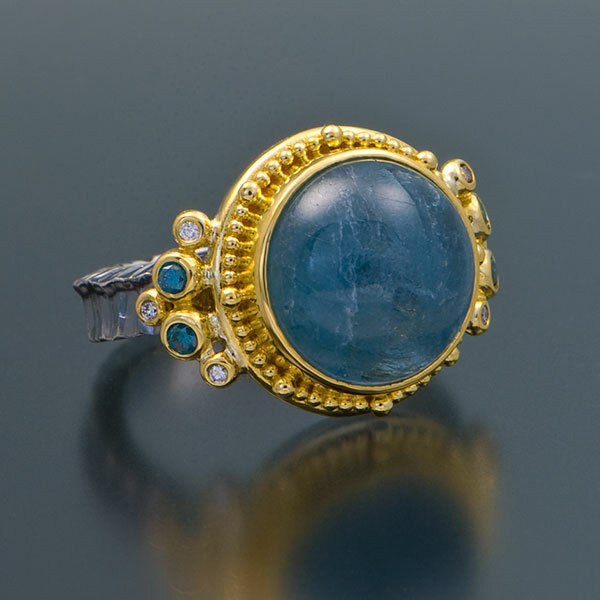 Ring is set with a Blue Moonstone (.99cts) and a Chrome Tourmaline (.04cts) in granulated 22kt yellow gold with a forged and oxidized, bamboo textured sterling silver band, 2mm wide. 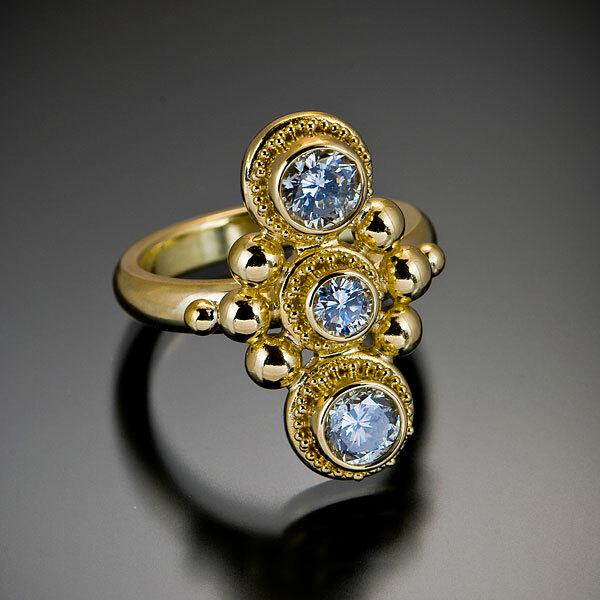 Ring is set with a Blue Zircon (3.88cts) and Diamonds (.16tcw) in granulated 22kt yellow gold with an 18kt yellow gold band. 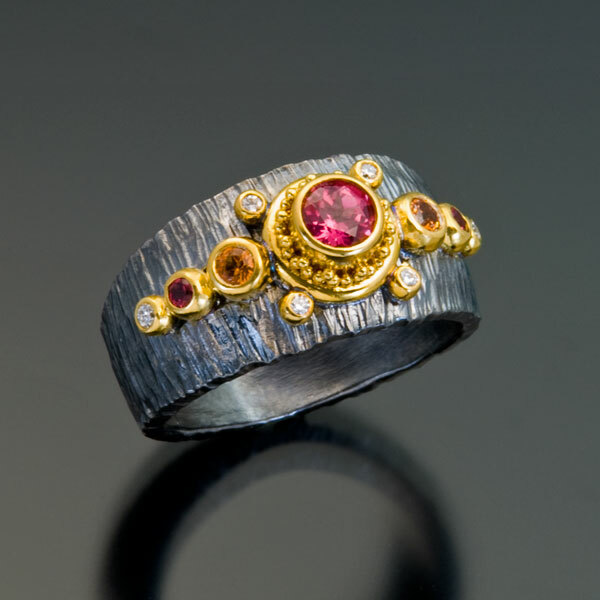 These wedding bands are in 22kt yellow gold with a hammer-texture finish and are each set with a secret Ruby on the inside of the band. 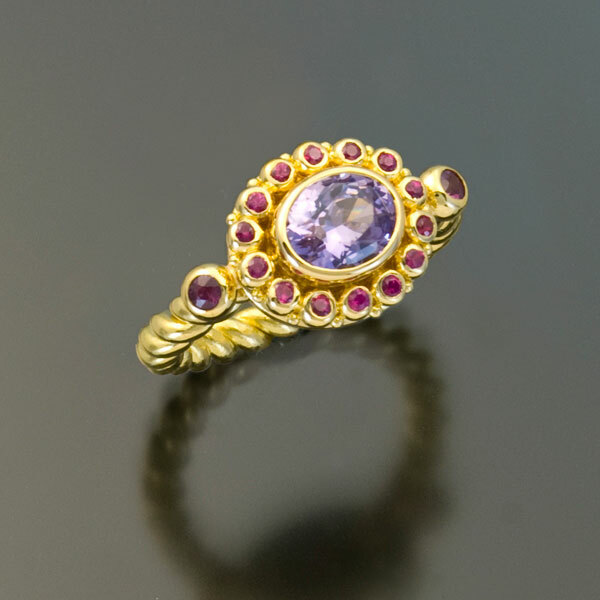 Ring is set with a Rubellite Tourmaline cabochon (7.5mm, 2.75cts) and Pink Sapphires (.24tcw) in granulated 22kt yellow gold on a forged and oxidized sterling silver band 4mm wide. 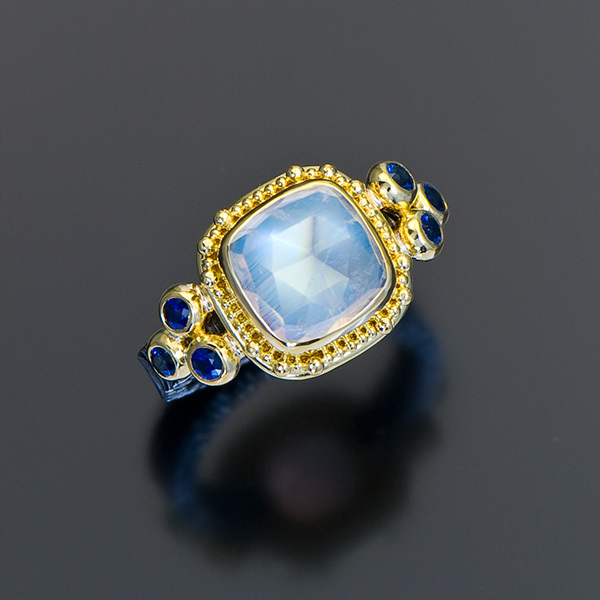 Ring is set with a rose-cut Moonstone (12.1mm, 5.60cts) and Blue Sapphires (.42tcw) in granulated 22kt yellow gold on a forged and oxidized sterling silver band 4mm wide. 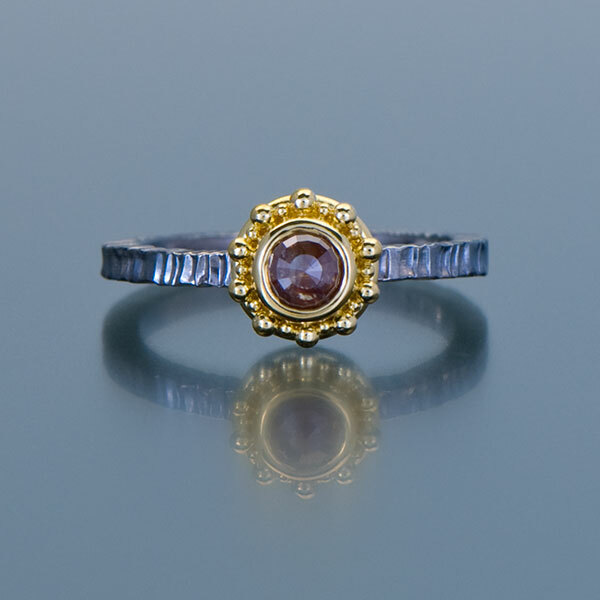 Ring is set with a Peach Sapphire (5x7mm, 1.01cts), Purple Sapphires (.24tcw) and Red Spinels (.16tcw) in granulated 22kt yellow gold on a forged and oxidized sterling silver tapered band (13 to 7mm). 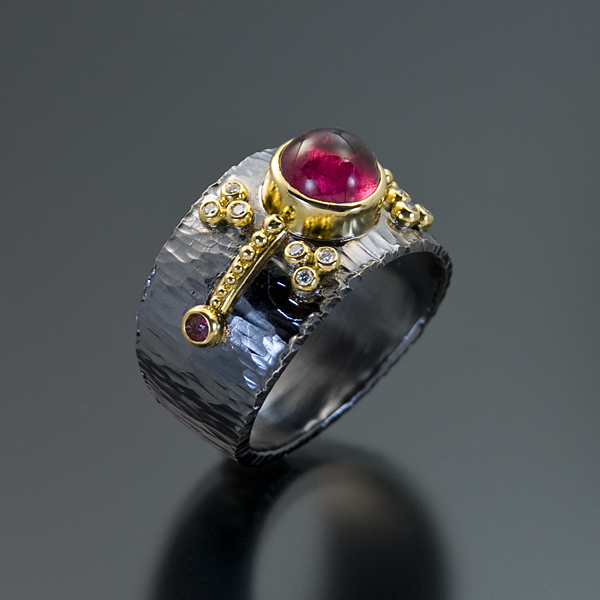 Ring is set with a Rubellite Tourmaline (6x8mm, 1.38cts), Red Spinels (.48tcw) and Diamonds (.04tcw) on a forged and oxidized sterling silver tapered band (14.8mm to 7.8mm). 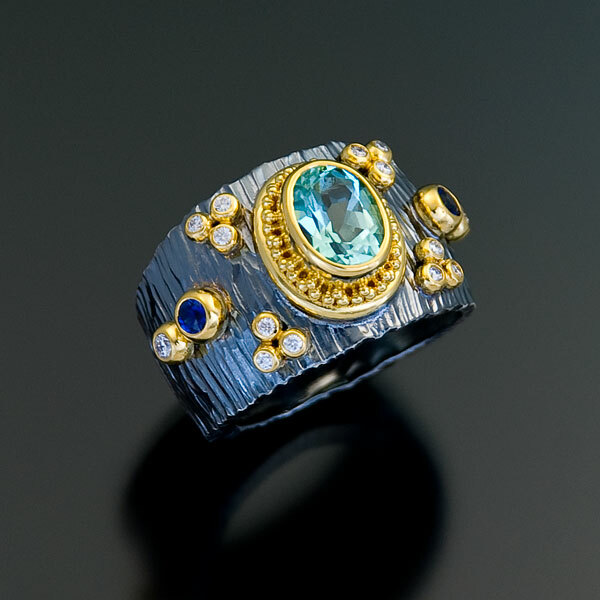 Ring is set with a Green Beryl (6x8mm, 1.12cts), Blue Sapphires (.14tcw) and Diamonds (.20tcw) in granulated 22kt yellow gold on a forged and oxidized sterling silver tapered band (14.5mm to 7.5mm). 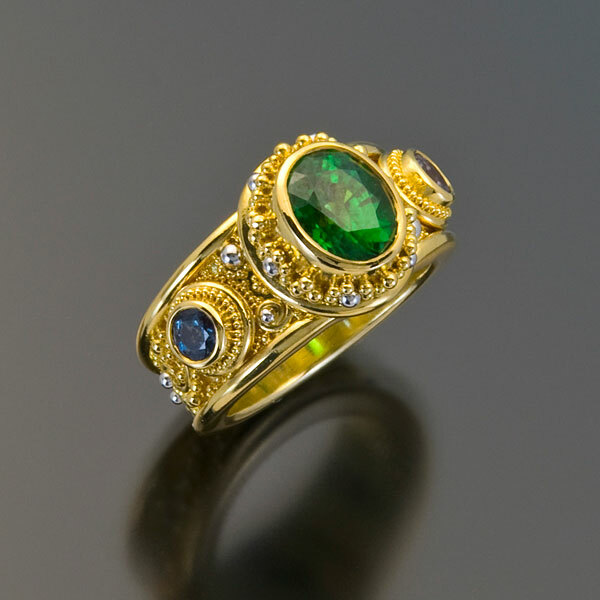 Ring is set with a Green Tourmaline (6.5x8mm, 1.08cts) and Diamonds (.14tcw) in granulated 22kt yellow gold with a forged and oxidized sterling silver band, 4mm wide. 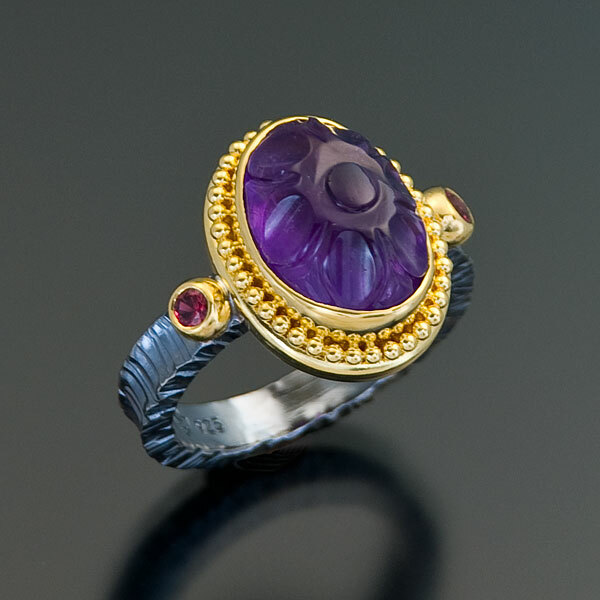 Ring is set with a carved Amethyst (10x14mm, 7.08cts) and Red Spinels (.16tcw) in granulated 22kt yellow gold on a forged and oxidized sterling silver band, 4mm wide. 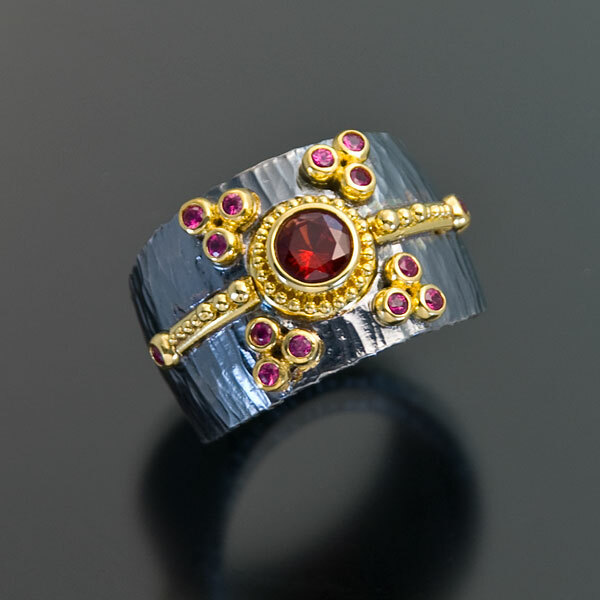 Ring is set with a Sunset Zircon (6mm, 1.53cts) and Red Spinels (.22tcw) in granulated 22kt yellow gold on a forged and oxidized sterling silver tapered band (12.7mm to 7.2mm at the back). 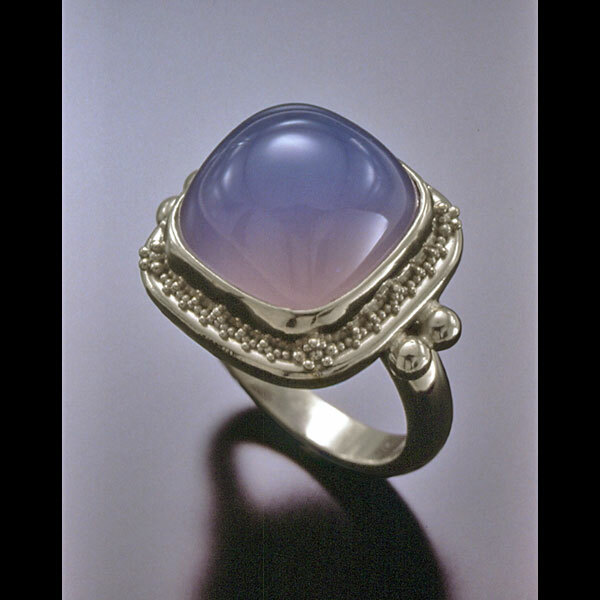 Ring is set with a Purple Moonstone (.40cts) in granulated 22kt yellow gold on a forged, oxidized sterling silver double 4mm band. 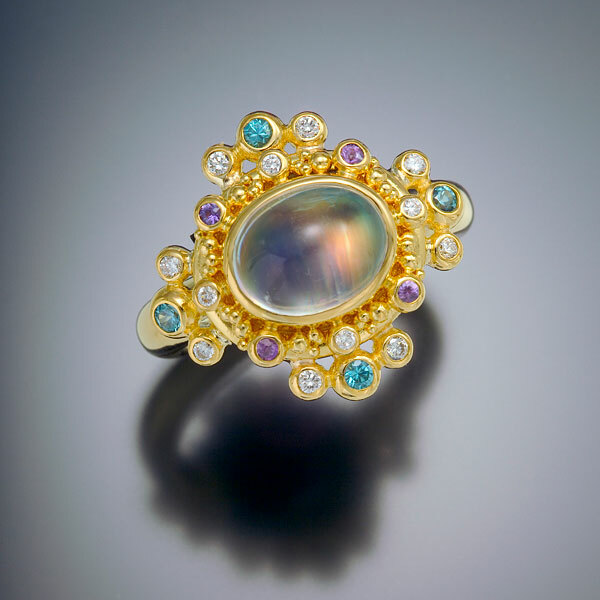 Ring is set with a rose-cut Blue Moonstone (10.8mm, 4.30cts), Blue Sapphires (2.5mm, .14tcw) and Diamonds (1.5mm, .06tcw) in granulated 22kt yellow gold on a forged and oxidized sterling silver band 4mm wide. 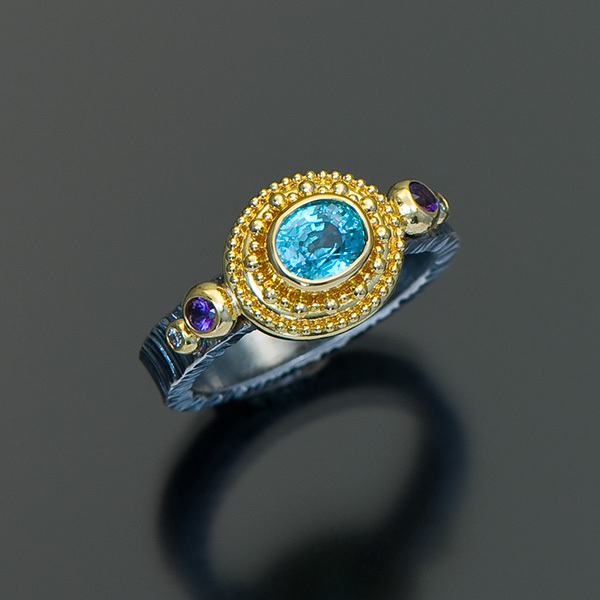 Ring is set with an Aquamarine (.94cts), Diamonds (.12tcw) and Purple Sapphires (.08tcw) in granulated 22kt yellow gold on a forged and oxidized sterling silver band. 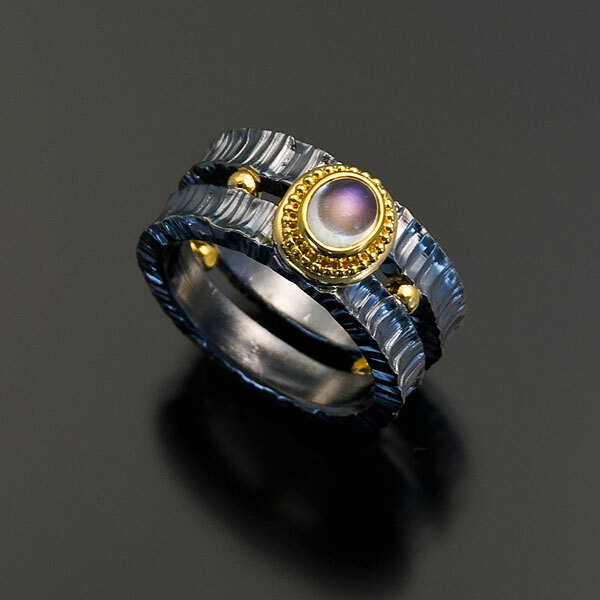 Band tapers from 14.6mm to 7.6mm. 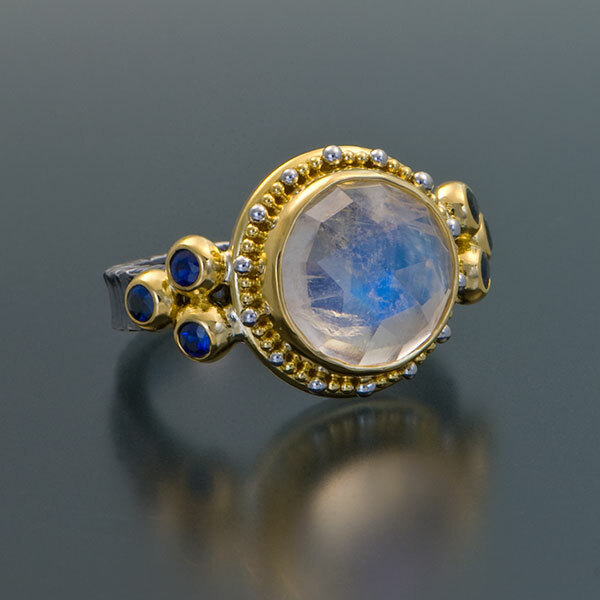 Ring is set with a Moonstone (.94cts), Blue Diamonds (.16tcw) and White Diamonds (.32tcw) in granulated 22kt yellow gold on a forged and oxidized sterling silver band. 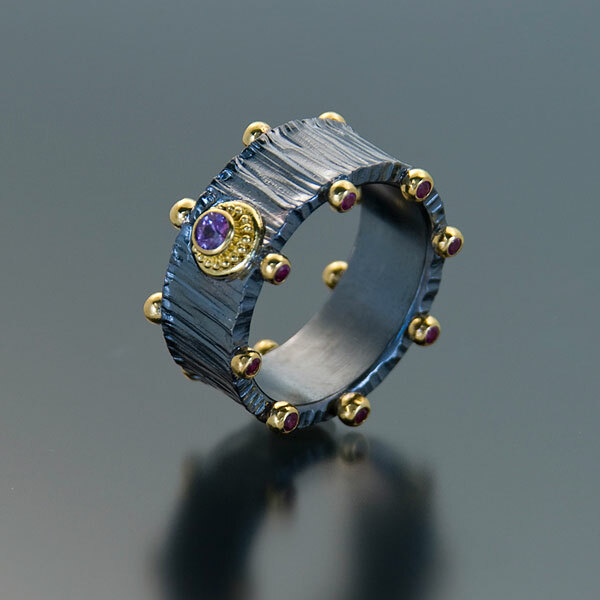 Band tapers from 12.75mm to 7.5mm. 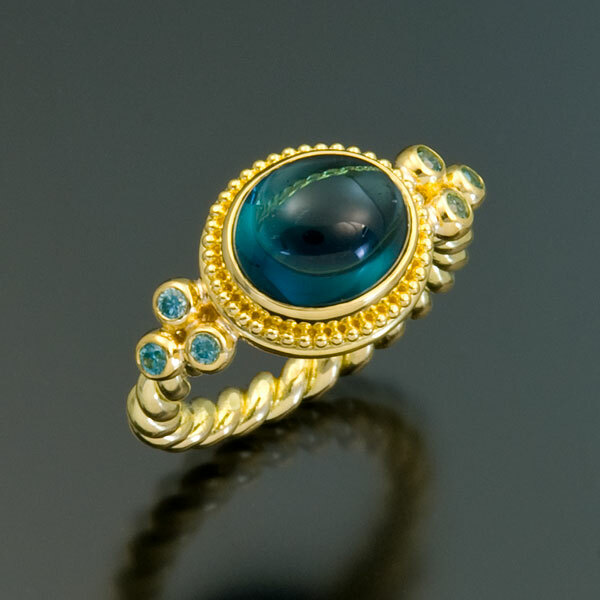 Ring is set with a Blue-Green Tourmaline cabochon (5.29cts) and Blue Zircons (.30tcw) in granulated 22kt yellow gold with an 18kt yellow gold band. 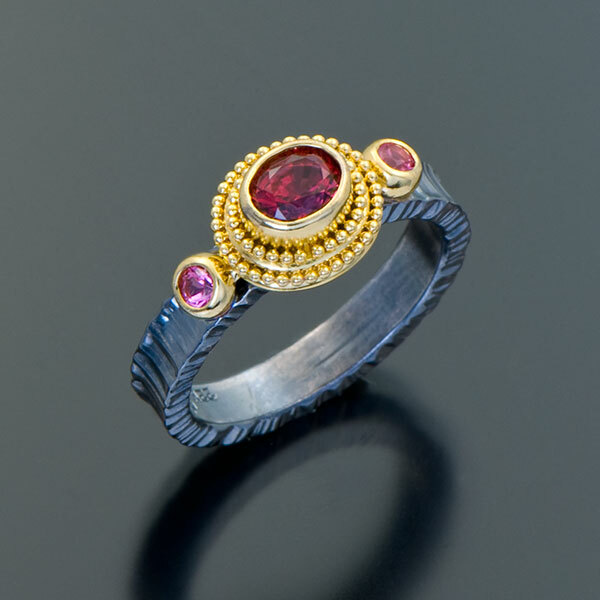 Ring is set with a Sunset Zircon (2.46cts) and Red Spinels (.12tcw) in granulated 22kt yellow gold with a forged and oxidized sterling silver band. 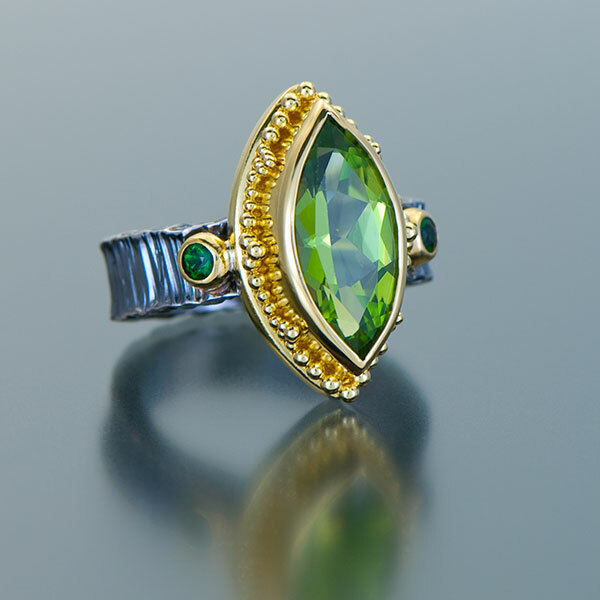 Ring is set with a Chrysoberyl (1.75cts) and Chrome Tourmalines (.24tcw) in granulated 22kt yellow gold with a forged and oxidized sterling silver band. 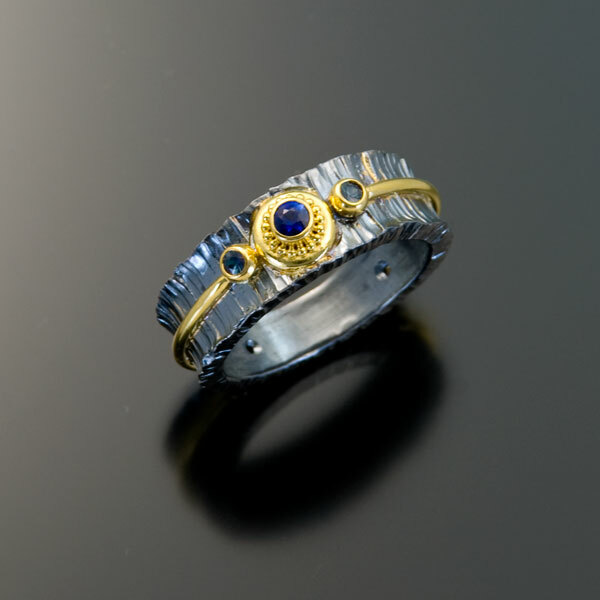 Band tapers from 15mm wide to 8.5mm wide. 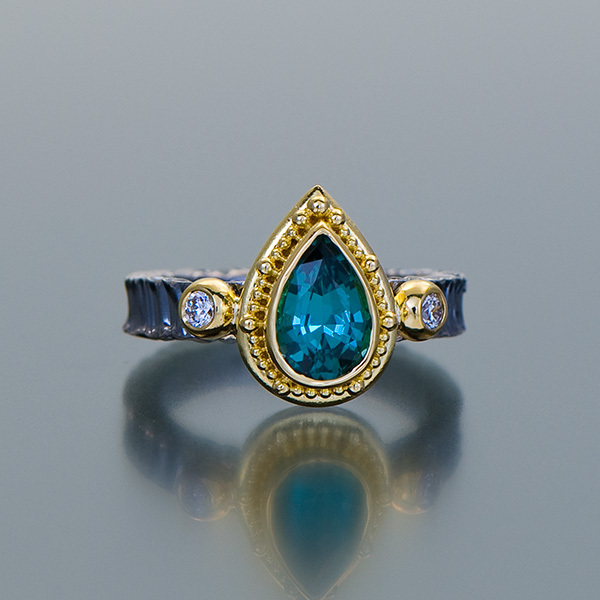 Ring is set with a Mint Green Tourmaline (.80cts), Blue Sapphires (.14tcw) and Diamonds (.23tcw) in granulated 22kt yellow gold on a forged and oxidized sterling silver band. 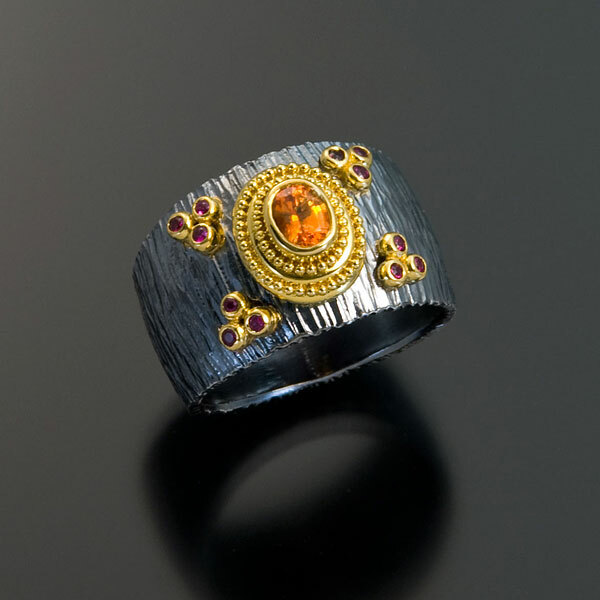 Band tapers from 15mm wide to 7.5mm wide. 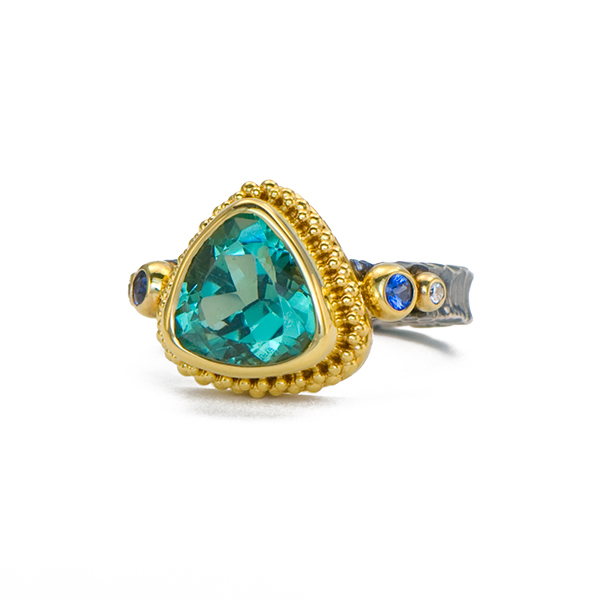 Ring is set with a Mint Green Tourmaline (5x7mm, .80cts) and Diamonds (.06tcw) in granulated 22kt yellow gold on a forged and oxidized sterling silver band, 4mm wide. 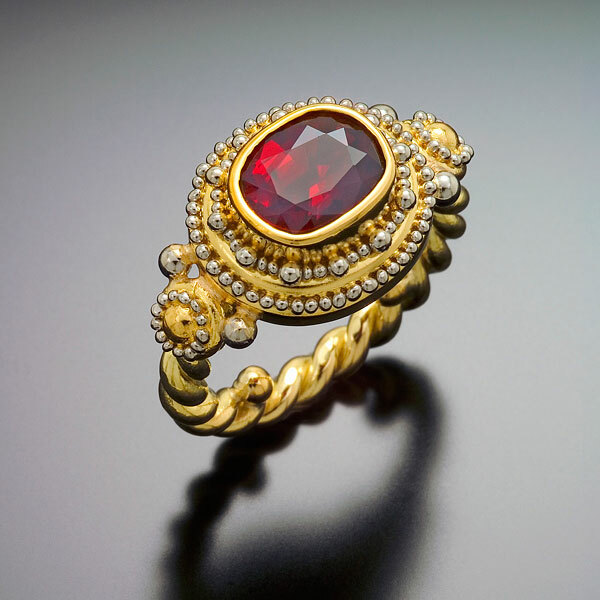 Ring is set with a Padparadscha Sapphire (.43cts), Red Spinels (.08tcw), Mandarin Garnets (.18tcw) and Diamonds (.07tcw) in granulated 22kt yellow gold on a forged and oxidized sterling silver band, 11mm wide tapering to 5.5mm wide at the back. 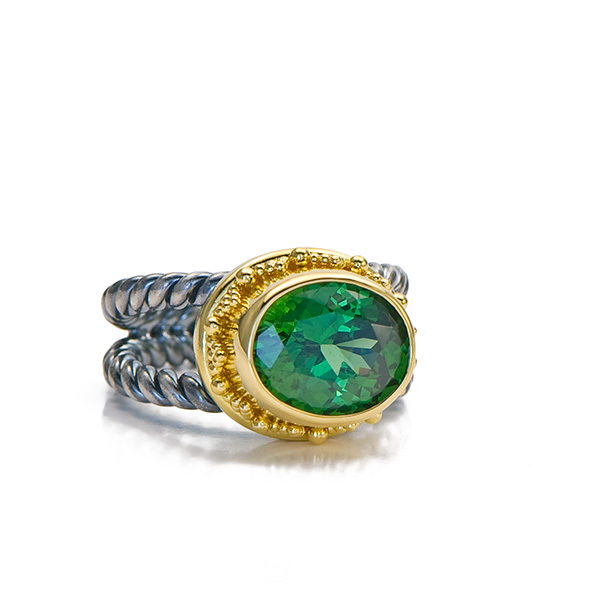 Ring is set with a Chrome Green Tourmaline (.33cts) and Mint Green Tourmalines (.24tcw) in granulated 22kt yellow gold on a forged and oxidized sterling silver band, 11mm wide tapering to 4.5mm at the back. 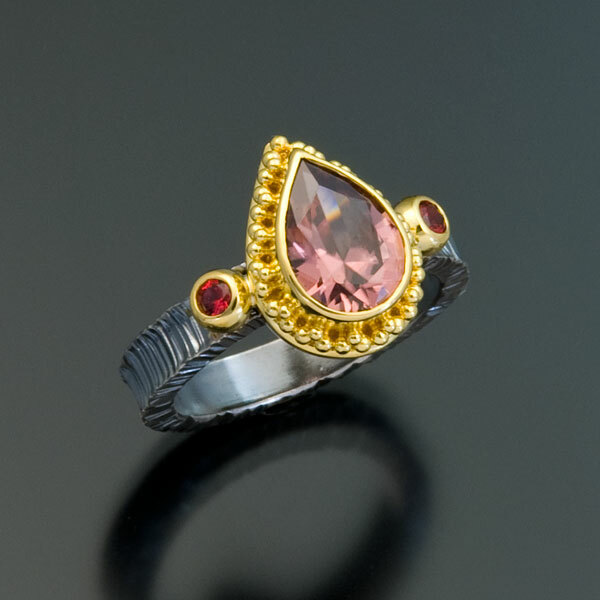 Ring is set with a Pink Tourmaline cabochon (2.70cts), Red Spinels (.16tcw) and Diamonds (.12tcw) in granulated 22kt yellow gold on a forged and oxidized sterling silver band, 14mm wide tapering to 7.25mm at the back. 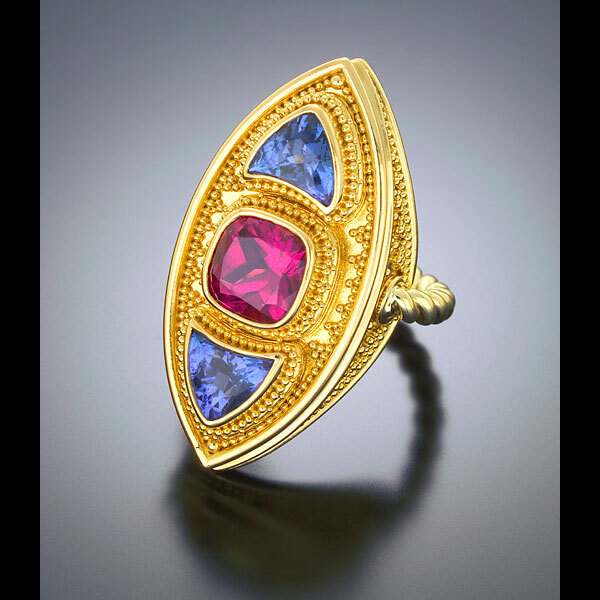 Ring is set with a Tanzanite cabochon (5.01cts), Hot Pink Sapphires (.09tcw) and Blue Zircons (.30tcw) in granulated 22kt yellow gold on a forged and oxidized sterling silver band. 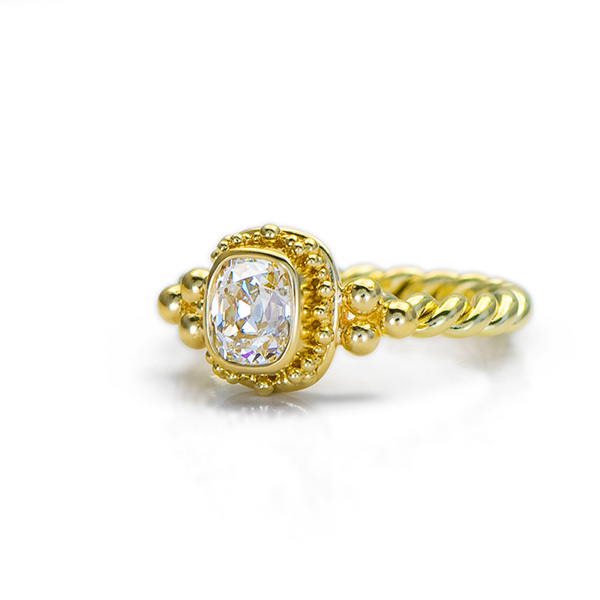 Ring is set with a cushion-cut Diamond (1.50cts) in granulated 22kt yellow gold with an 18kt yellow gold band. 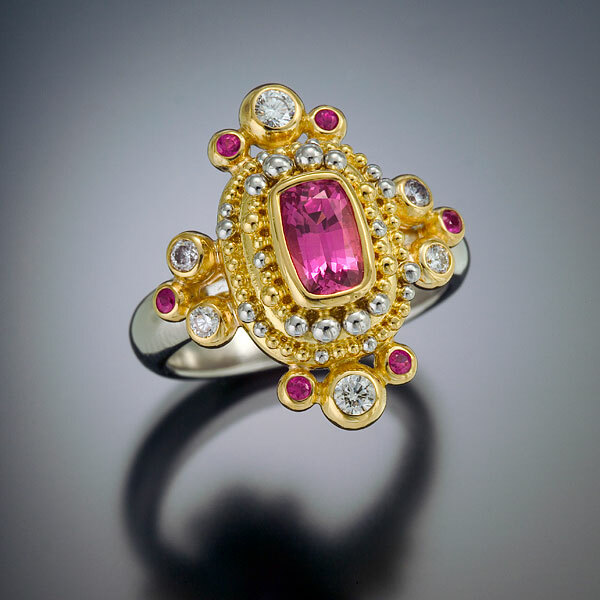 Ring is set with a Pink Spinel (2.01cts), Hot Pink Sapphires (.28tcw) and Padparadscha Sapphires (.14tcw) in granulated 22kt yellow gold with an 18kt yellow gold half-round band. 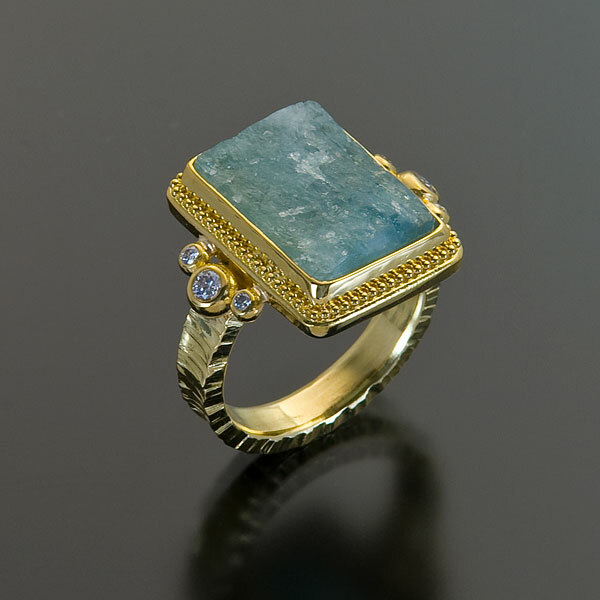 Ring is set with an Aquamarine natural crystal surface tile (14.20cts), faceted Aquamarines (.10tcw) and Diamonds (.06tcw) in granulated 22kt yellow gold with an 18kt yellow gold bamboo textured band. 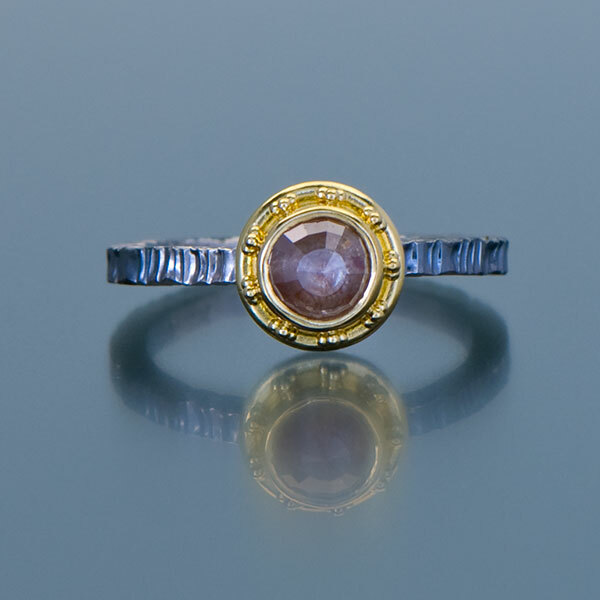 Ring is set with a Pink Tourmaline (1.34cts) and Pink Sapphires (.31tcw) in granulated 22kt yellow gold on a forged and oxidized sterling silver band, 5/8″ wide tapering to 1/4″ wide. 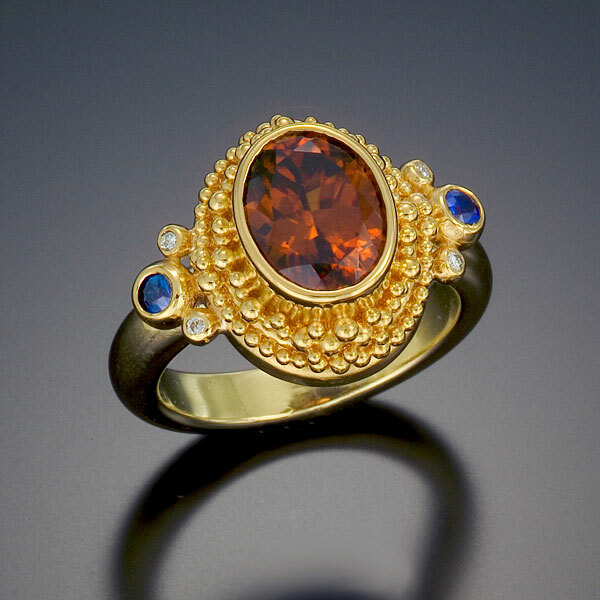 Ring is set with an Orange Sapphire (.31cts) and Hot Pink Sapphires (.13tcw) in granulated 22kt yellow gold on a forged and oxidized sterling silver band, 5/8″ wide tapering to 1/4″ wide. 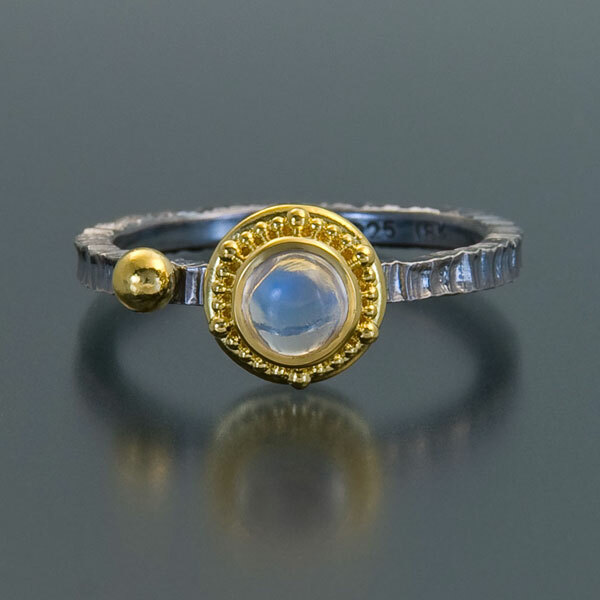 Ring is set with a Rainbow Moonstone (.62cts) in granulated 22kt yellow gold with a forged and oxidized, bamboo textured sterling silver band, 2mm wide. 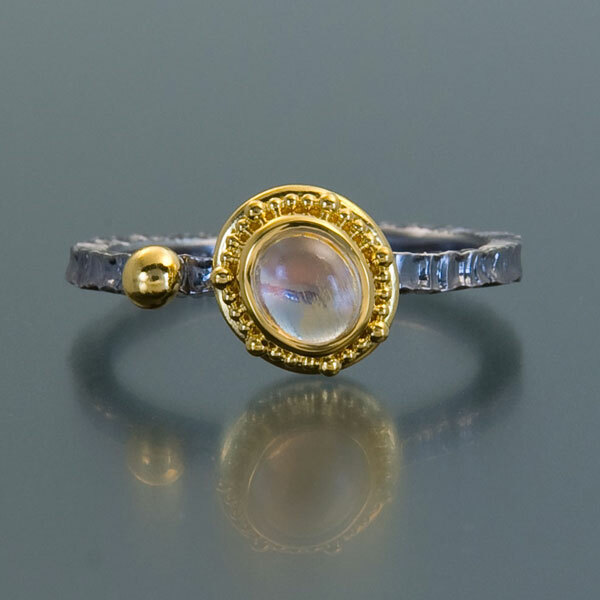 Ring is set with a Rainbow Moonstone (.63cts) in granulated 22kt yellow gold with a forged and oxidized, bamboo textured sterling silver band, 2mm wide. 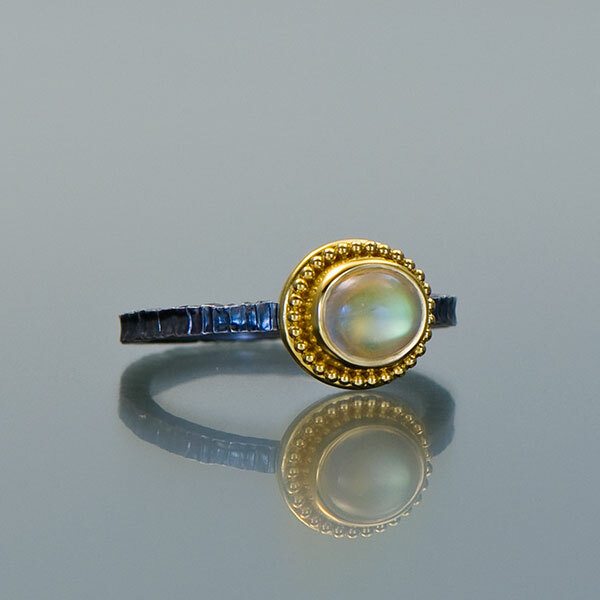 Ring is set with a Rainbow Moonstone (.40cts) in granulated 22kt yellow gold with a forged and oxidized, bamboo textured sterling silver band, 2mm wide. 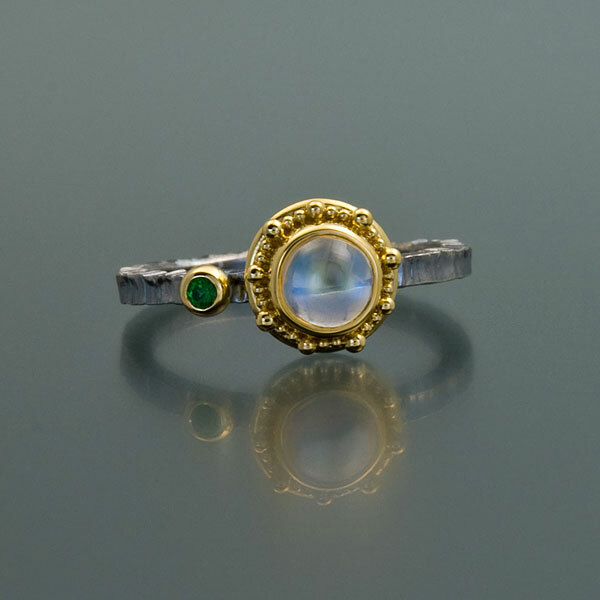 Ring is set with a Rainbow Moonstone (.36cts) and a Mint Green Tourmaline (.04cts) in granulated 22kt yellow gold with a forged and oxidized, bamboo textured sterling silver band, 2mm wide. 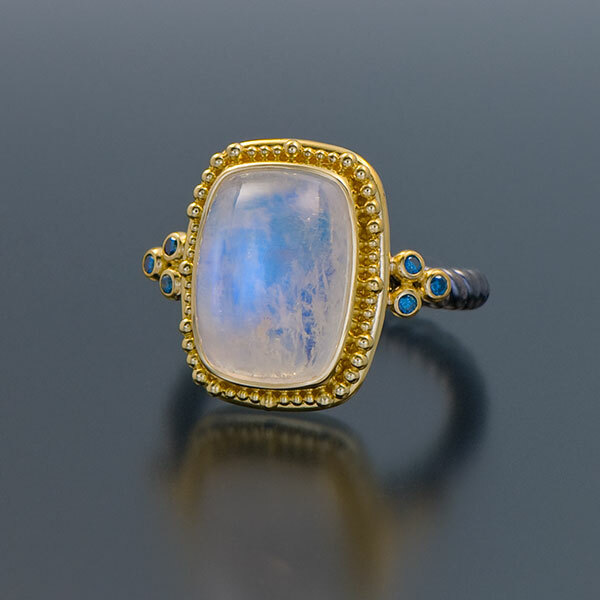 Ring is set with a Rainbow Moonstone (.60cts) and a Blue Zircon (.05cts) in granulated 22kt yellow gold with a forged and oxidized, bamboo textured sterling silver band, 2mm wide. 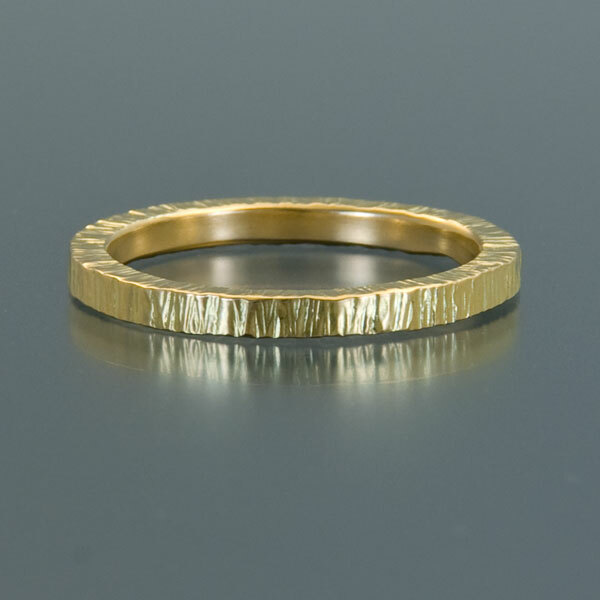 Bamboo textured band, 2mm wide in 18kt yellow gold. 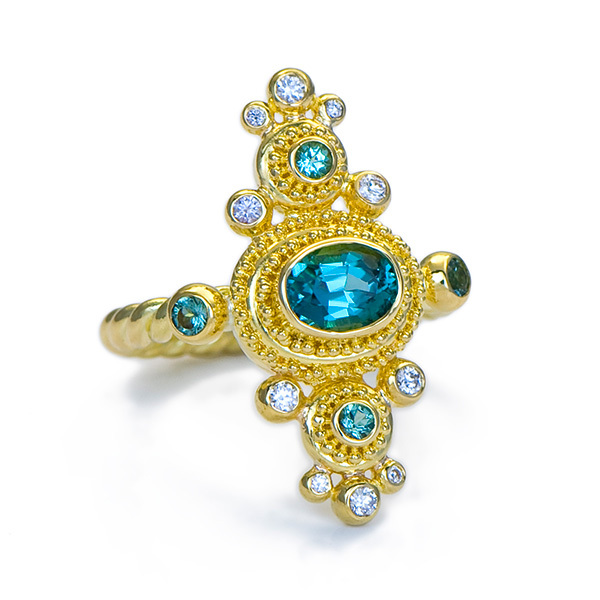 Ring is set with an Aquamarine surface crystal (11.6 x 16.2mm, 9.95cts) and Diamonds (.20tcw) in granulated 22kt yellow gold with an 18kt yellow gold bamboo textured band. 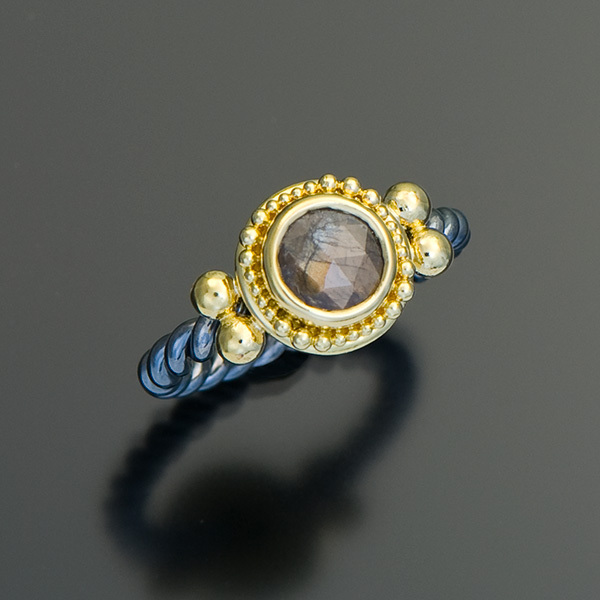 Ring is set with a natural color reddish-brown rose-cut Diamond (2.13cts, 7.52mm) and six white round brilliant-cut Diamonds (.24tcw) in granulated 22kt yellow gold on a forged and oxidized sterling silver tapered band, 14mm wide at the top to 6.5mm wide at the back. 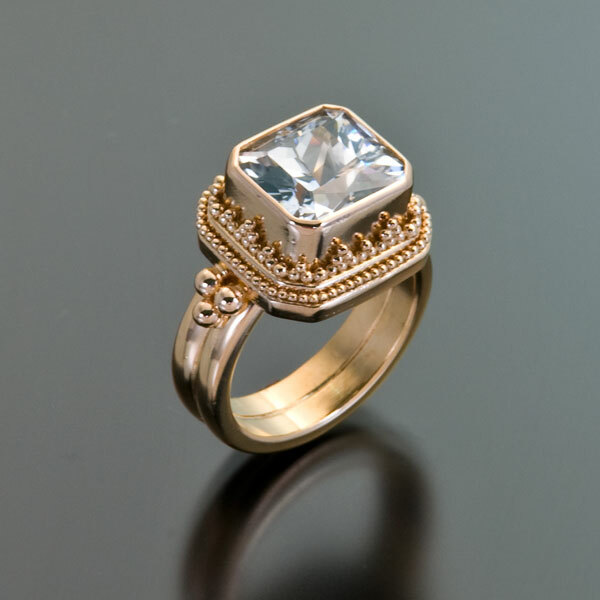 Ring is set with a White Sapphire (8.12cts) in granulated 22kt rose gold. 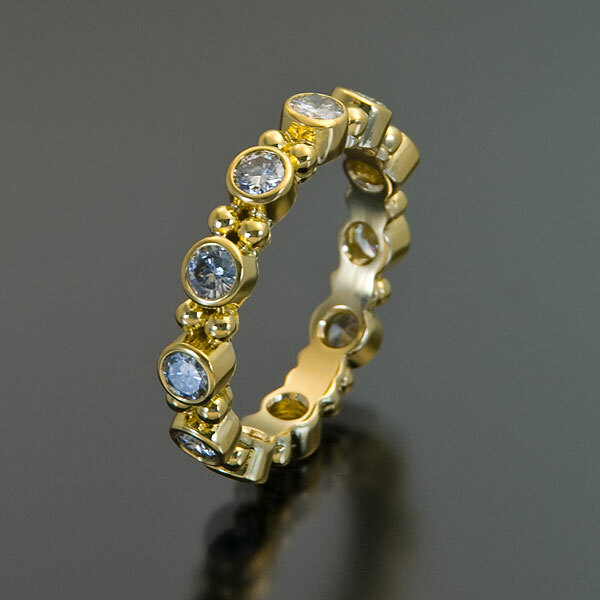 Band is set all the way around with Diamonds (11 @ 1.59tcw, 3.5mm each) in 22kt yellow gold with an 18kt yellow gold inner sleeve. 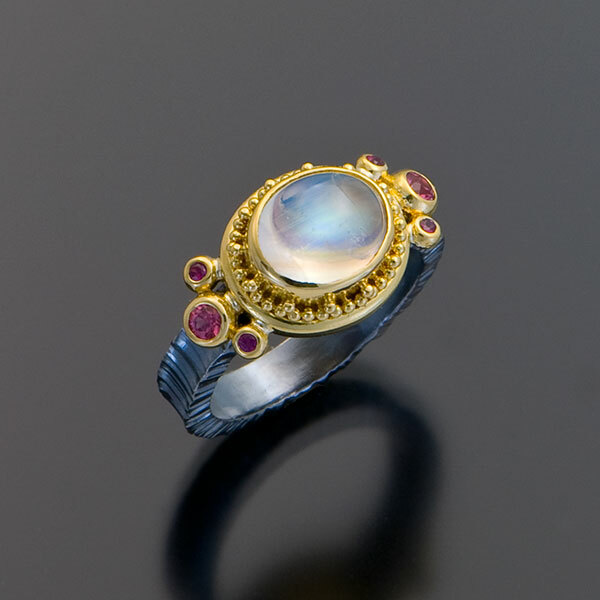 Ring is set with a Moonstone (1.35cts), Blue Sapphires (.14tcw), Lilac Garnets (.12tcw) and Diamonds (.05tcw) in granulated 22kt yellow gold on a forged and oxidized sterling silver band, 5/8″ wide tapering to 1/4″ wide. 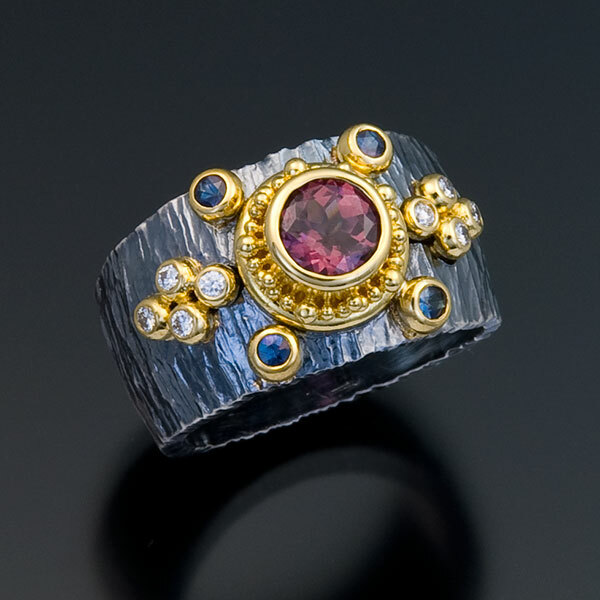 Ring is set with an Anthill Chrome Pyrope Garnet (.49cts) and Hot Pink Sapphires (.28tcw) in granulated 22kt yellow gold on a forged and oxidized sterling silver band, 5/8″ wide tapering to 1/4″ wide. 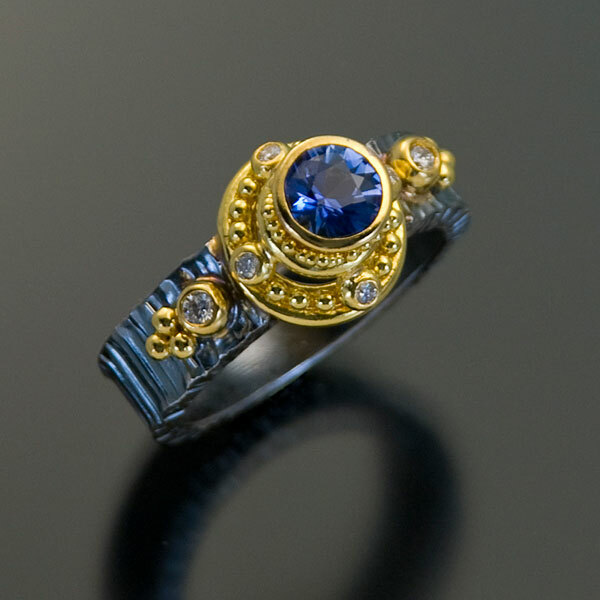 Ring is set with a Blue Sapphire (.12cts), Alexandrites (.06tcw) and Diamonds (.02tcw) in granulated 22kt yellow gold on a forged and oxidized sterling silver band, tapered 6 to 4mm. 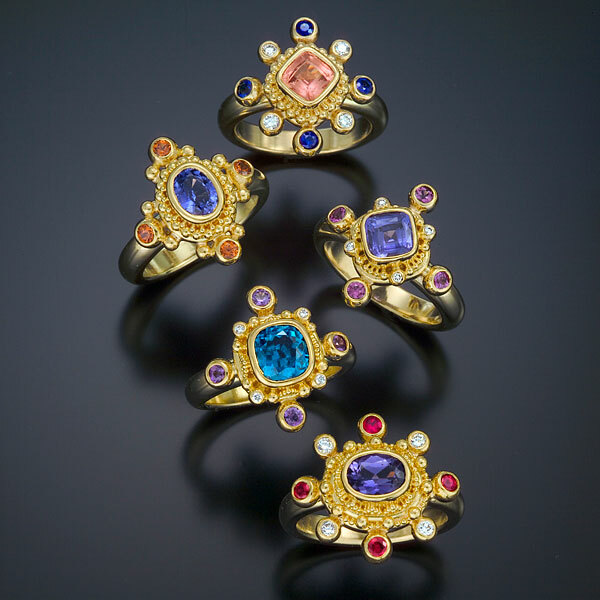 Rings are set with a variety of colored gemstones in four of Zaffiro’s distinctive granulation collections: Classic (all 22kt yellow gold), Chiara (platinum onto 22kt yellow gold), Jacqueline (22kt rose gold) and Meredith (22kt white gold). 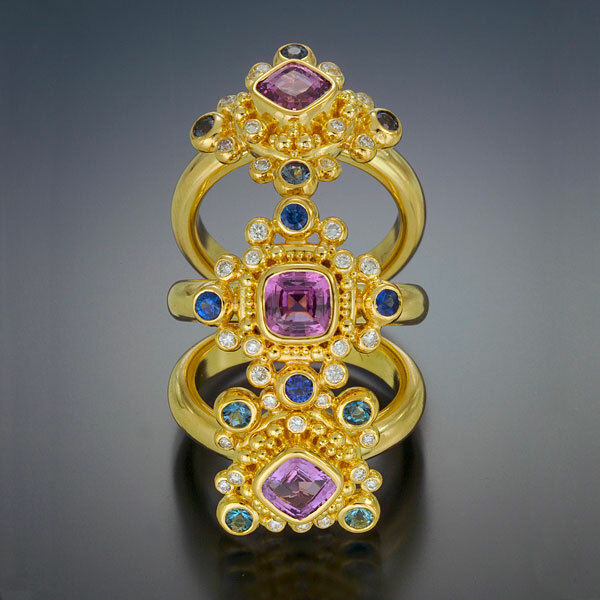 Ring is set with Pink Sapphires and Diamonds in 22kt yellow gold with 22kt yellow gold and Platinum granulation and a Platinum band. 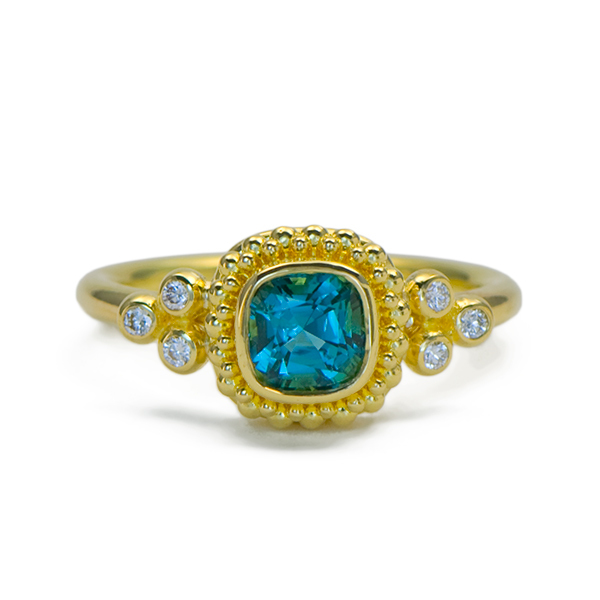 Ring is set with an Indicolite Tourmaline in granulated 22kt yellow gold with an 18kt yellow gold band. 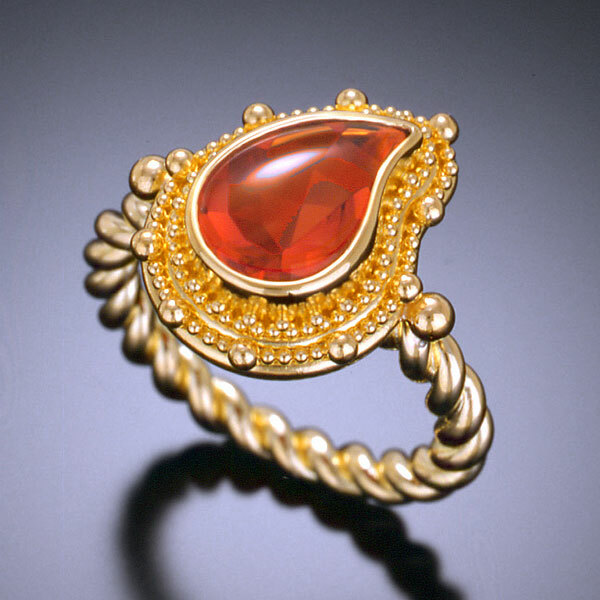 Ring is set with an Orange Sapphire and Diamonds in granulated 22kt yellow gold with an 18kt yellow gold band. 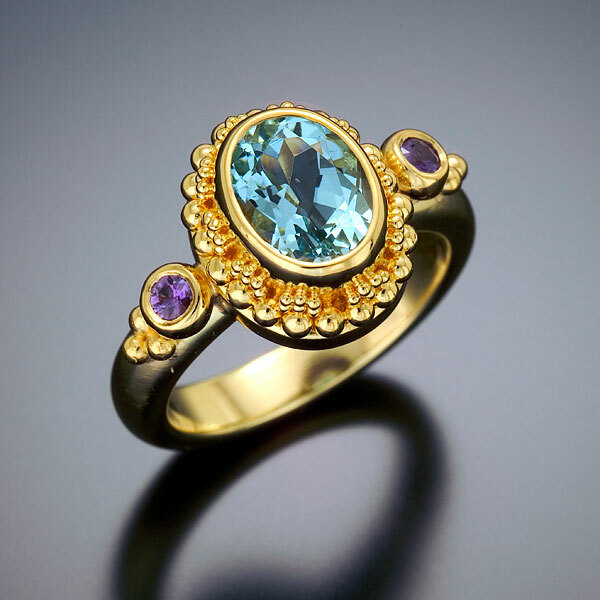 Ring is set with an Aquamarine and Purple Sapphires in granulated 22kt yellow gold with an 18kt yellow gold band. 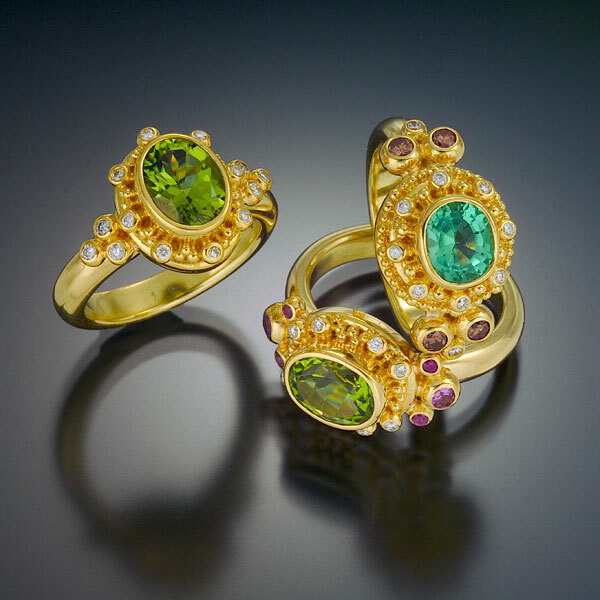 Rings are set with a variety of colored gemstones and Diamonds in granulated 22kt yellow gold with 18kt yellow gold bands. 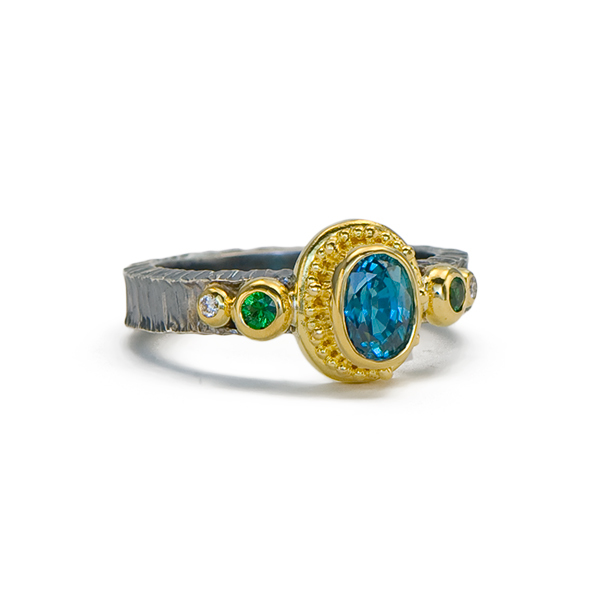 Ring is set with a Green Tourmaline and Blue Sapphire in granulated 22kt yellow gold with an 18kt yellow gold band. 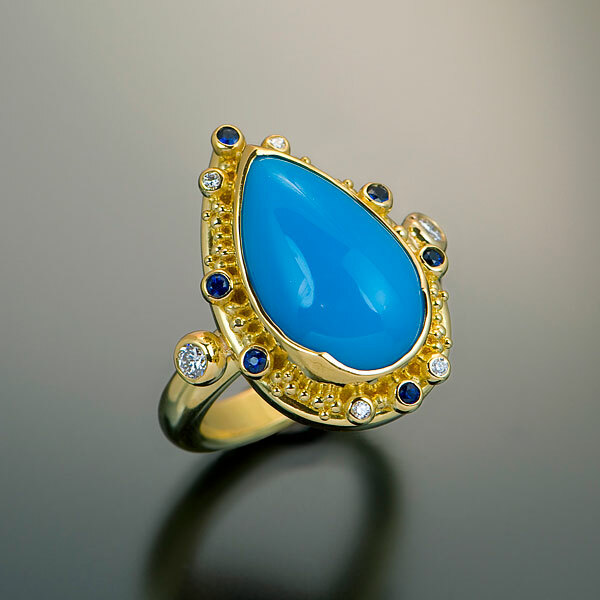 Ring is set with Persian Turquoise, Blue Sapphires and Diamonds in granulated 22kt yellow gold with an 18kt yellow gold band. 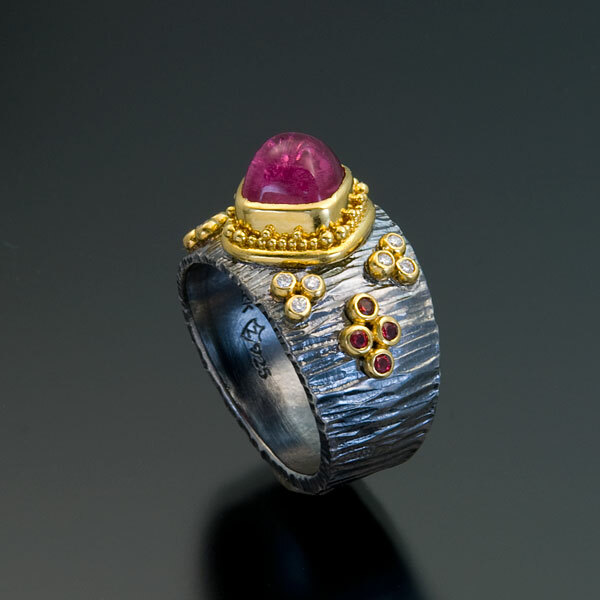 Ring is set with a Silver Spinel in granulated 22kt white gold. 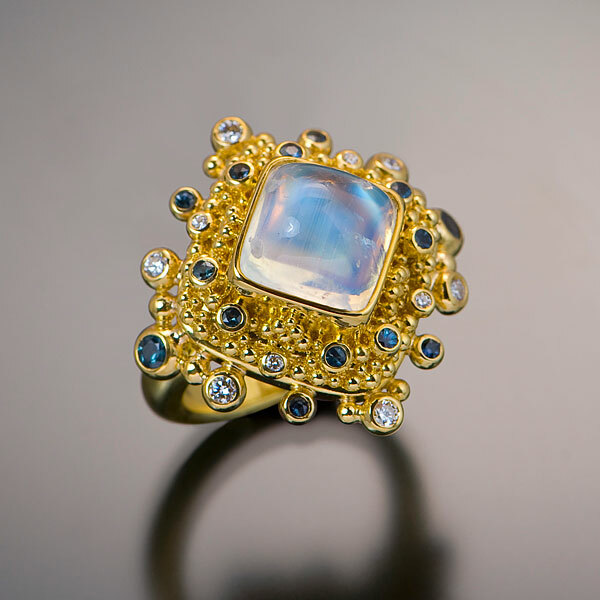 Ring is set with a Blue Moonstone, Alexandrites and Diamonds in granulated 22kt yellow gold with an 18kt yellow gold band. 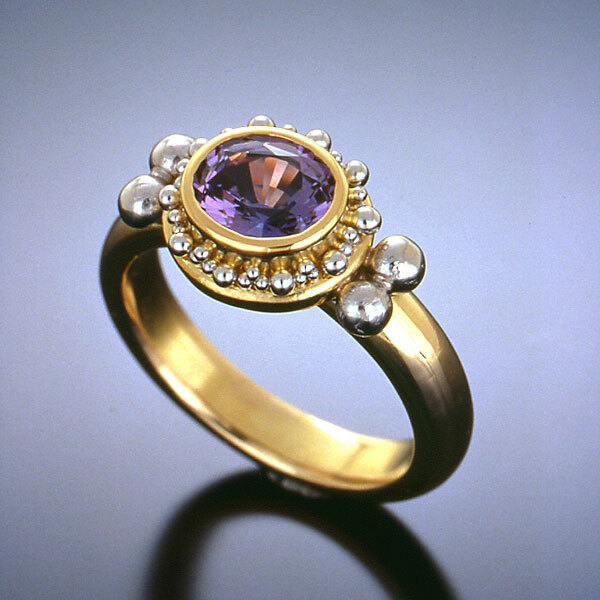 Ring is set with a Spessartite Garnet in granulated 22kt yellow gold with an 18kt yellow gold band. 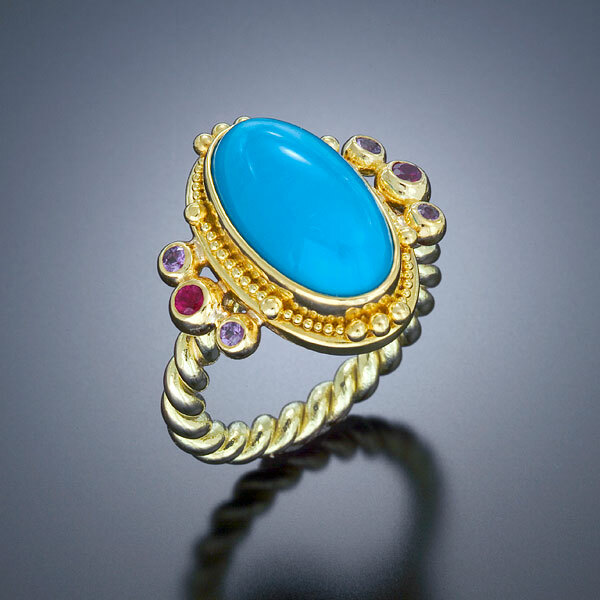 Ring is set with Persian Turquoise, Rubies and Purple Sapphires in granulated 22kt yellow gold with an 18kt yellow gold band. 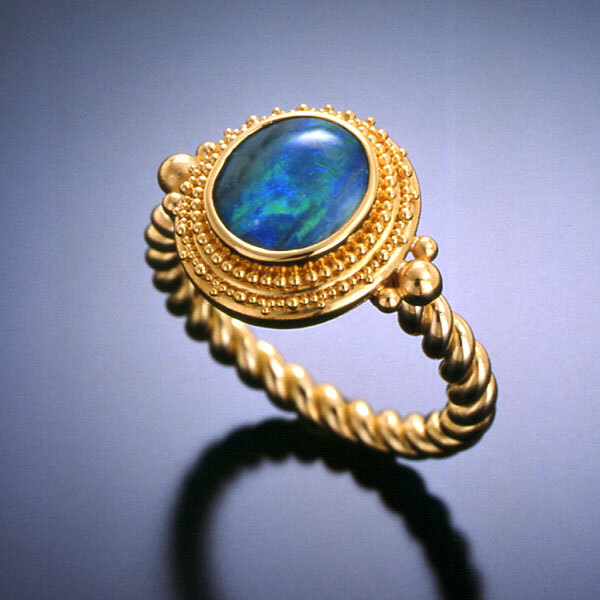 Ring is set with an Australian Boulder Opal in granulated 22kt yellow gold with an 18kt yellow gold band. 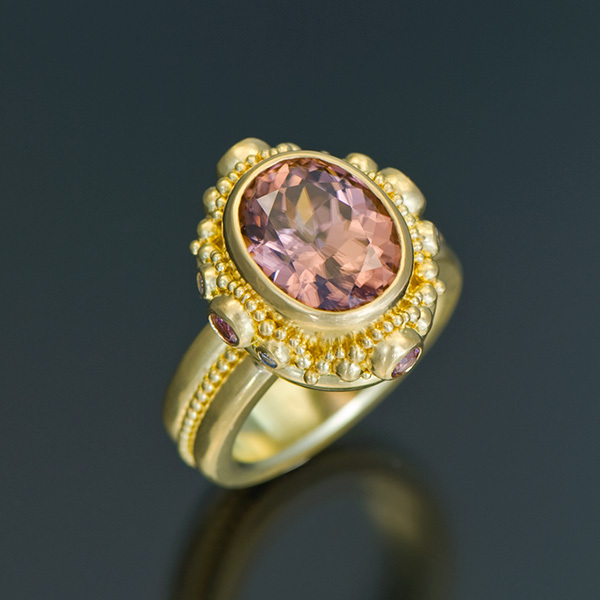 Ring is set with a Rose Zircon in 22kt yellow gold with Platinum granulation and an 18kt yellow gold band. 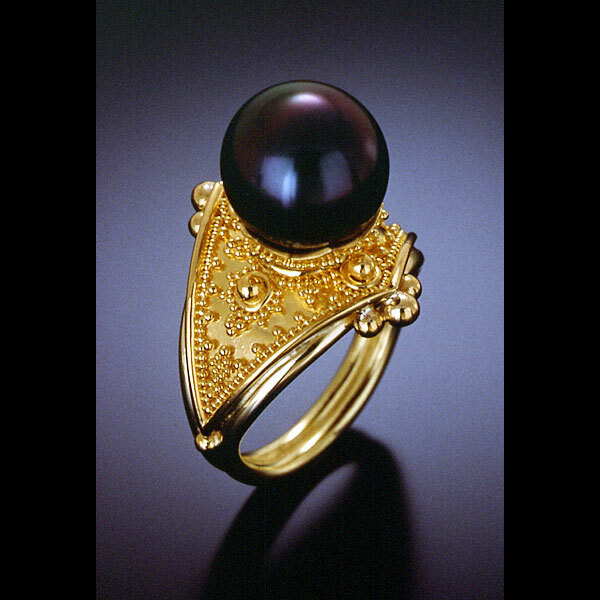 Ring is set with a Black Tahitian Pearl in granulated 22kt yellow gold with an 18kt yellow gold band. 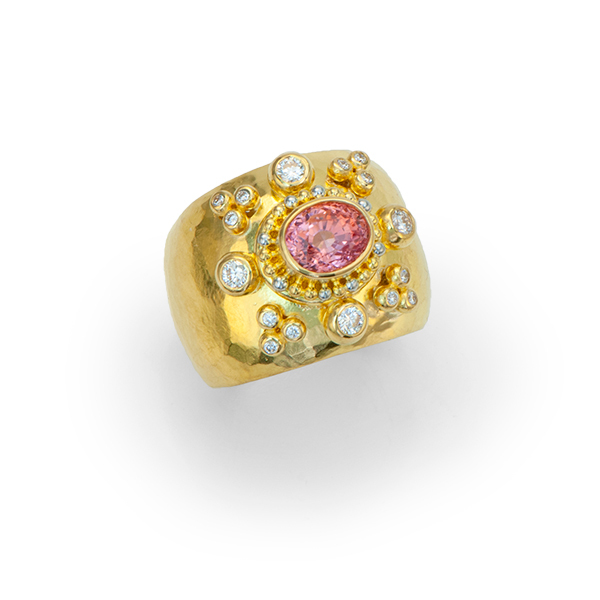 Ring is set with a Champagne Topaz, Pink Sapphires, Cognac Diamonds and White Diamonds in granulated 22kt yellow gold with an 18kt yellow gold band. 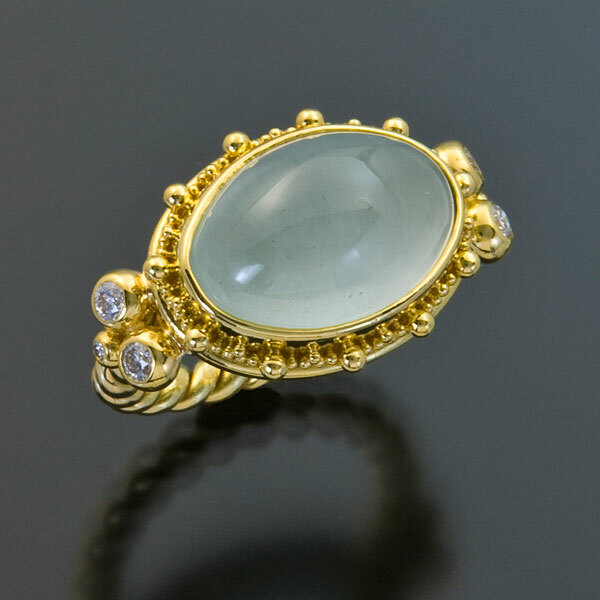 Ring is set with a Green Moonstone, Alexandrites and Diamonds in granulated 22kt yellow gold with an 18kt yellow gold band. 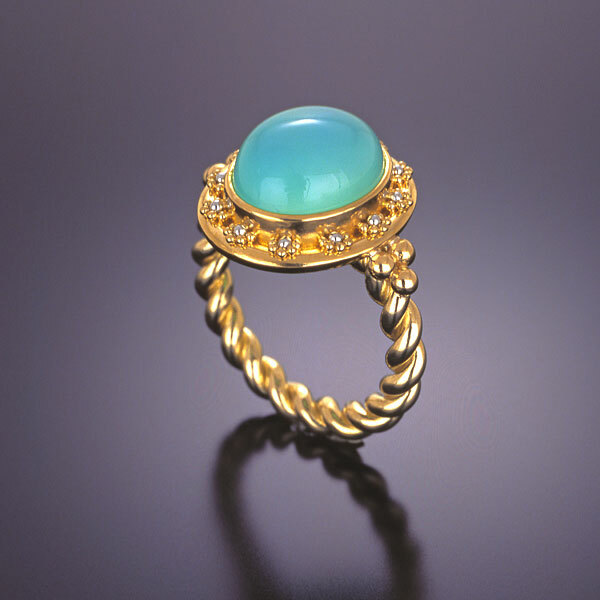 Ring is set with a Peruvian Opal in 22kt yellow gold with 22kt yellow gold and Platinum granulation and an 18kt yellow gold band. 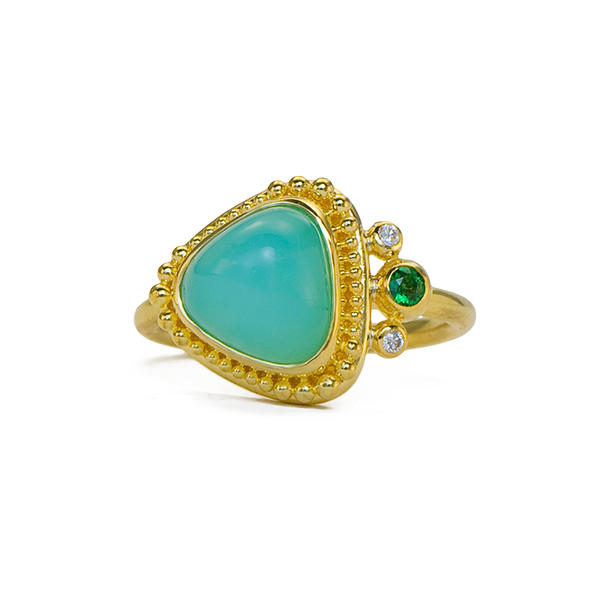 Ring is set with a carved Emerald in granulated 22kt yellow gold with an 18kt yellow gold band. 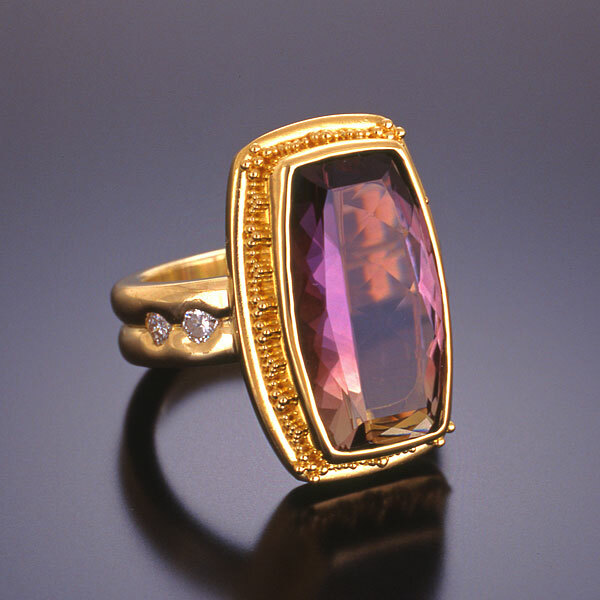 Ring is set with a Bi-Color Tourmaline and Diamonds in granulated 22kt yellow gold with an 18kt yellow gold band. 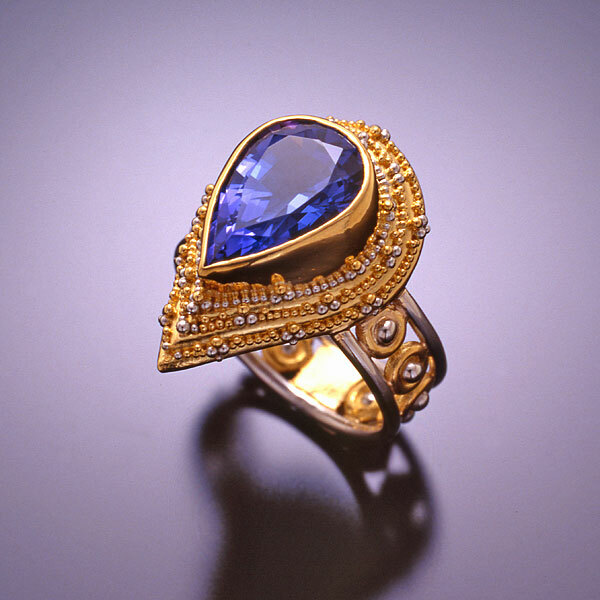 Ring is set with a Tanzanite in 22kt yellow gold with 22kt yellow gold and Platinum granulation and a 22kt yellow gold and Platinum band. 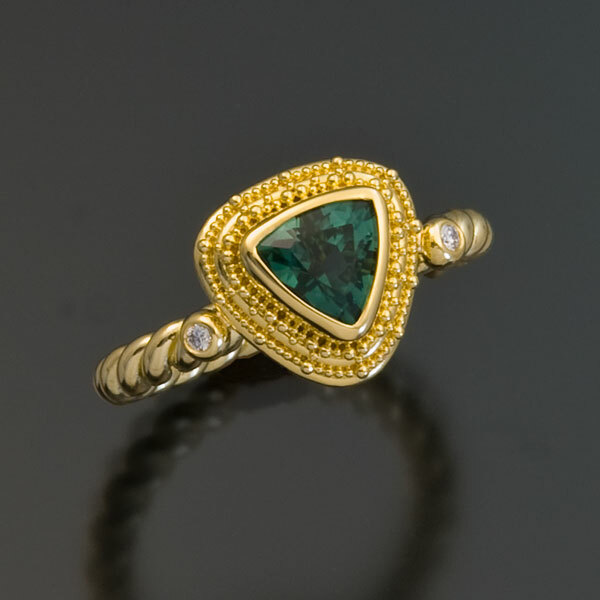 Ring is set with a Green Tourmaline in 22kt yellow gold with Platinum granulation and an 18kt yellow gold band. 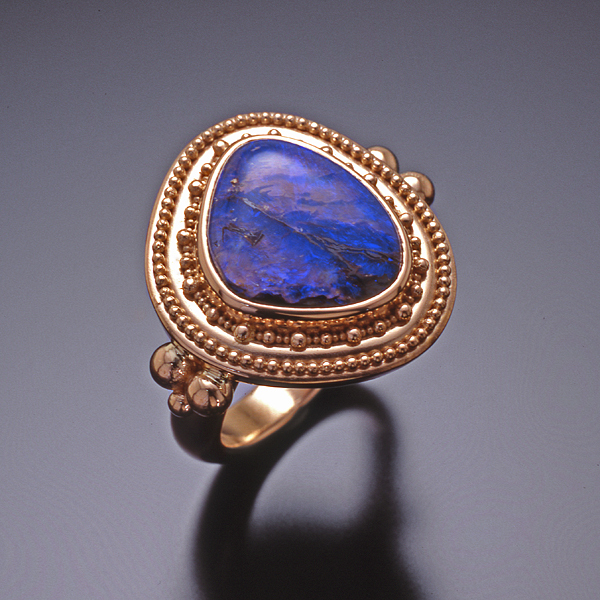 Ring is set with Opalized Petrified Wood in granulated 22kt rose gold. 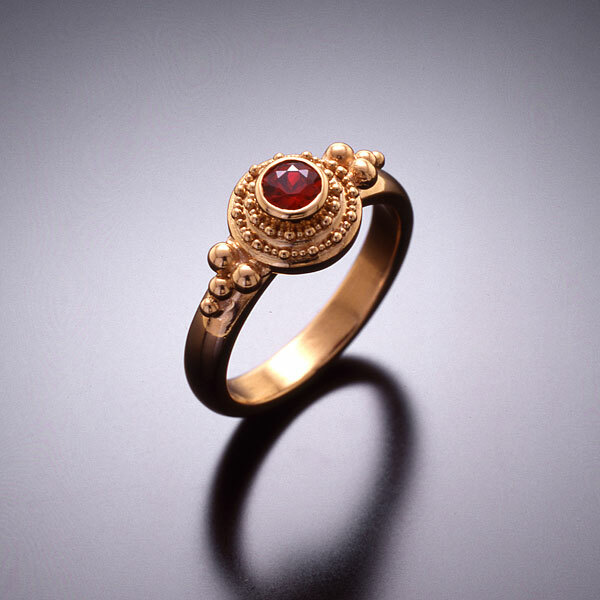 Ring is set with a Ruby in granulated 22kt rose gold. 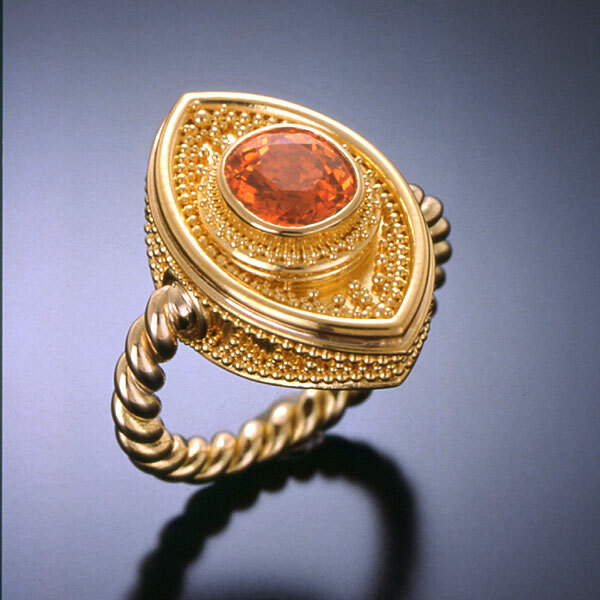 Ring is set with an Oregon Sunstone in granulated 22kt yellow gold with an 18kt yellow gold band. 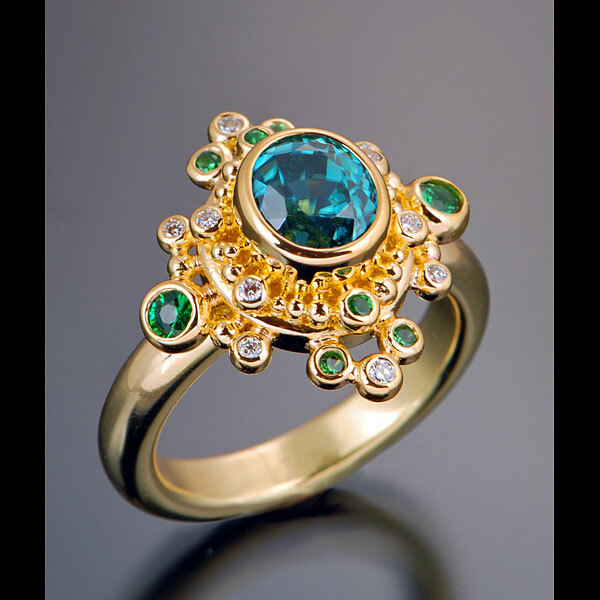 Ring is set with a Green Tourmaline and Blue Sapphires in granulated 22kt yellow gold with an 18kt yellow gold band. 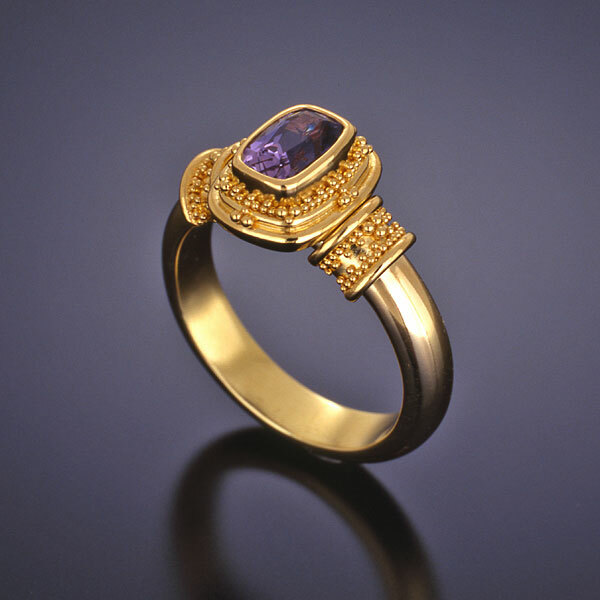 Ring is set with a Purple Sapphire in granulated 22kt yellow gold with an 18kt yellow gold band. 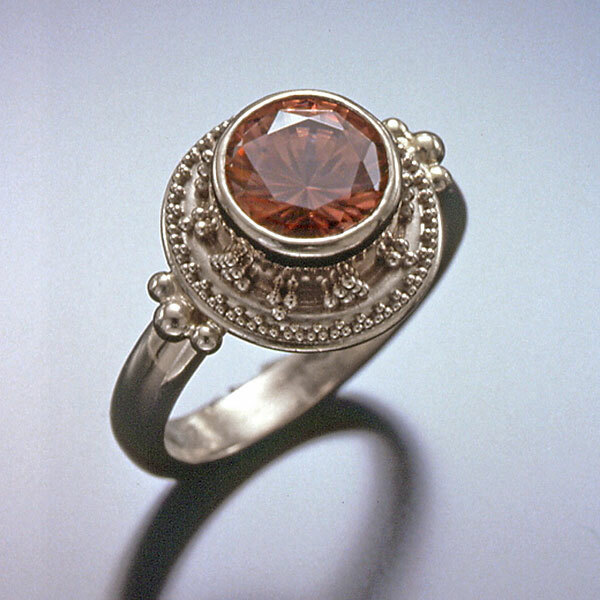 Ring is set with a Rose Zircon in granulated 22kt white gold. 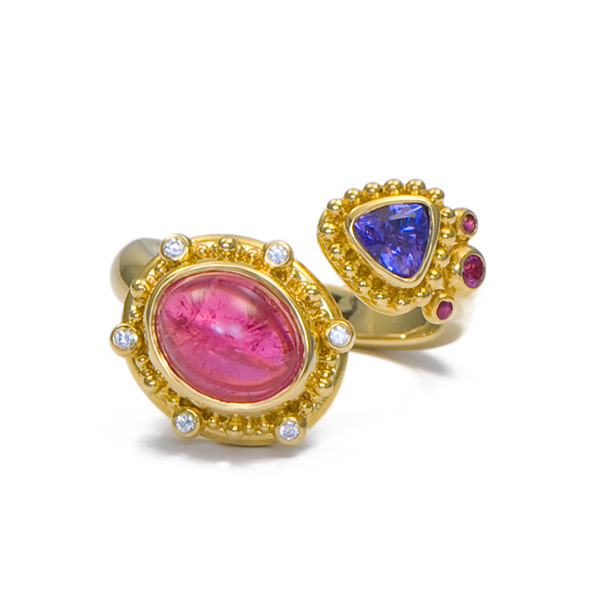 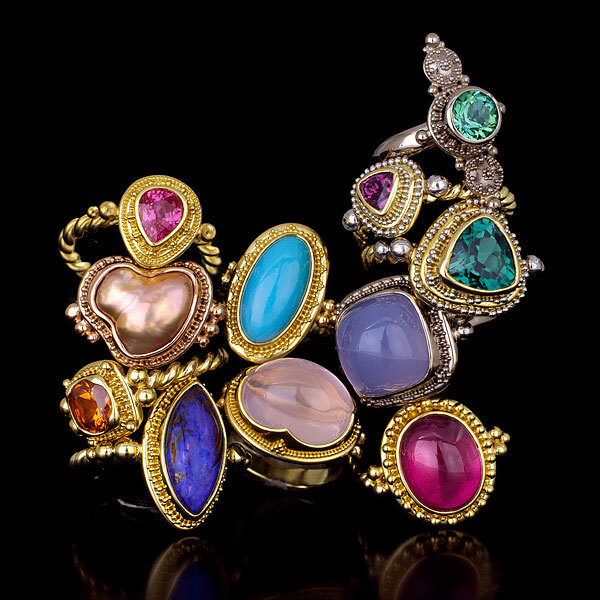 Rings are set with Moonstones, Purple and Pink Sapphires, Rubies and Diamonds in granulated 22kt yellow gold with 18kt yellow gold bands. 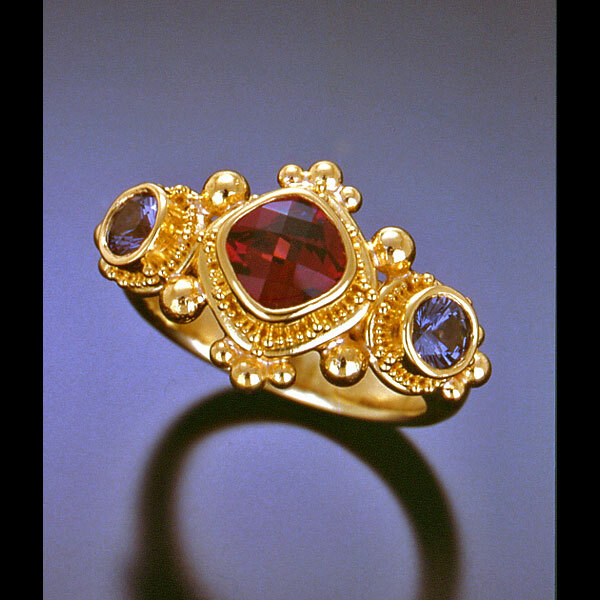 Ring is set with a Grape Garnet and Blue Spinels in granulated 22kt yellow gold with an 18kt yellow gold band. 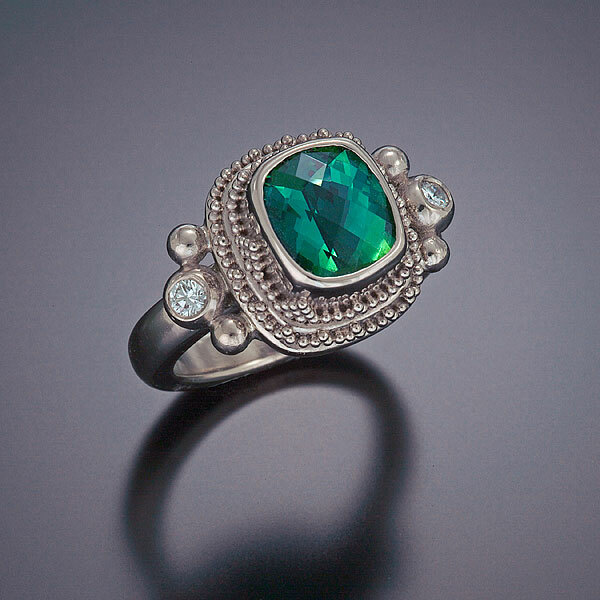 Ring is set with a Seafoam Tourmaline in granulated 22kt white gold. 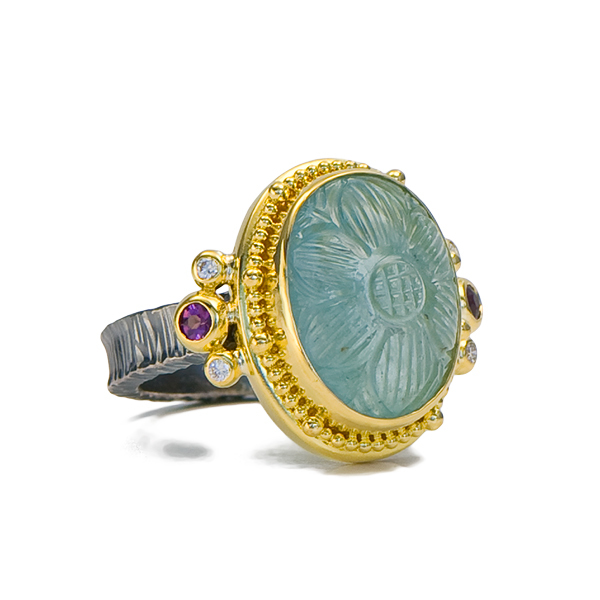 Ring is set with a Blue Chalcedony in granulated 22kt white gold. 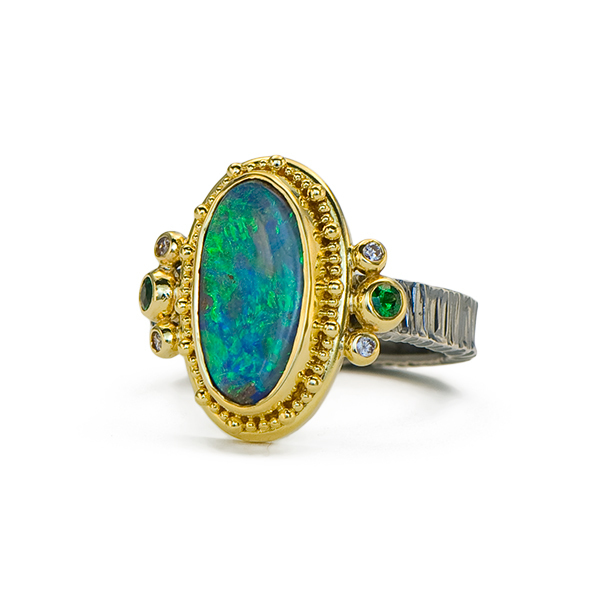 Ring is set with a Boulder Opal in 22kt yellow gold with Platinum granulation and an 18kt yellow gold band. 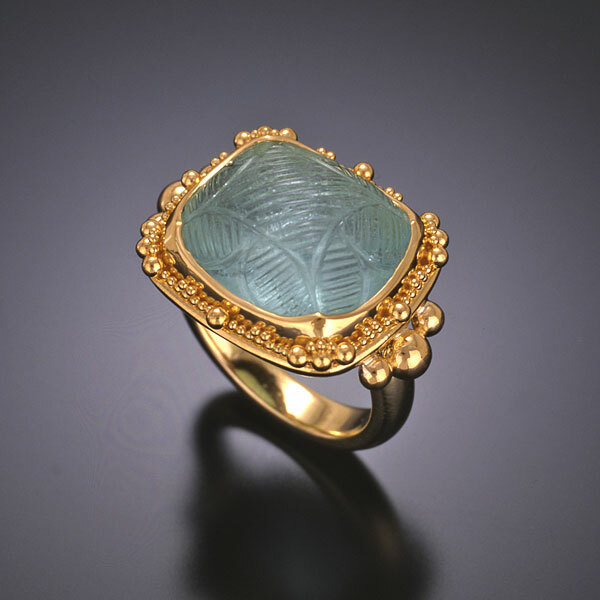 Ring is set with a carved Satin Aquamarine in granulated 22kt yellow gold with an 18kt yellow gold band. 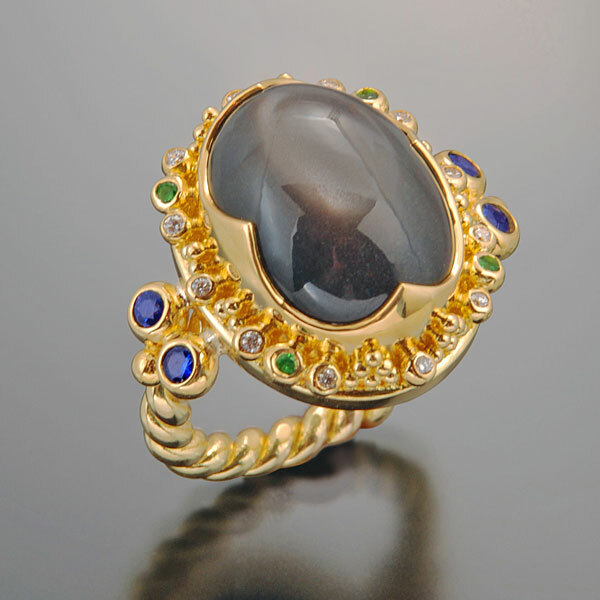 Ring is set with a Black Moonstone, Blue Sapphires, Tsavorite Garnets and Diamonds in granulated 22kt yellow gold with an 18kt yellow gold band. 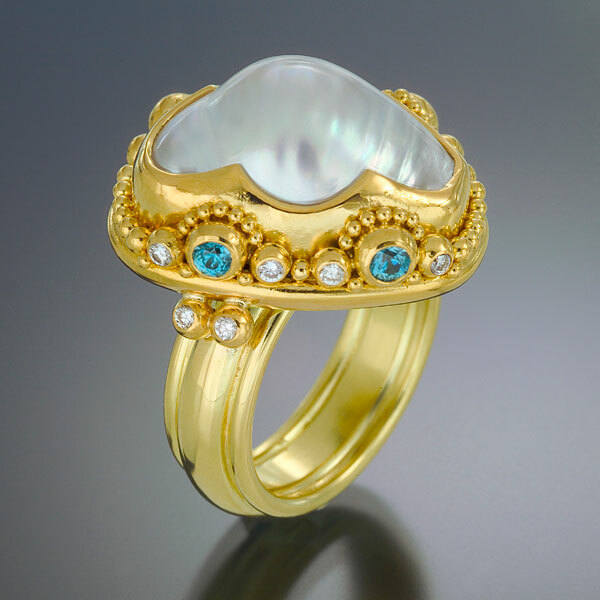 Ring is set with a White South Seas Baroque Pearl, Blue Zircons and Diamonds in granulated 22kt yellow gold with an 18kt yellow gold band. 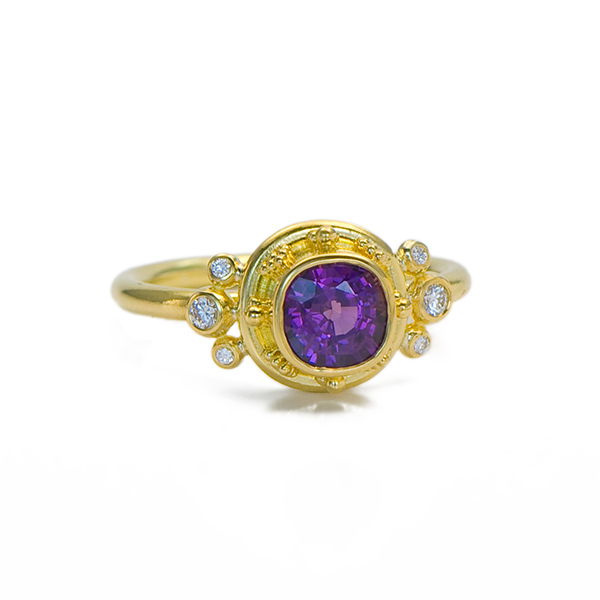 Ring is set with a Purple Sapphire in 22kt yellow gold with Platinum granulation and an 18kt yellow gold band. 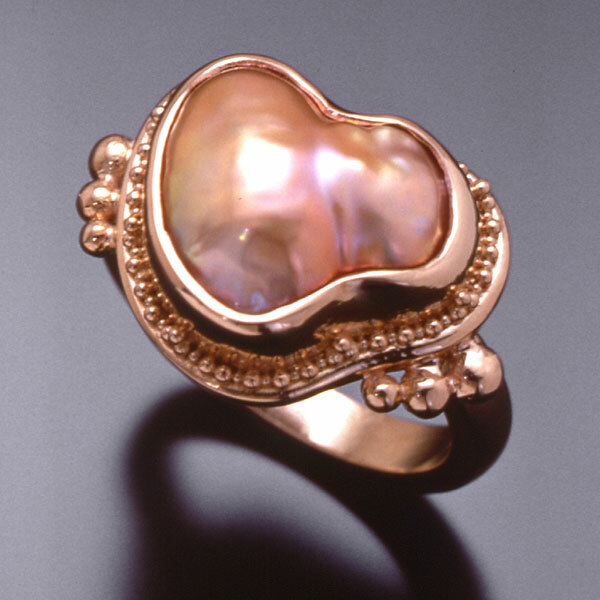 Ring is set with a Peach Freshwater Pearl in granulated 22kt rose gold. 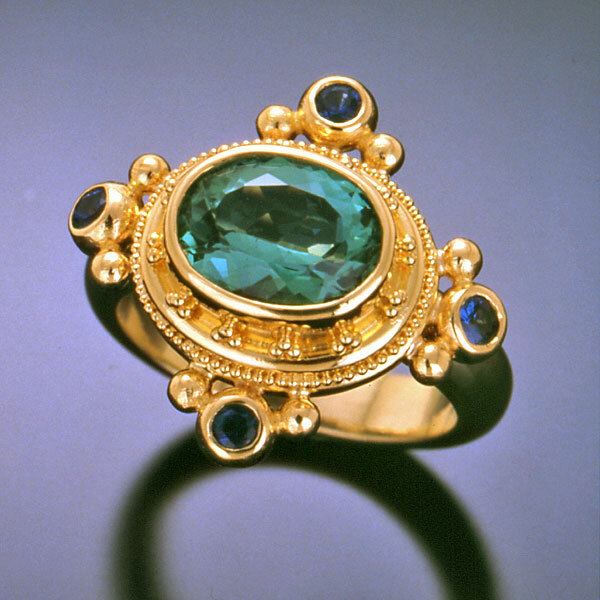 Ring is set with a Blue Zircon, Tsavorite Garnets and Diamonds in granulated 22kt yellow gold with an 18kt yellow gold band. 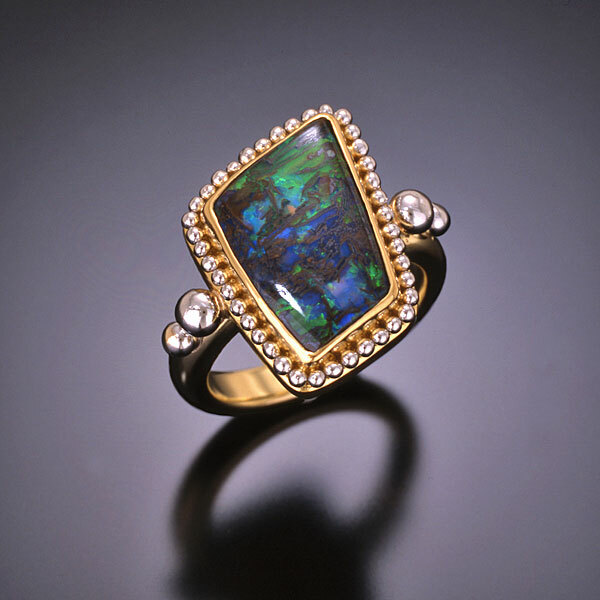 Ring is set with a Mexican Fire Opal in granulated 22kt yellow gold with an 18kt yellow gold band. 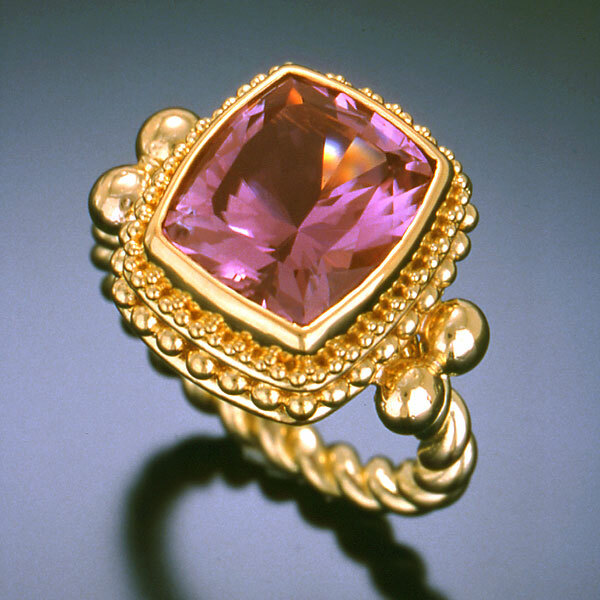 Ring is set with a Pink Tourmaline in granulated 22kt yellow gold with an 18kt yellow gold band. 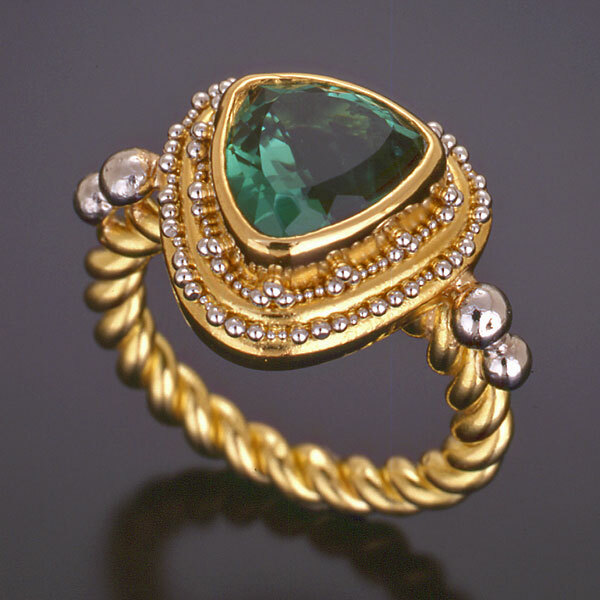 Ring is set with a Green Tourmaline and Labradorites in granulated 22kt yellow gold with an 18kt yellow gold band. 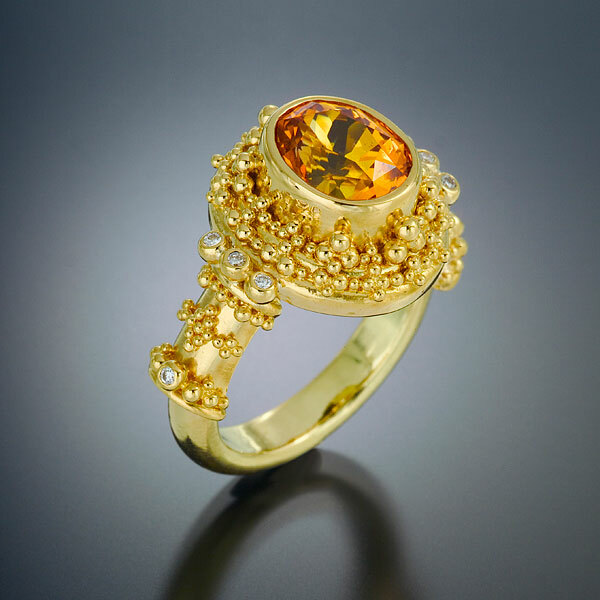 Ring is set with a Chrysoberyl in 22kt yellow gold with Platinum granulation and an 18kt yellow gold band. 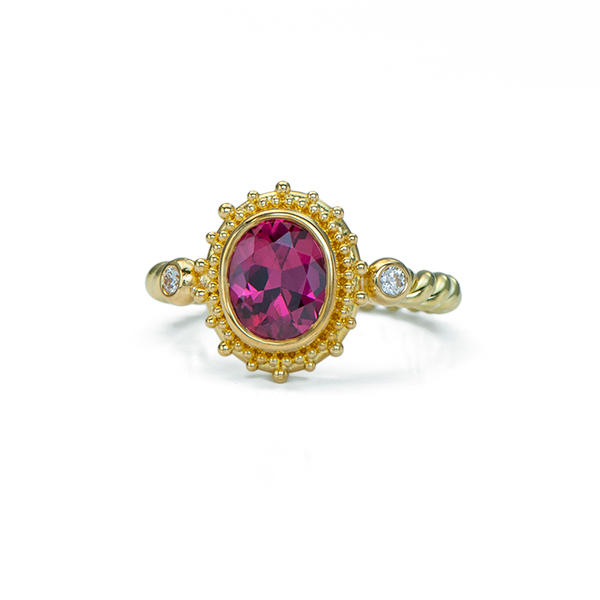 Ring is set with a Magenta Sapphire and Rubies in granulated 22kt yellow gold with an 18kt yellow gold band. 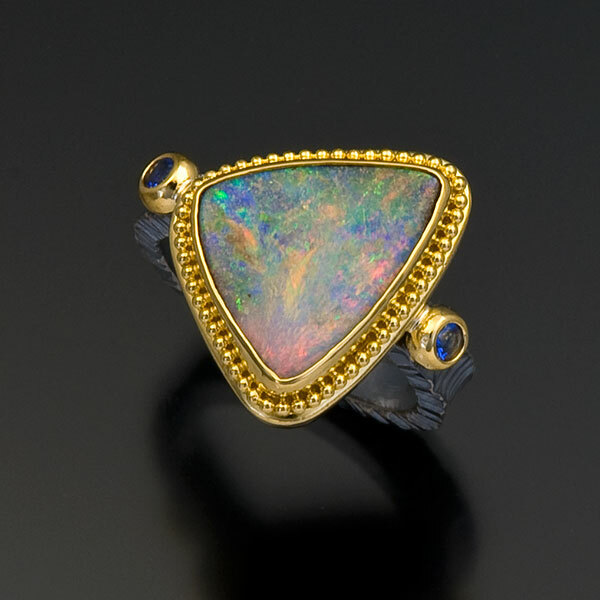 Ring is set with Opalized Petrified Wood in 22kt yellow gold with Platinum granulation and an 18kt yellow gold band. 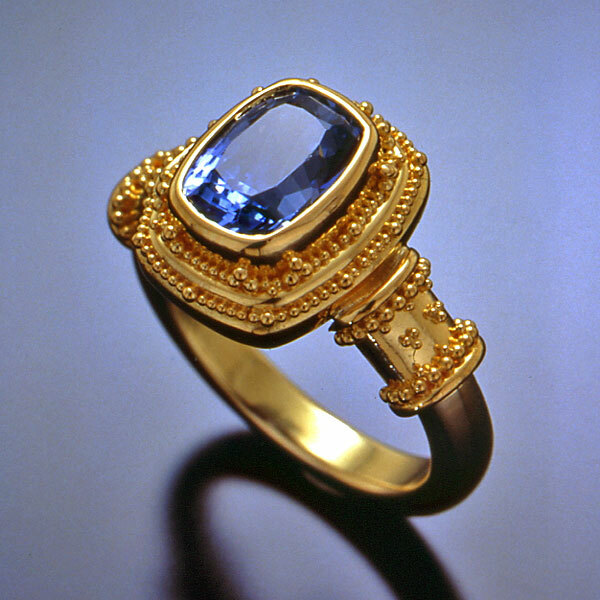 Ring is set with a Blue Sapphire in granulated 22kt yellow gold with an 18kt yellow gold band. 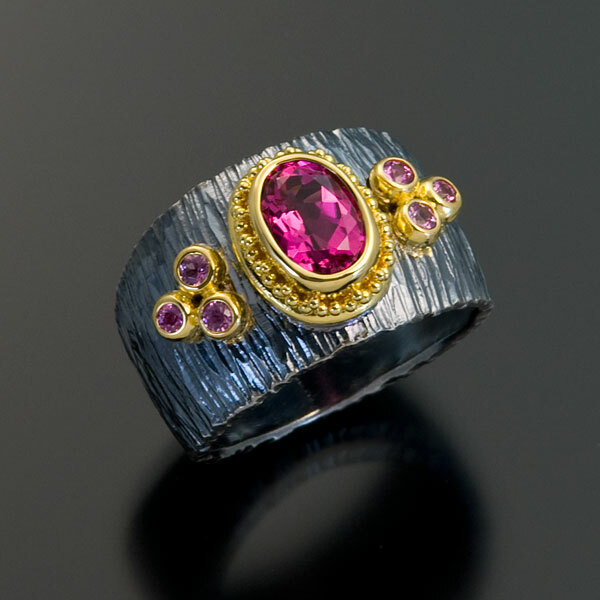 Ring is set with a Pink Tourmaline in granulated 22kt white gold. 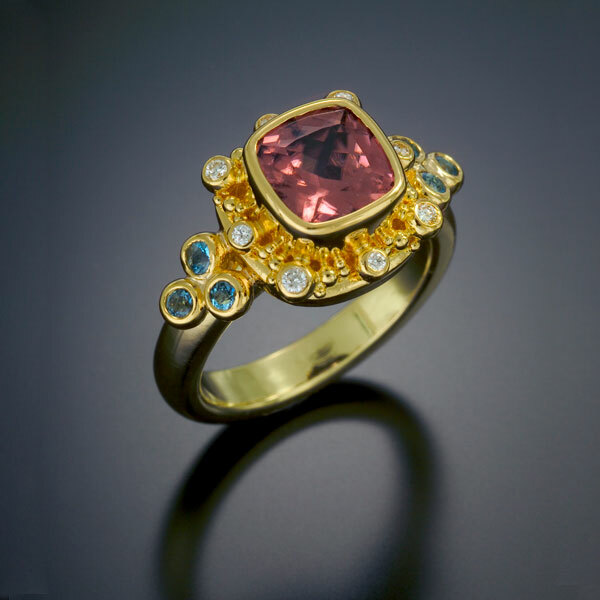 Ring is set with a Pink Spinel, Rubies and Diamonds in granulated 22kt yellow gold with an 18kt yellow gold band. 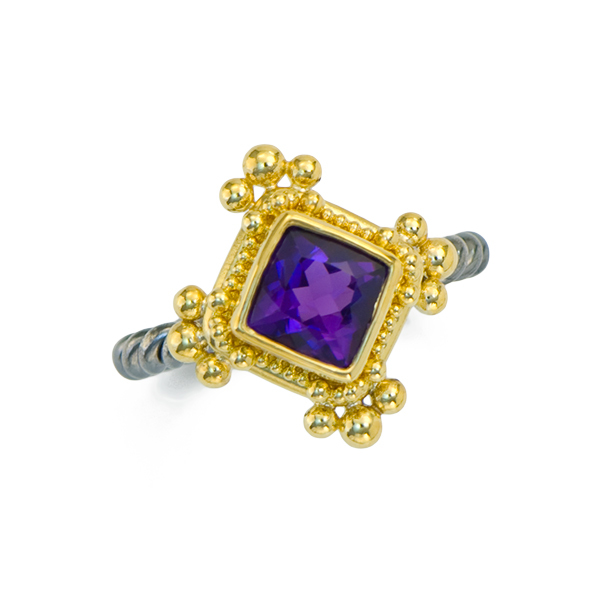 Ring is set with a Blue Sapphire and Violet Sapphires in granulated 22kt yellow gold with an 18kt yellow gold band. 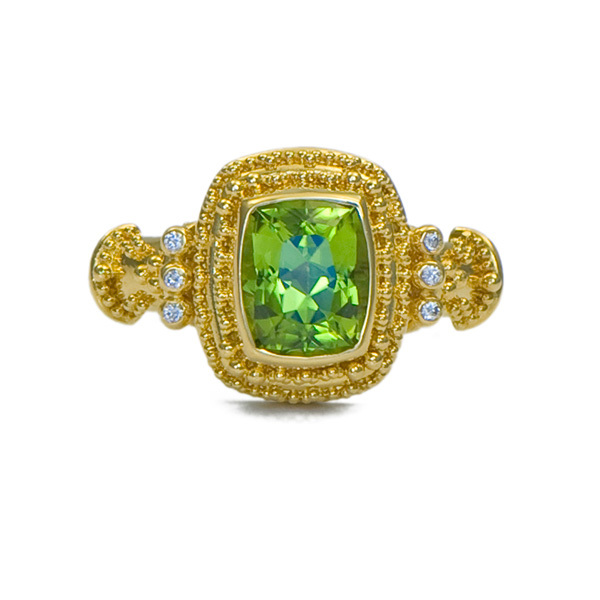 Ring is set with a Peridot in 22kt yellow gold with Platinum granulation and an 18kt yellow gold band. 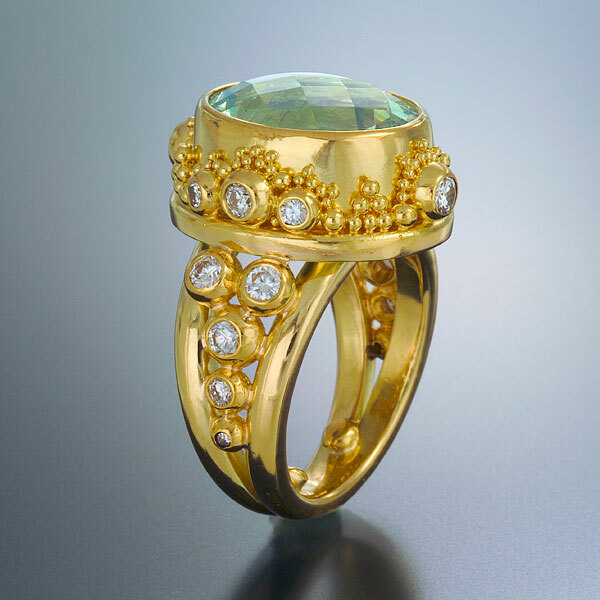 Ring is set with a Green Beryl and Diamonds in granulated 22kt yellow gold with an 18kt yellow gold band. 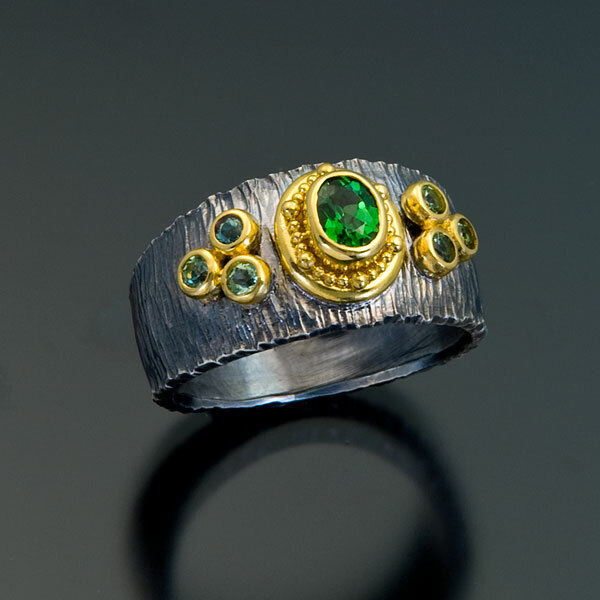 Ring is set with a Green Tourmaline and Diamonds in granulated 22kt white gold. 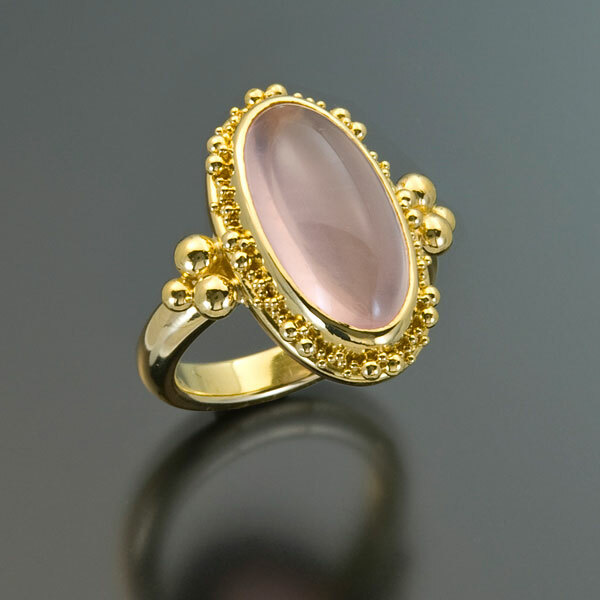 Ring is set with a Pink Sapphire in granulated 22kt yellow gold with an 18kt yellow gold band. 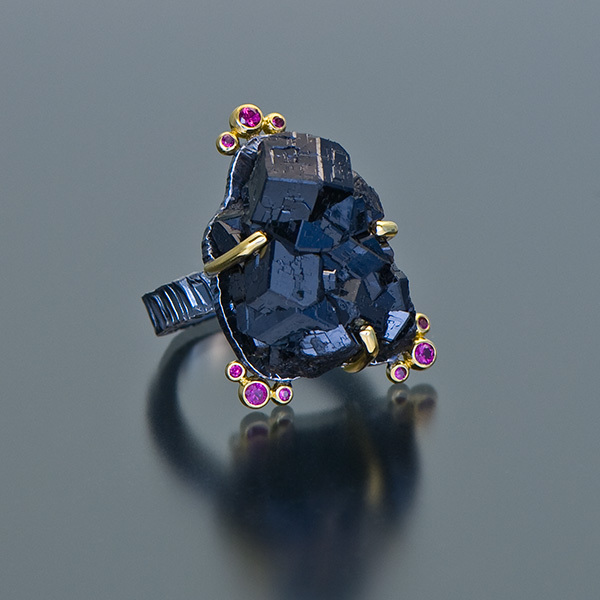 Ring is set with a Lavendar Spinel, Hot Pink Sapphires and Diamonds in granulated 22kt yellow gold with an 18kt yellow gold band. 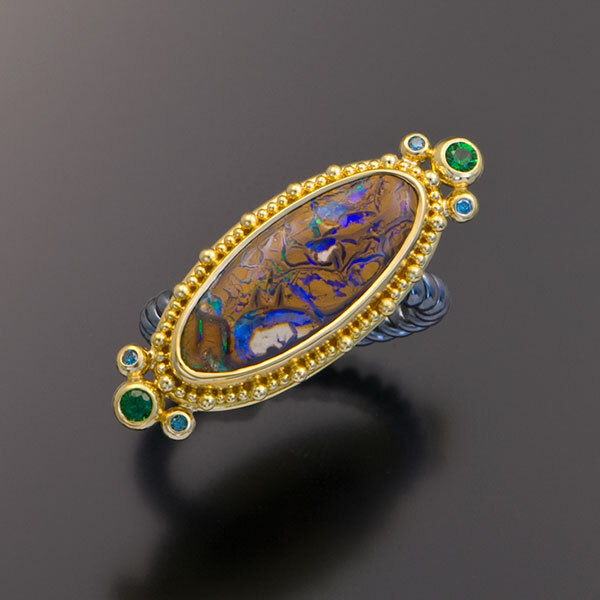 Ring is set with an Australian Boulder Opal, Chrome Tourmaline and Tsavorite Garnet in granulated 22kt yellow gold with an 18kt yellow gold band. 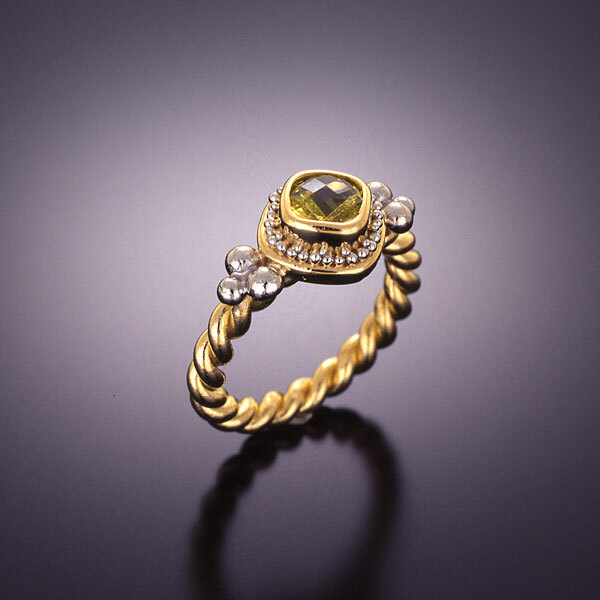 Ring is set with a Yellow Sapphire in granulated 22kt yellow gold with an 18kt yellow gold band. 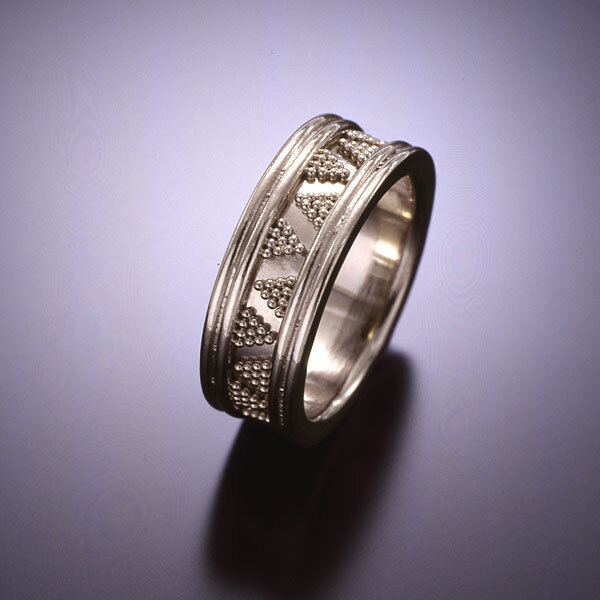 Wedding band is in granulated 22kt white gold, 8mm wide. 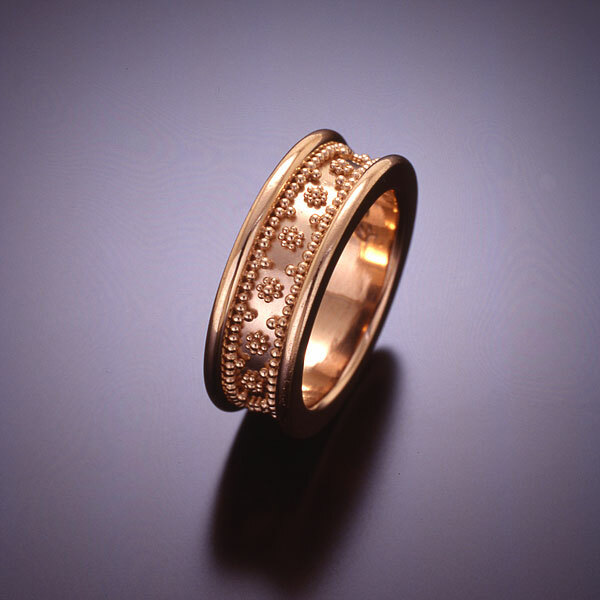 Wedding Band is in granulated 22kt rose gold, 7mm wide. 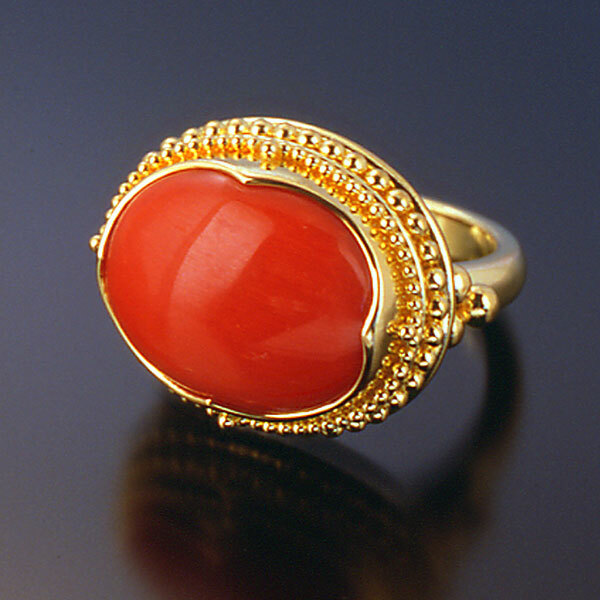 Ring is set with Sardinian Coral in granulated 22kt yellow gold with an 18kt yellow gold band. 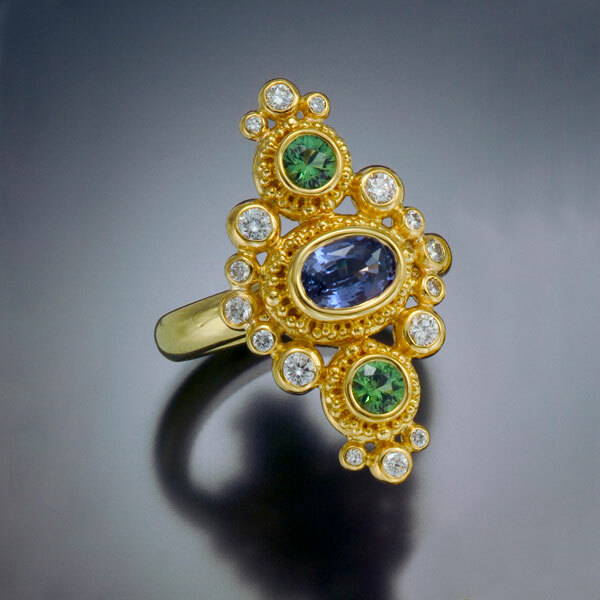 Ring is set with a Diamond, Rubies, Sapphires and Tsavorite Garnets in 22kt yellow gold with 22kt yellow gold and Platinum granulation and an 18kt yellow gold inner sleeve. 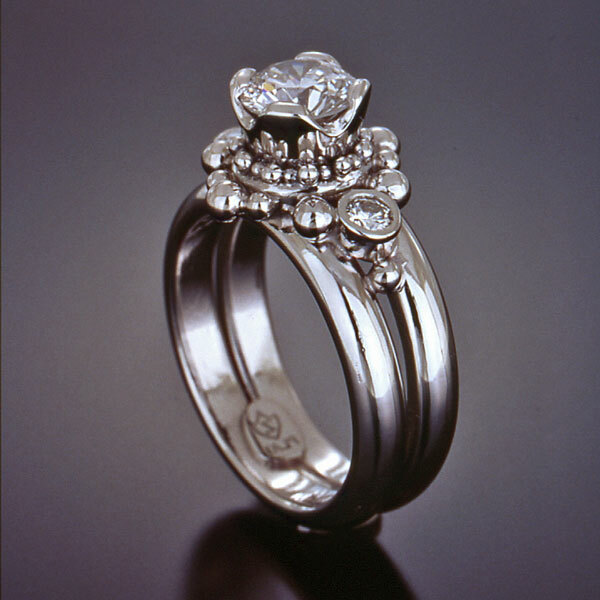 Ring is set with Diamonds in granulated Platinum. 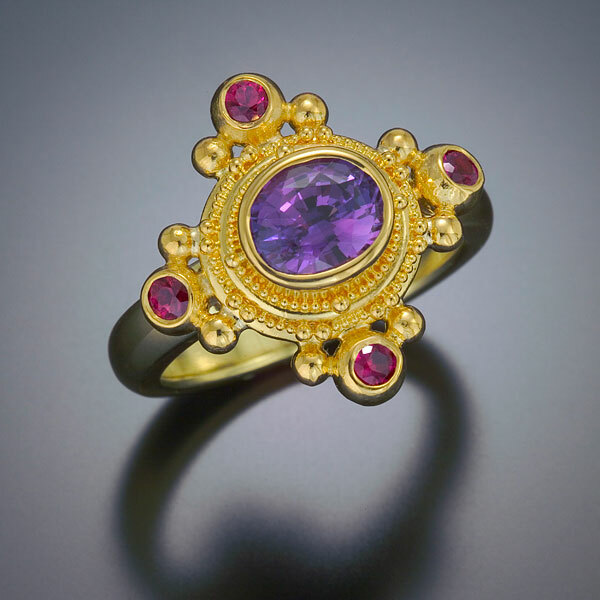 Ring is set with a Rubellite Tourmaline and Tanzanites in granulated 22kt yellow gold with an 18kt yellow gold band. 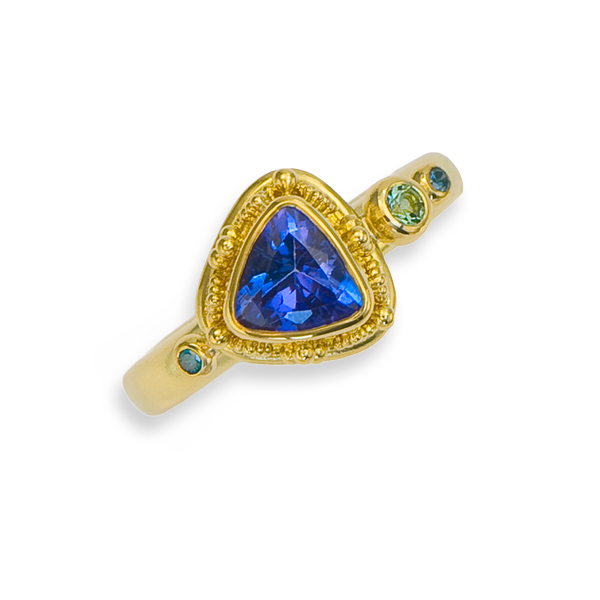 Ring is set with a Blue Topaz, Blue Sapphires, Hot Pink Sapphires, Diamonds and Blue Zicons in granulated 22kt yellow gold with an 18kt yellow gold inner sleeve. 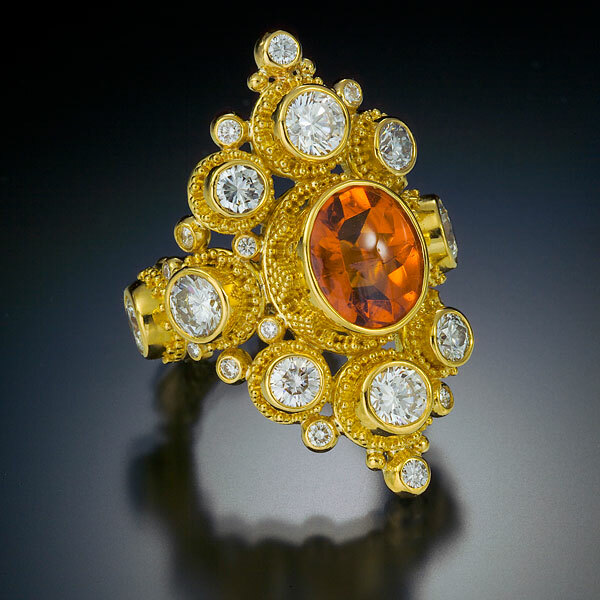 Ring is set with a Mandarin Garnet and Diamonds in granulated 22kt yellow gold with an 18kt yellow gold inner sleeve. 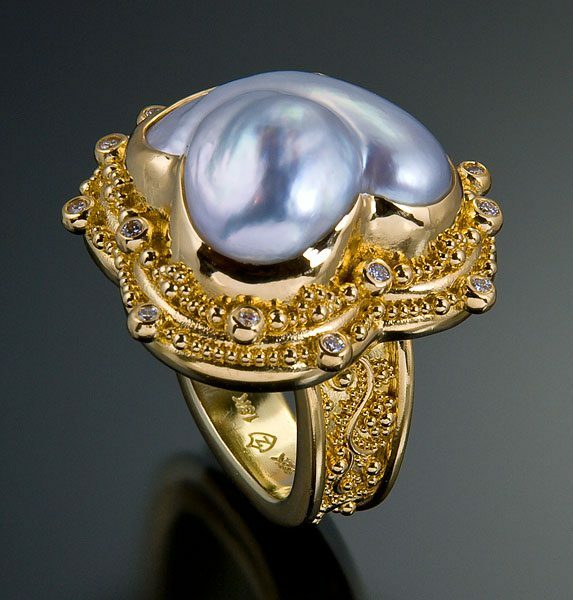 Ring is set with a South Seas Baroque Pearl and Diamonds in granulated 22kt yellow gold with an 18kt yellow gold inner sleeve. 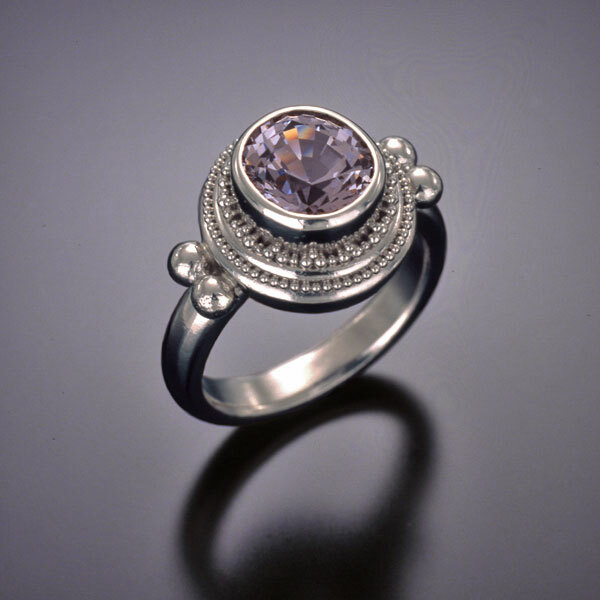 Ring is set with a Diamond in granulated Platinum. 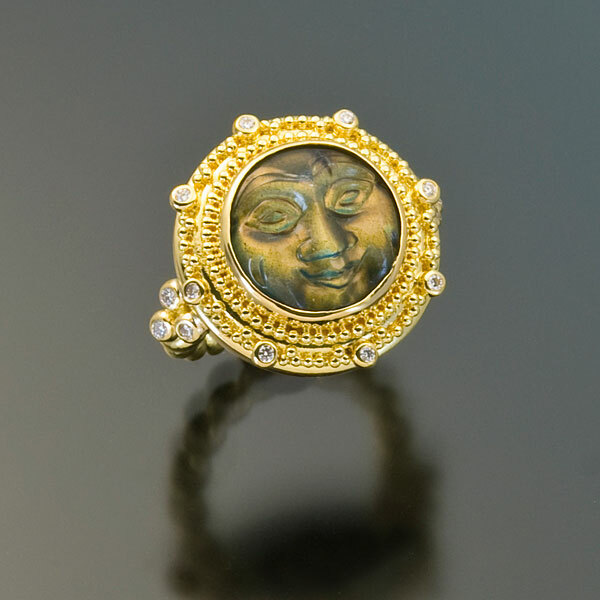 Ring is set with a carved Labradorite “Man in the Moon” and Diamonds in granulated 22kt yellow gold with an 18kt yellow gold band. 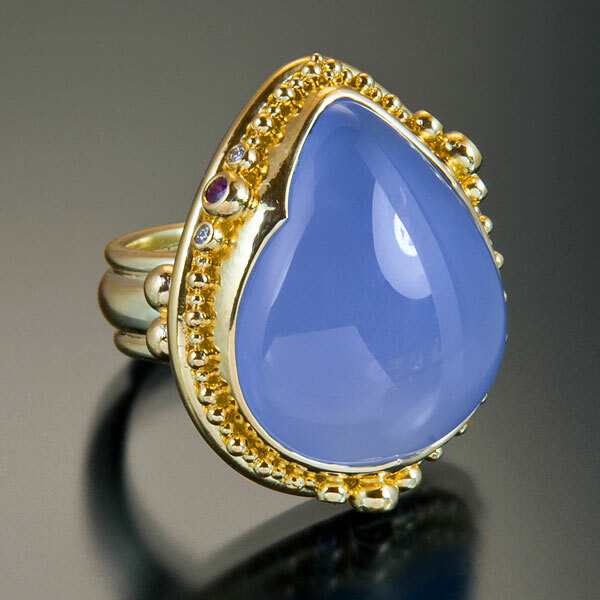 Ring is set with a Blue Chalcedony, Pink Sapphires and Diamonds in granulated 22kt yellow gold with an 18kt yellow gold band. 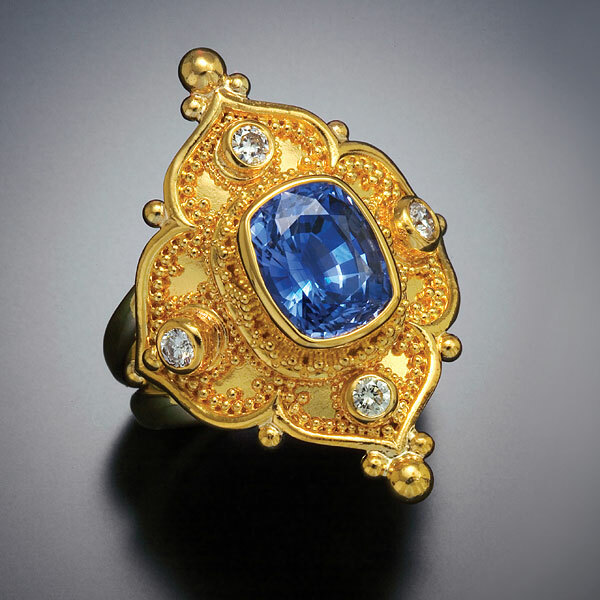 Ring is set with a Blue Sapphire and Diamonds in granulated 22kt yellow gold with an 18kt yellow gold band. 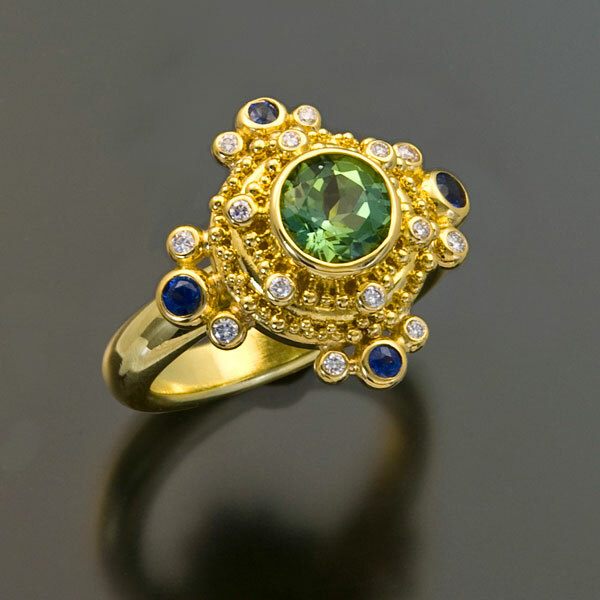 Ring is set with a Tsavorite Garnet and Alexandrites in 22kt yellow gold with 22kt yellow gold and Platinum granulation and an 18kt yellow gold inner sleeve. 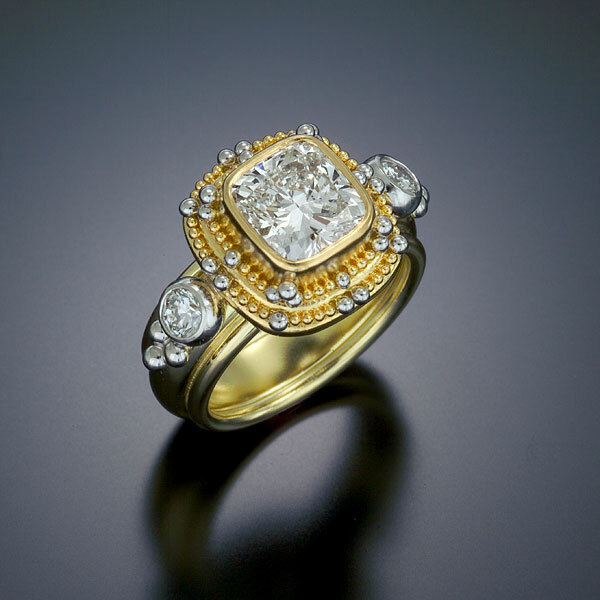 Ring is set with Diamonds in granulated 22kt yellow gold with an 18kt yellow gold band. 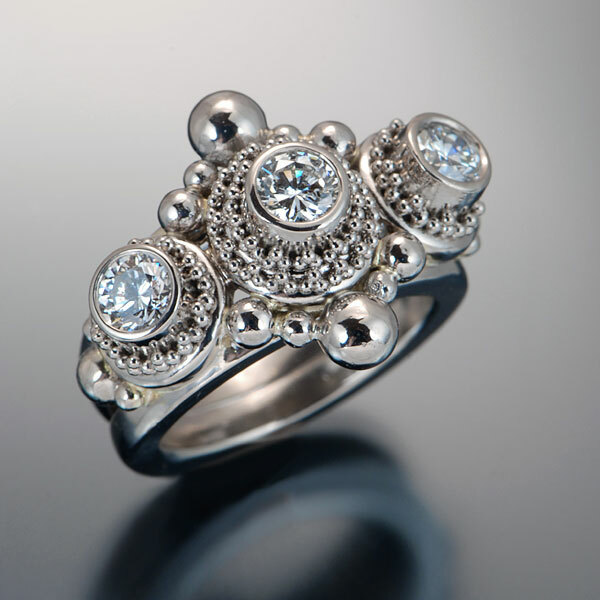 Ring is set with Diamonds in granulated 22kt white gold. 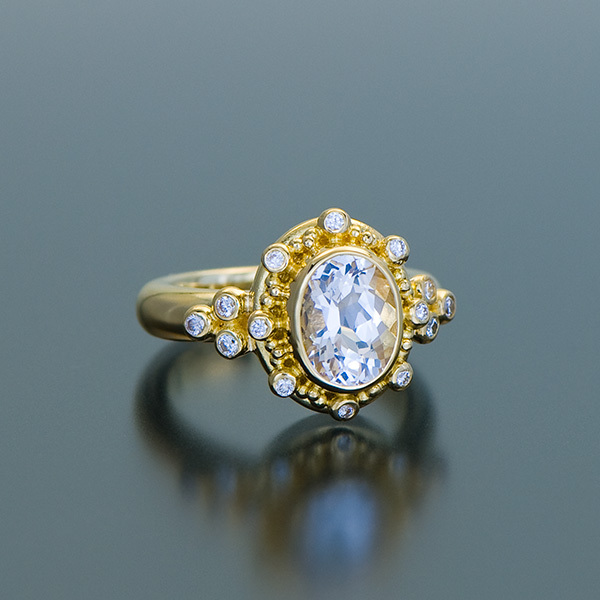 Ring is set with a cushion-cut diamond in 22kt yellow gold with 22kt yellow gold and platinum granulation, the side diamonds are set in Platinum and the band is in 22kt yellow gold. 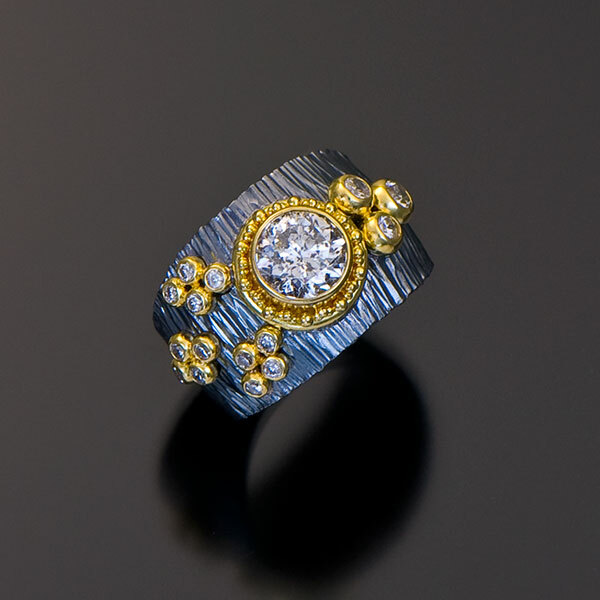 Ring is set with a Diamond in 22kt yellow gold with Platinum granulation and an 18kt yellow gold band. 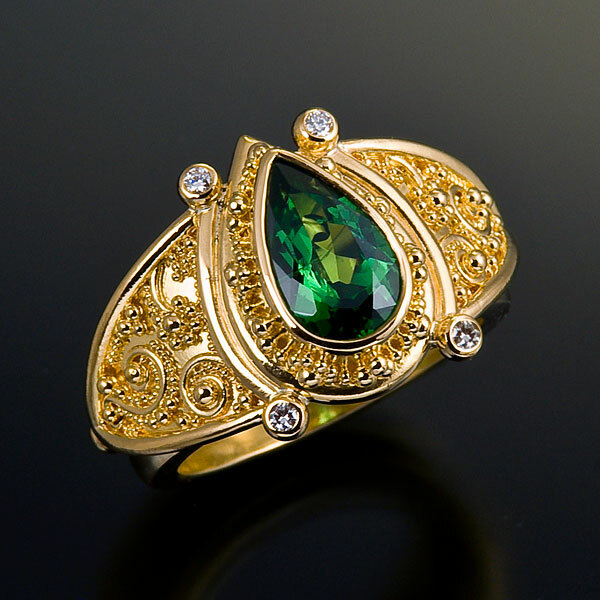 Ring is set with a Tsavorite Garnet and Diamonds in granulated 22kt yellow gold with an 18kt yellow gold band. 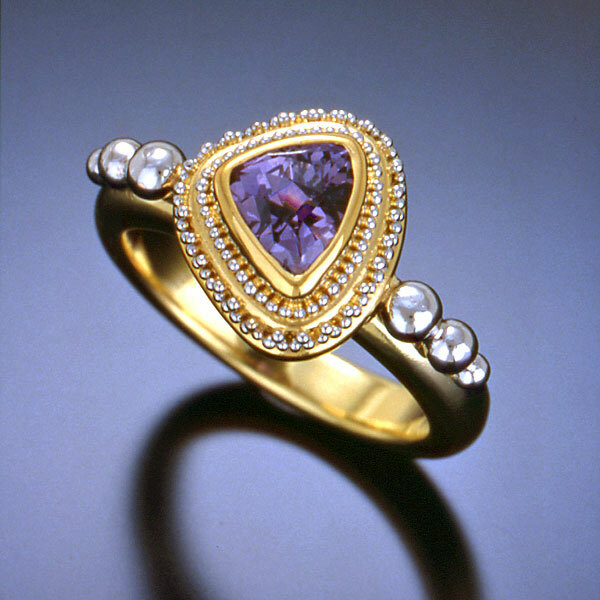 Ring is set with a Pink Spinel, Pink and Purple Sapphires and Diamonds in granulated 22kt yellow gold with an 18kt yellow gold band. 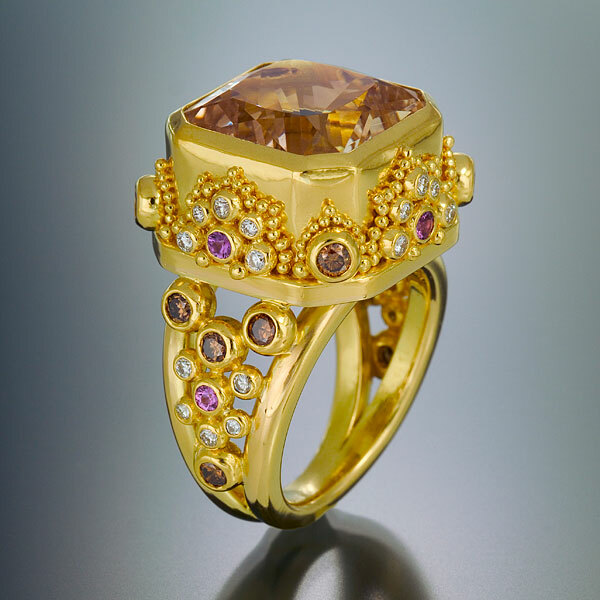 Ring is set with a Citrine, Pink and Purple Sapphires and Diamonds in granulated 22kt yellow gold with an 18kt yellow gold band. 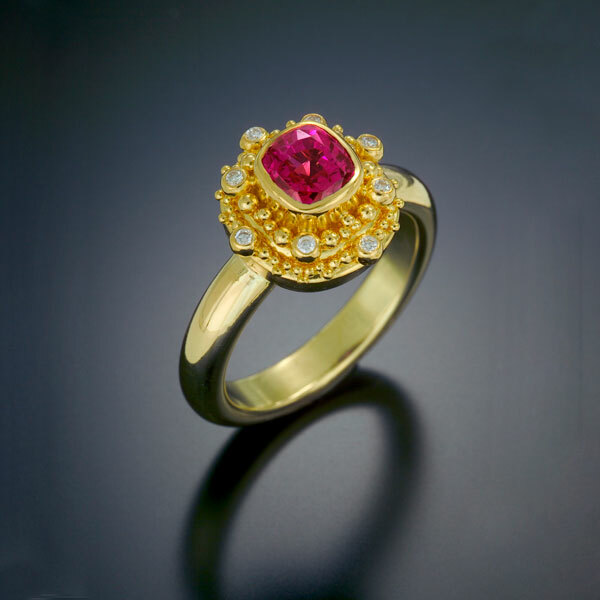 Ring is set with a Ruby in 22kt yellow gold with Platinum granulation and an 18kt yellow gold band. Ring is set with a Purple Sapphire (.12tcw) and Magenta Sapphires (.32tcw) in granulated 22kt yellow gold on a hand forged and oxidzed sterling silver band, 8mm wide. 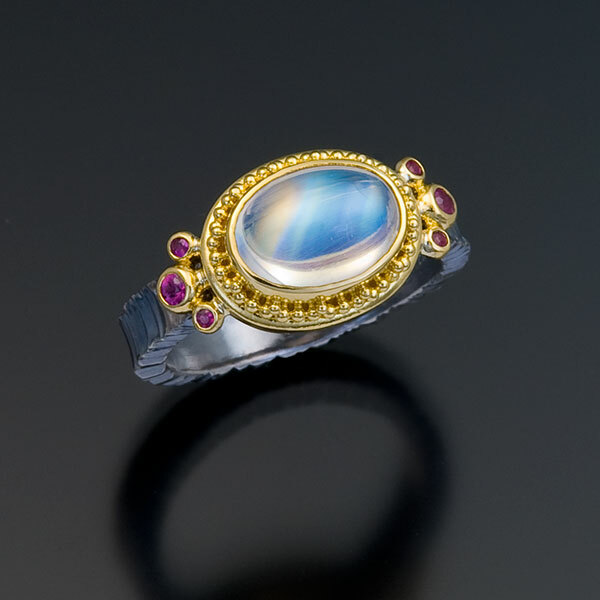 Ring is set with a Moonstone (4.17cts), Hot Pink Sapphires (.09tcw) and Blue Zircons (.30tcw) in granulated 22kt yellow gold on a forged and oxidized sterling silver band, .675″ L x .875″ W x 1.25″ D.
Ring is set with a Blue Sapphire (.80tcw) and Diamonds (.14tcw) in granulated 22kt yellow gold with a forged and oxidized sterling silver band. 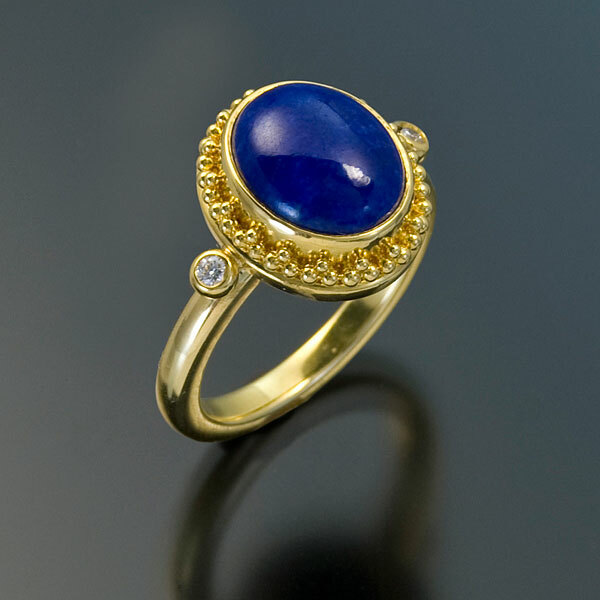 Ring is set with Lapis (12x10mm) and Diamonds (.08tcw) in granulated 22kt yellow gold with an 18kt yellow gold band, 1″ W x .5″ L x 1″ D.
Ring is set with three Diamonds (center: 2.01cts, sides: .12tcw), the center stone has 22kt yellow gold and platinum granulation on the 22kt yellow gold bezel and the 22kt yellow gold band is in the Tuscan Garden style, granulated in 22kt yellow gold and platinum with an 18kt yellow gold inner sleeve. 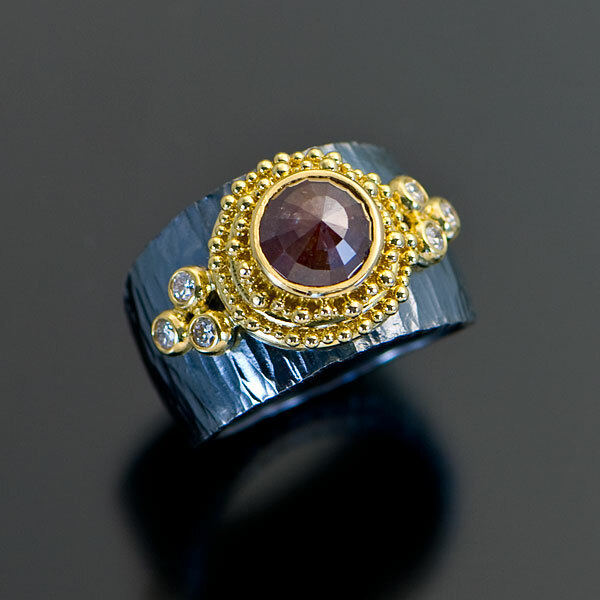 Tapered band width is 6.5 to 11 mm. 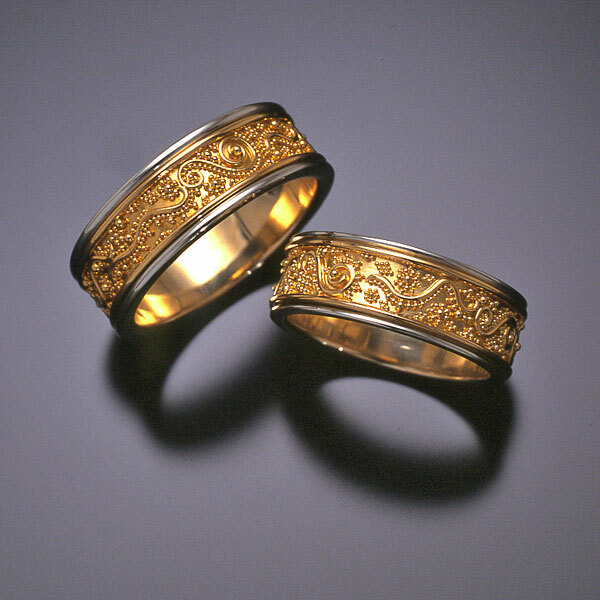 The wedding bands are patterned in the Tuscan Garden style, granulated in 22kt yellow gold with Platinum outer rails and have 18kt yellow gold inner sleeves. 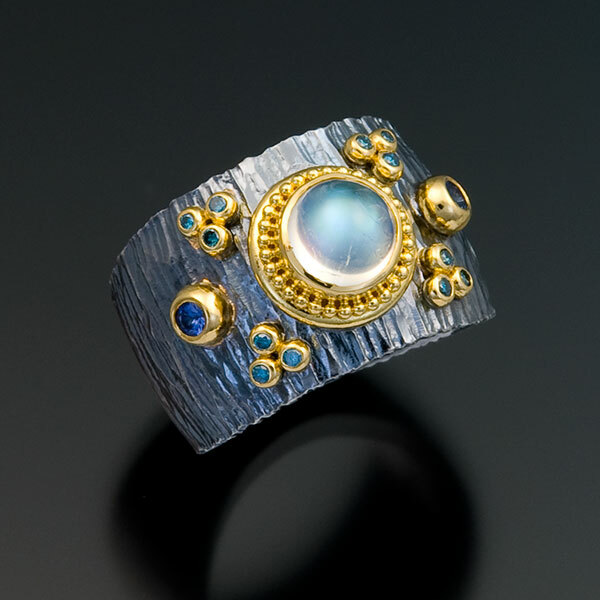 Band widths are 7mm. 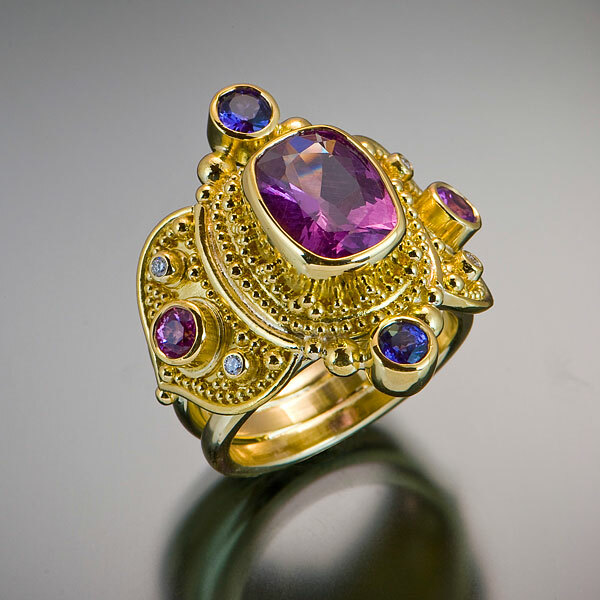 Ring is set with a Lilac Sapphire (1.7cts), Magenta Sapphires (.28tcw) and Purple Sapphires (.14tcw) in granulated 22kt yellow gold with an 18kt yellow gold band. 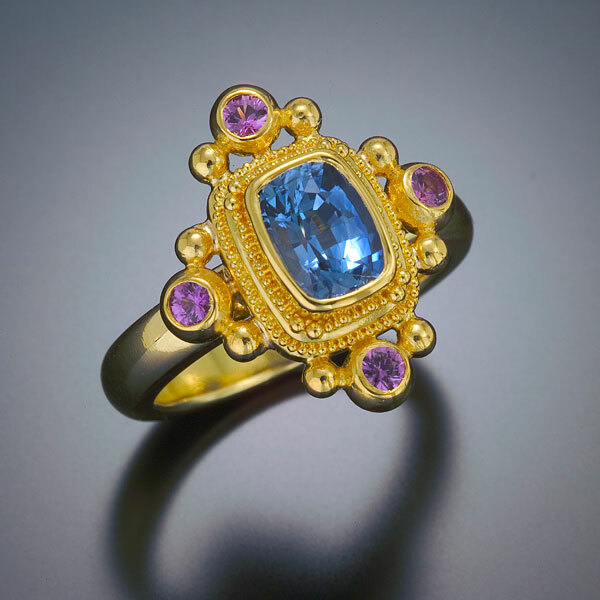 Ring is set with an Aquamarine (14.39cts), Purple Sapphires (.15tcw), Blue Sapphires (.36tcw), Blue Zircons (.61tcw) and Diamonds (.26tcw) in granulated 22kt yellow gold with an 18kt yellow gold band. 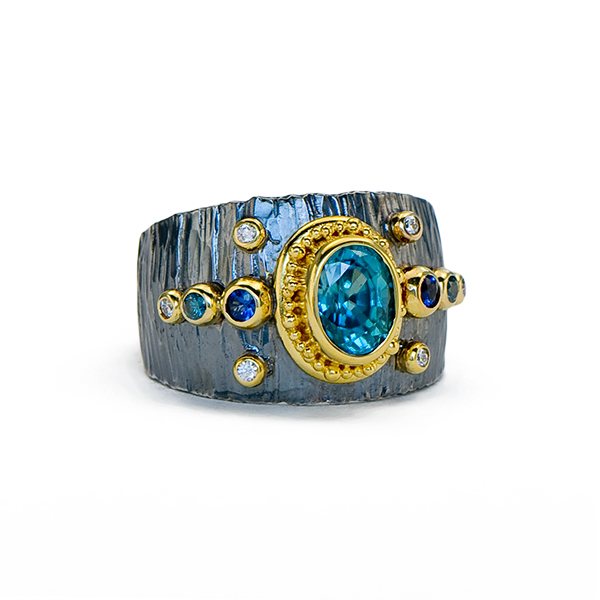 .875″L x .875″W x .5″D.